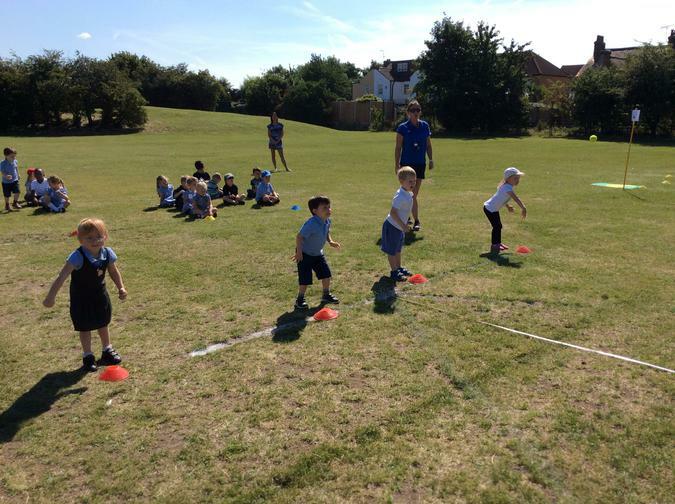 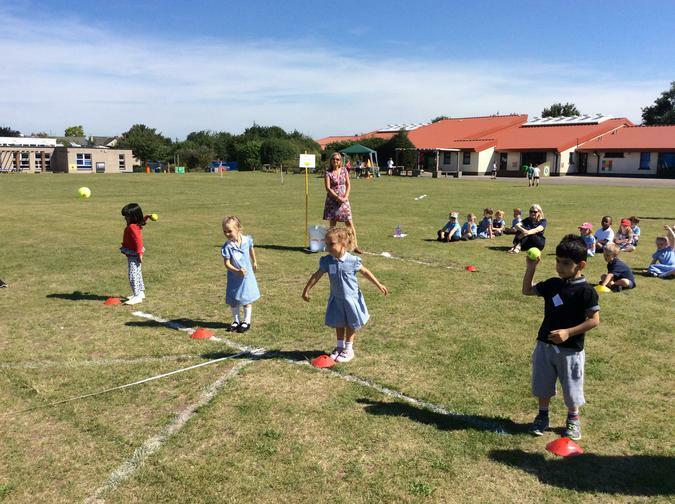 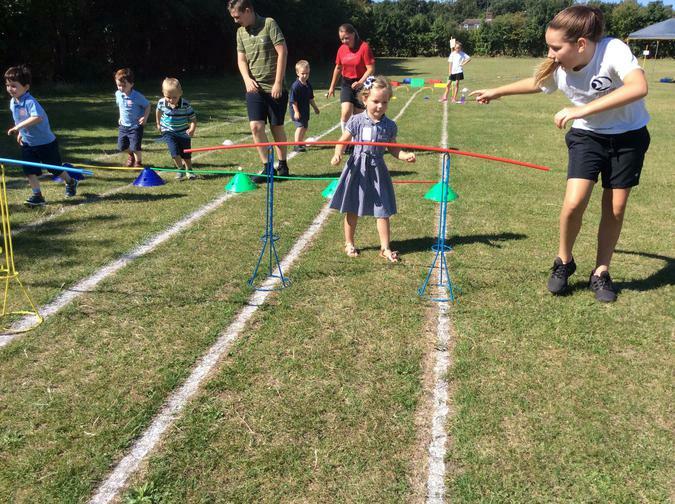 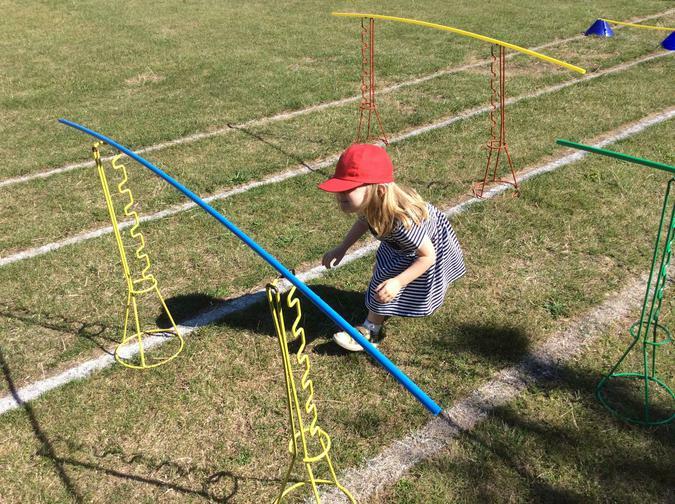 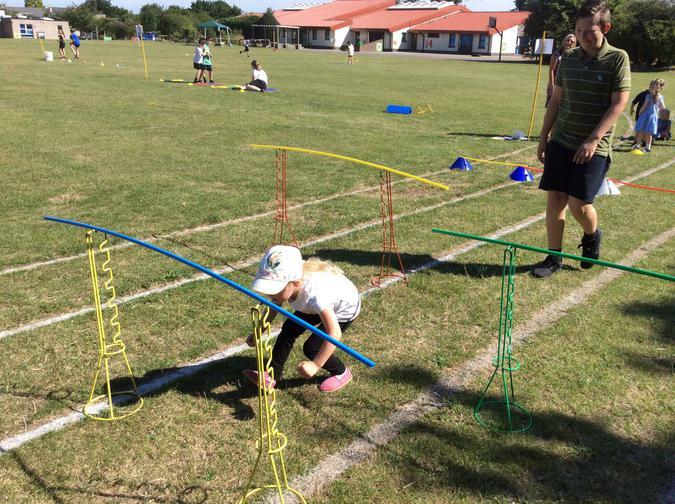 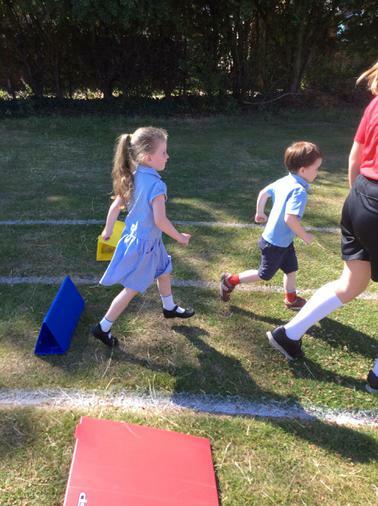 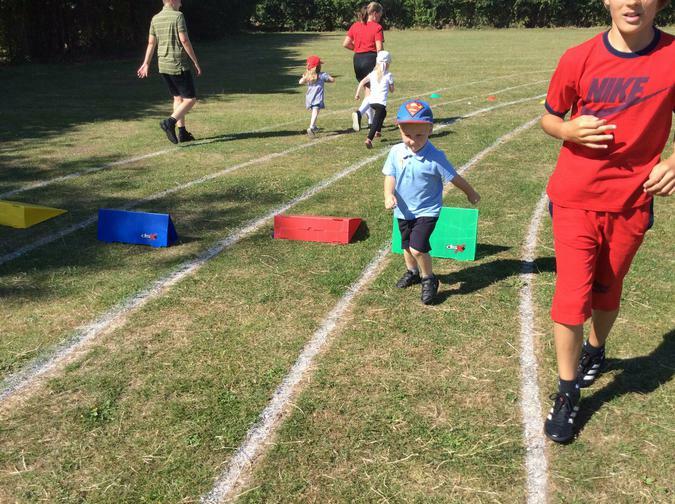 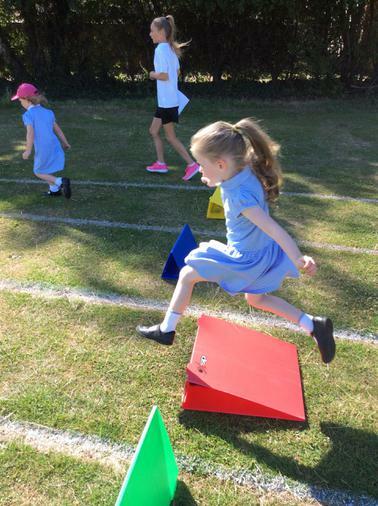 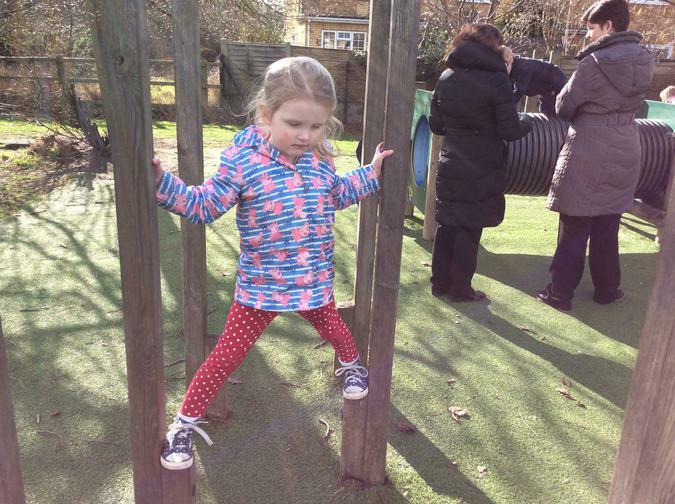 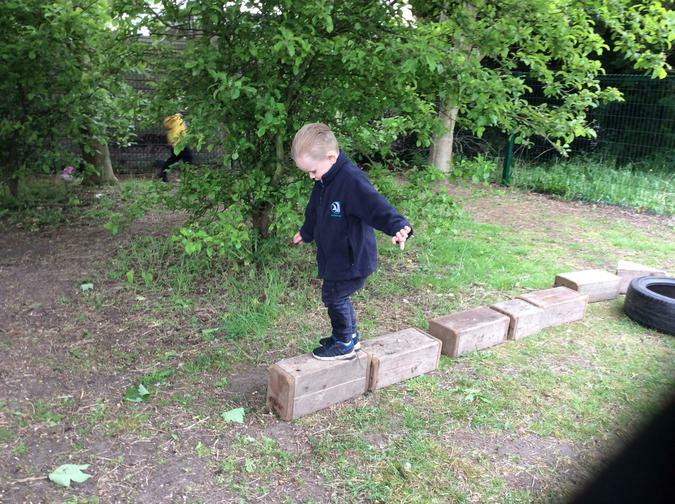 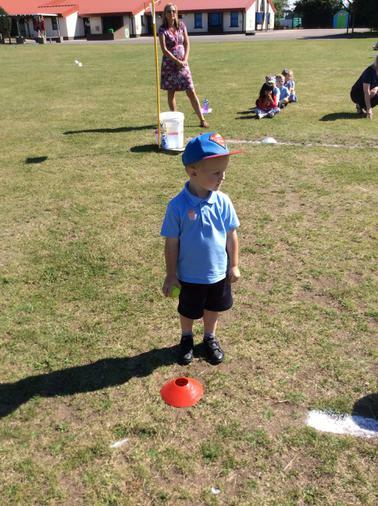 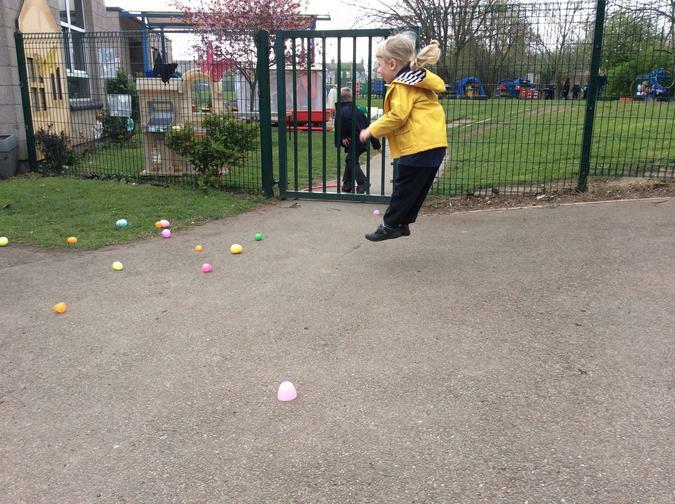 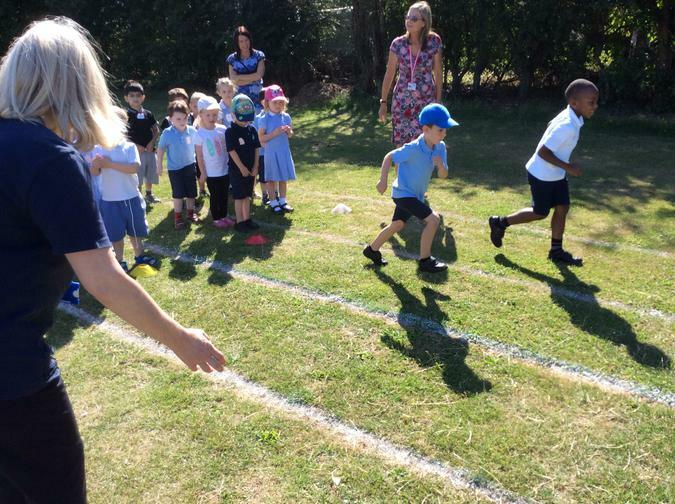 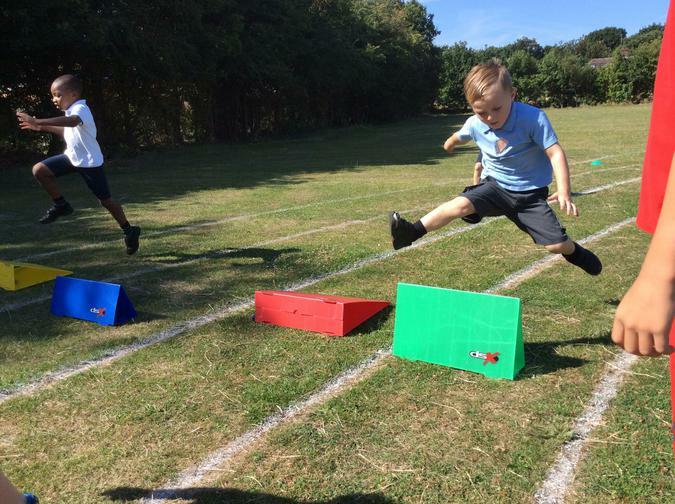 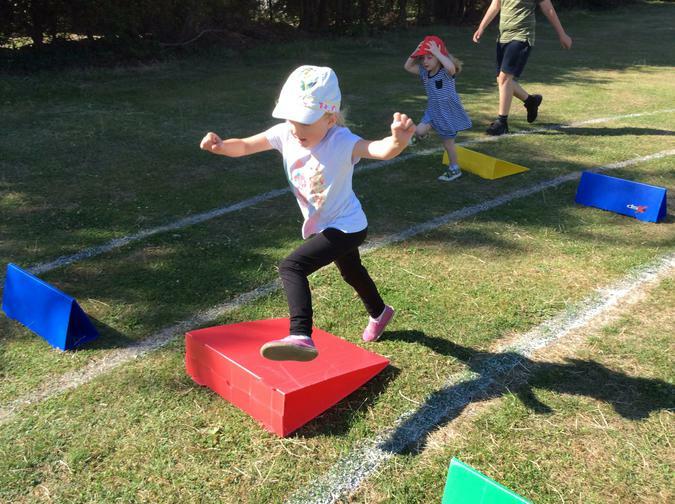 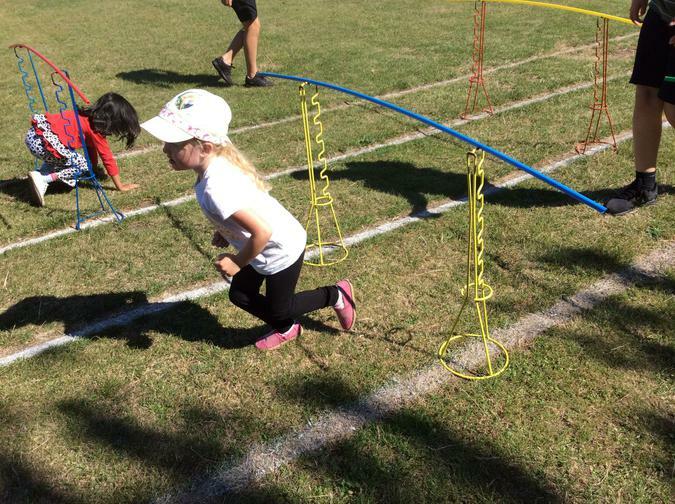 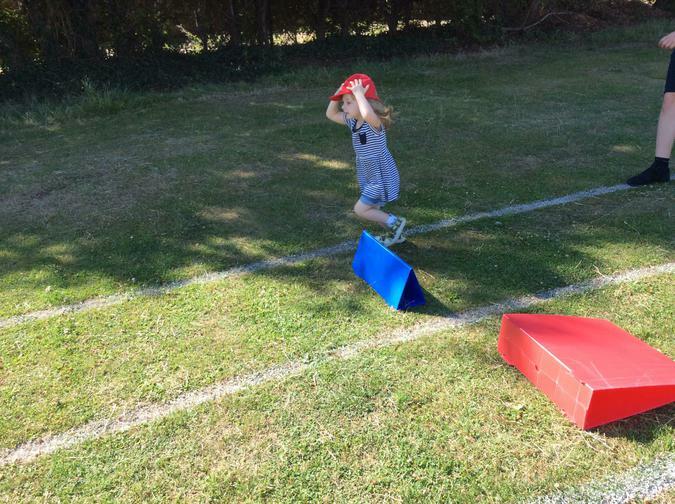 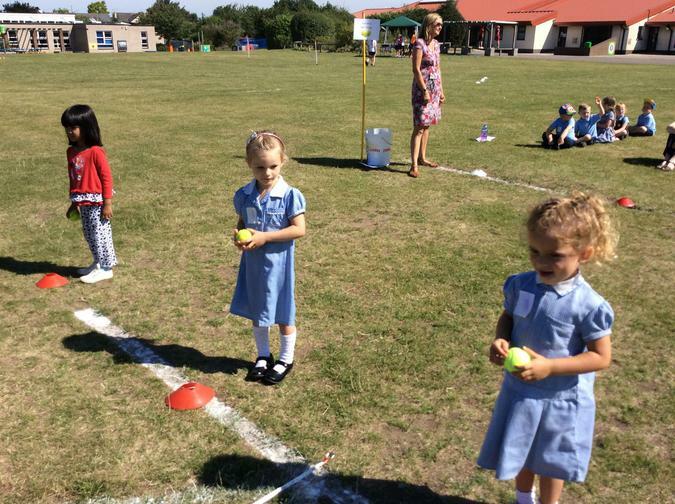 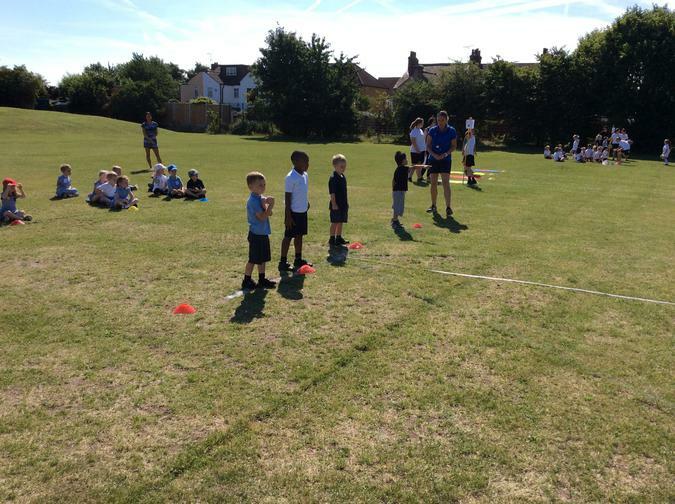 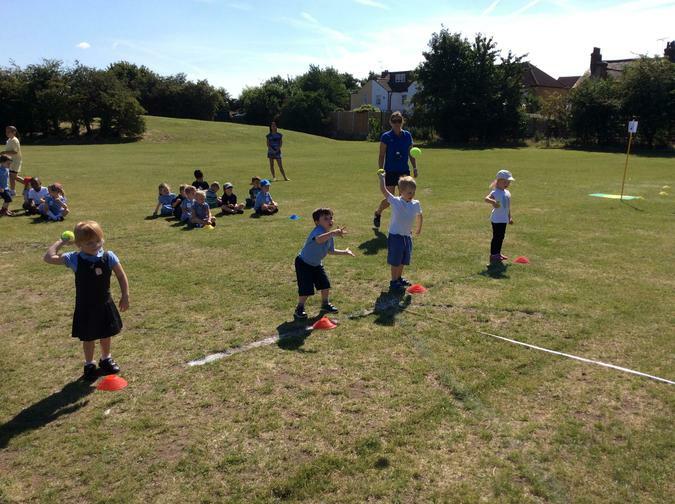 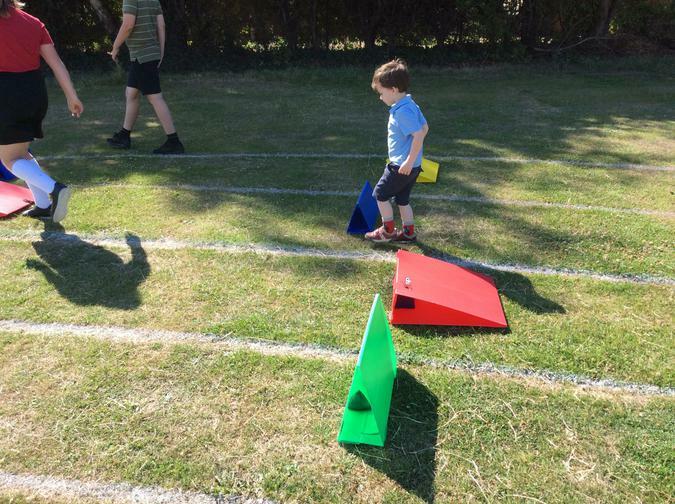 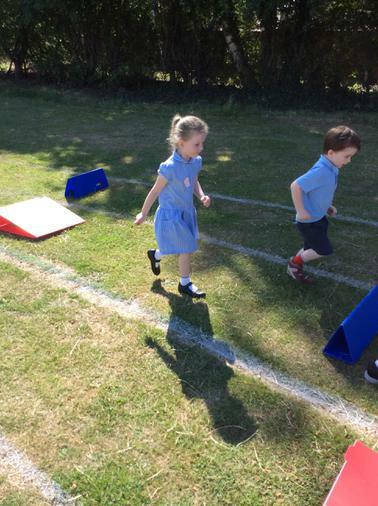 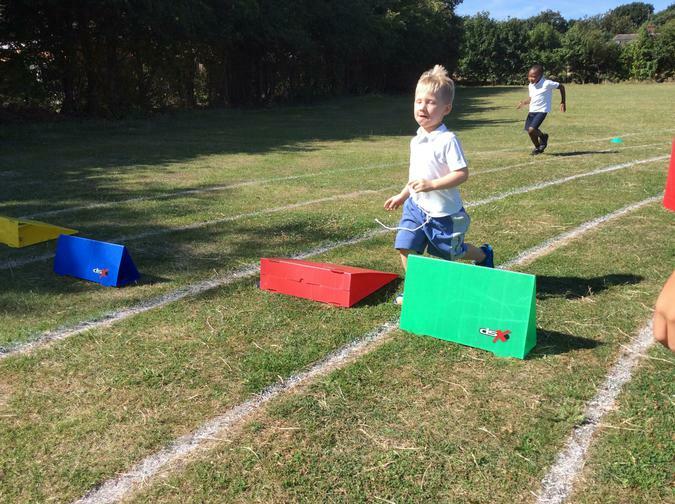 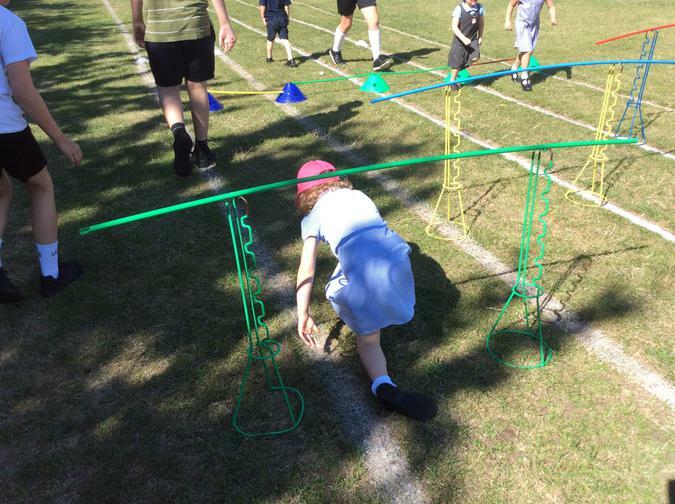 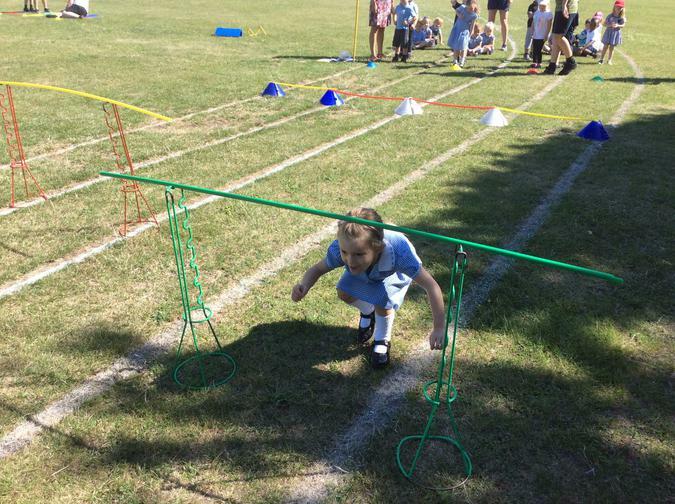 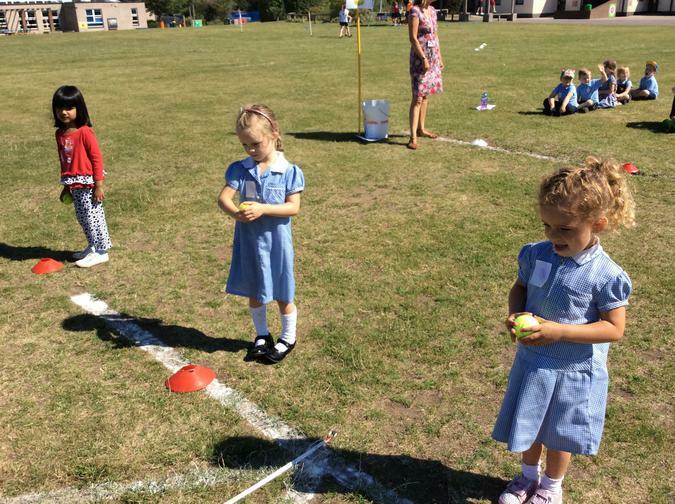 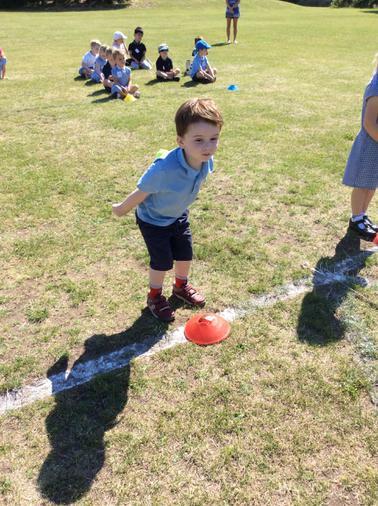 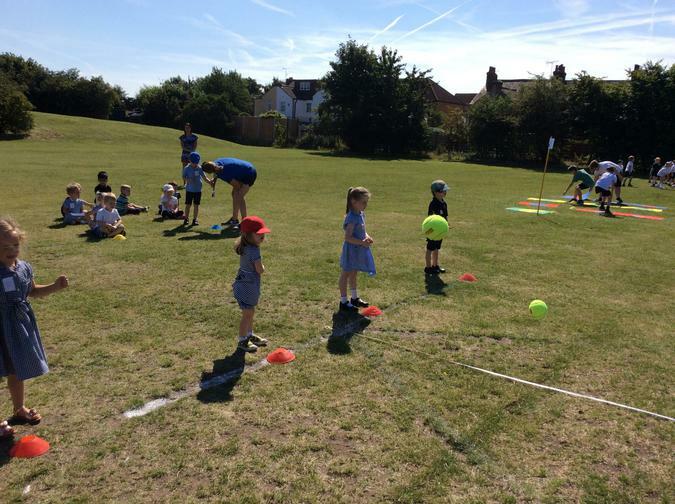 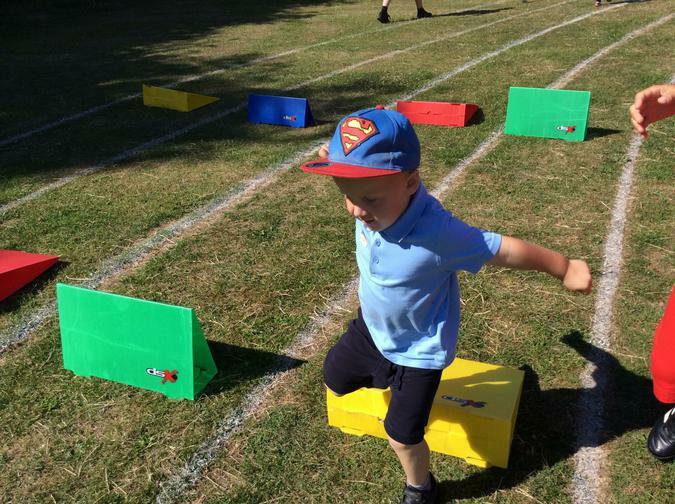 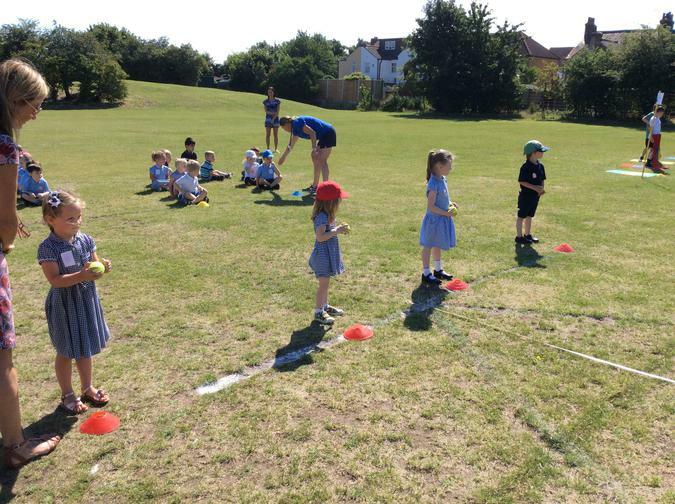 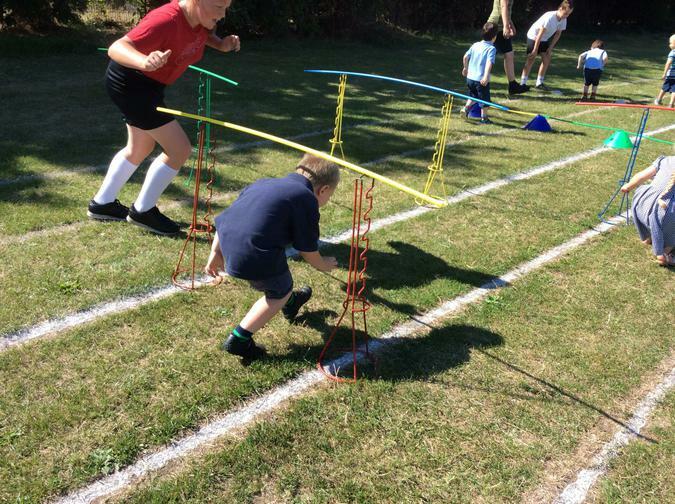 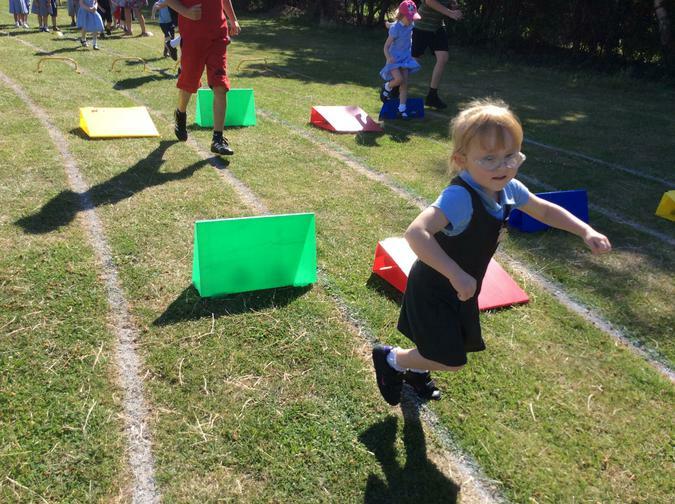 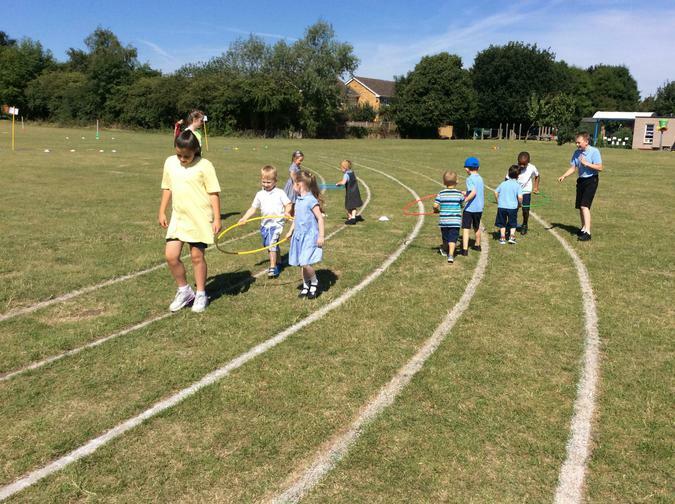 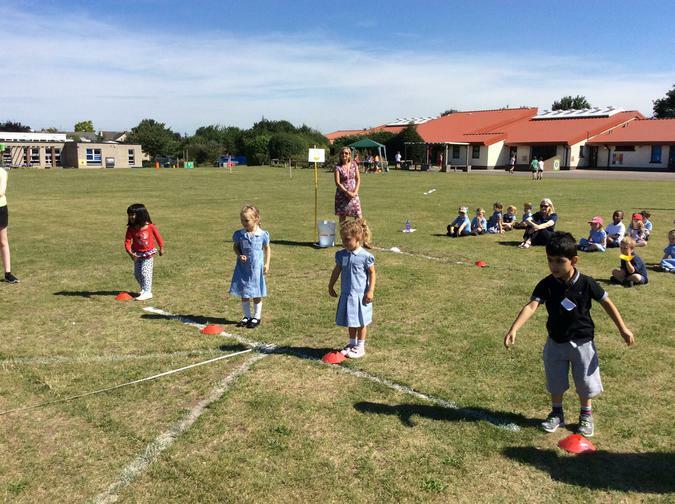 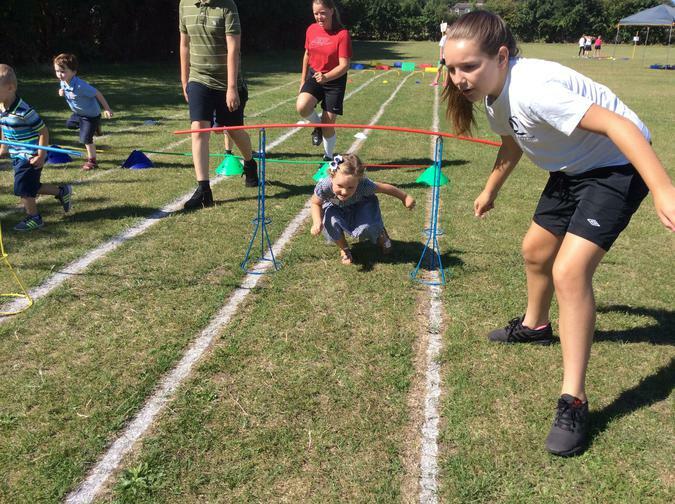 Summer 2 topic- How high can i jump? 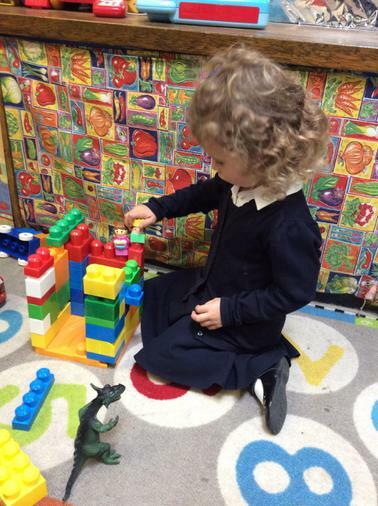 Summer 1 topic- Do dragons exist? 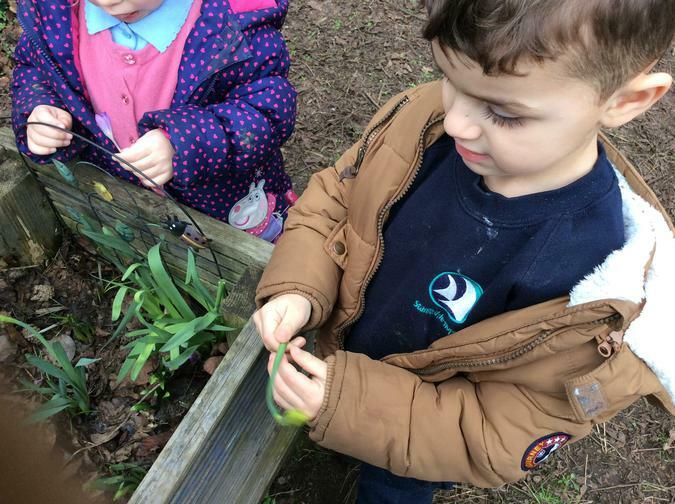 Spring 2- Where do eggs come from? 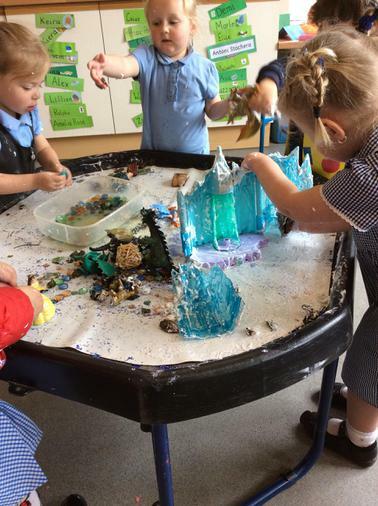 Spring 1- Where does snow go? 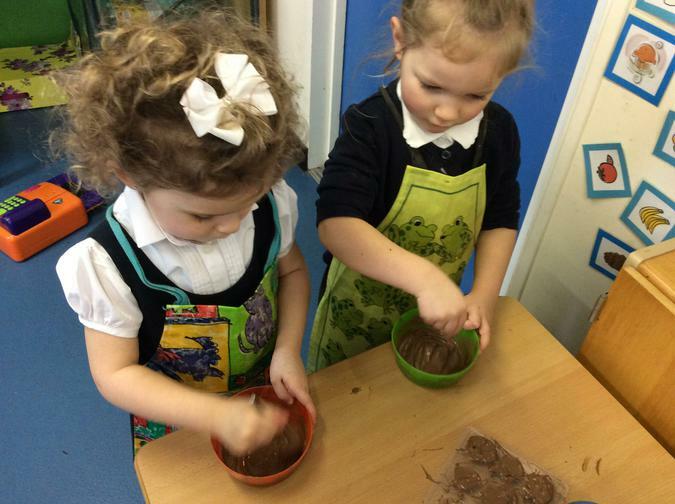 We have been learning the story of the Gingerbread man. 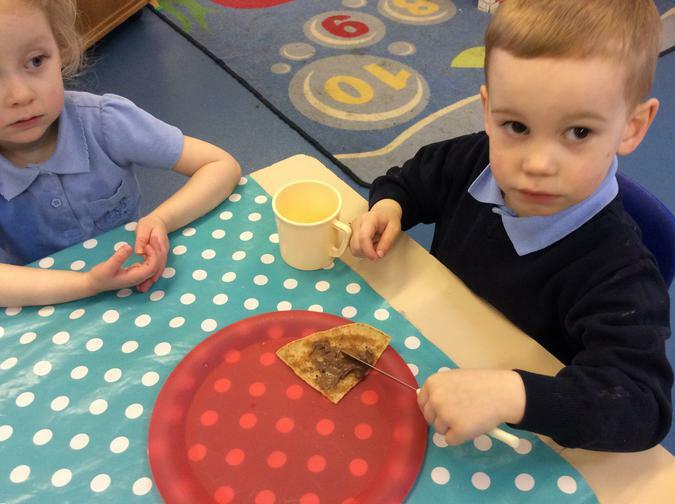 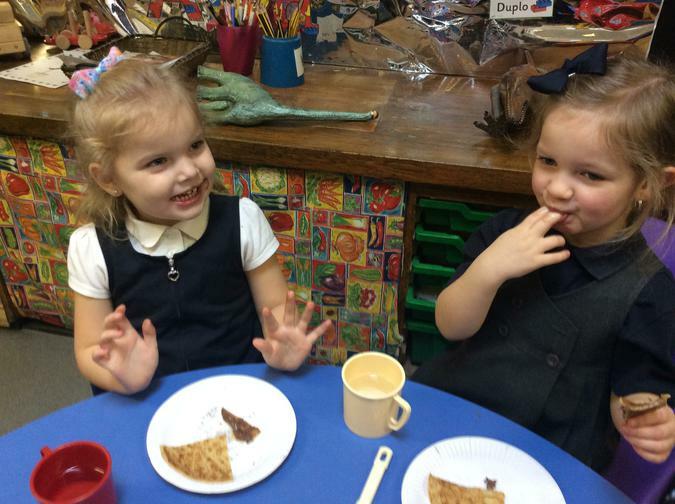 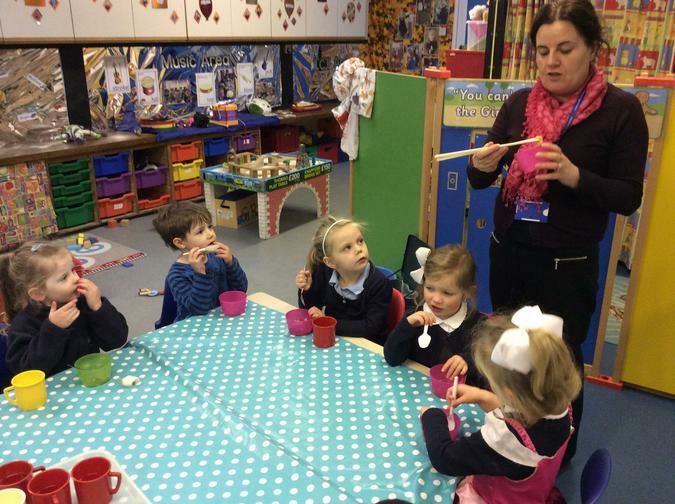 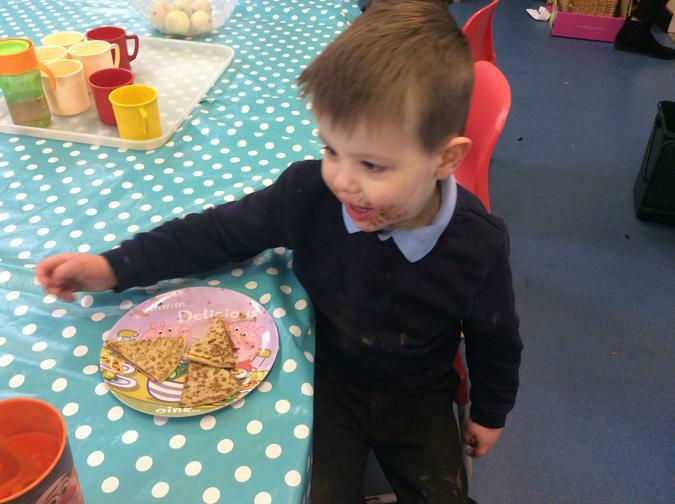 This week we decorated Gingerbread men biscuits and enjoyed them at snack time! 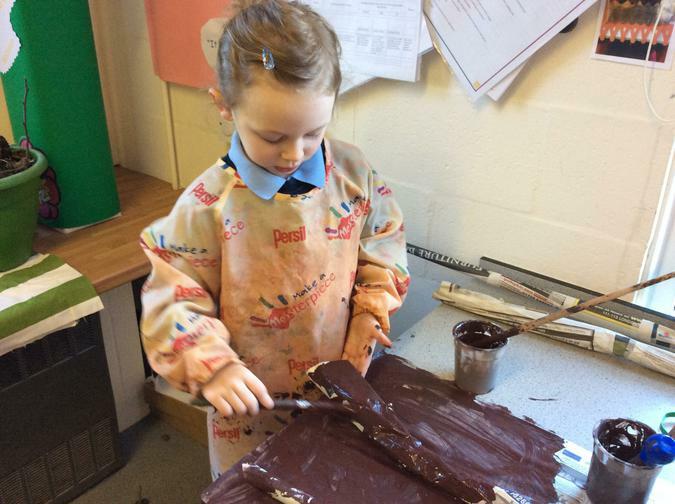 We used knives to spread the icing. 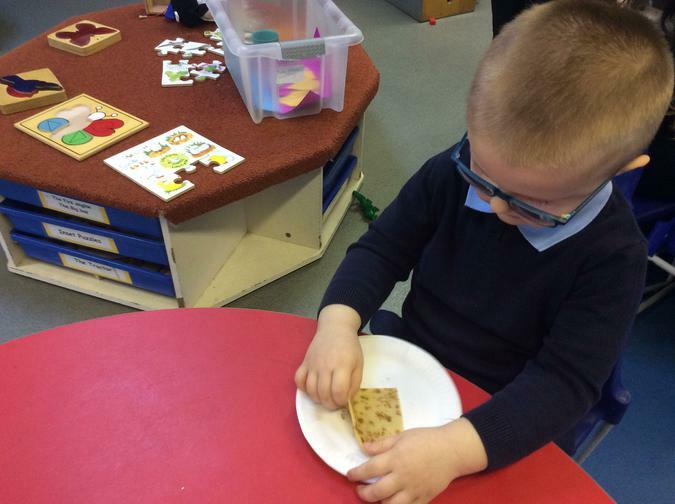 We added raisins for eyes and buttons. 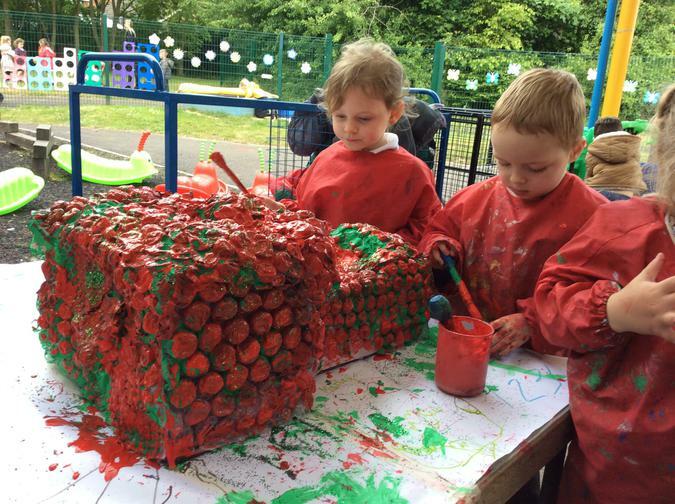 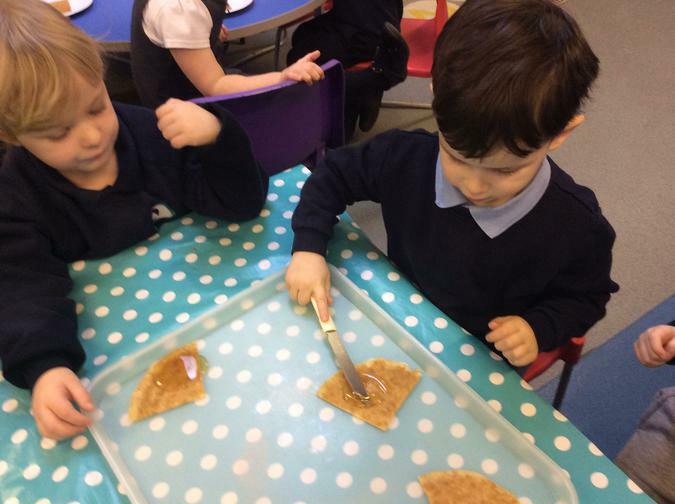 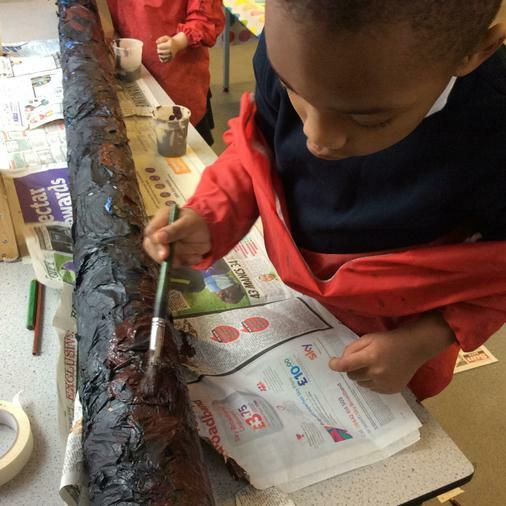 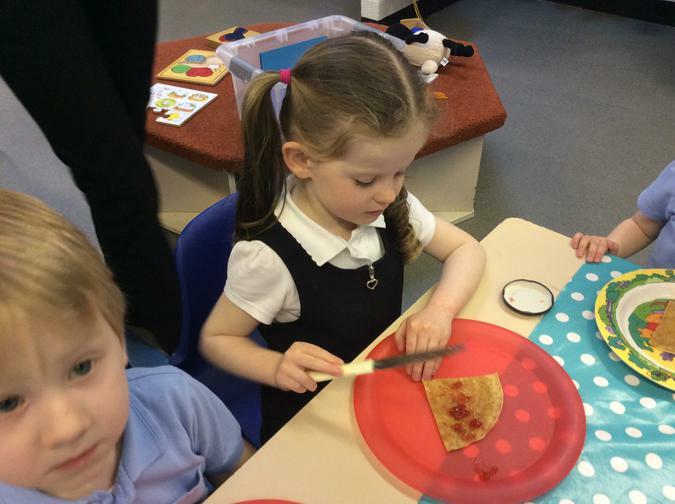 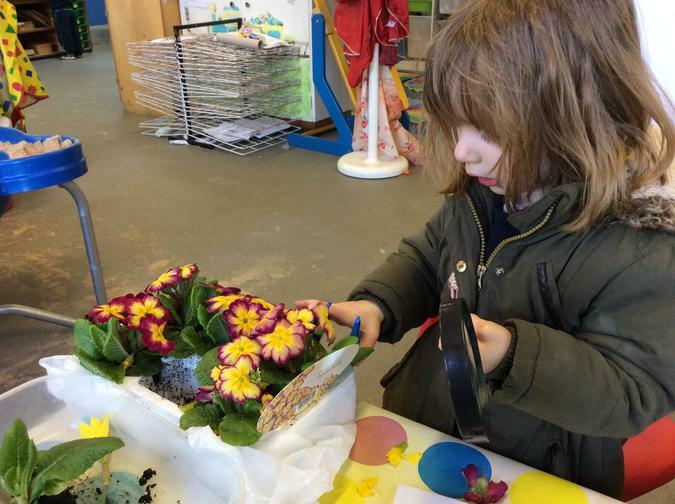 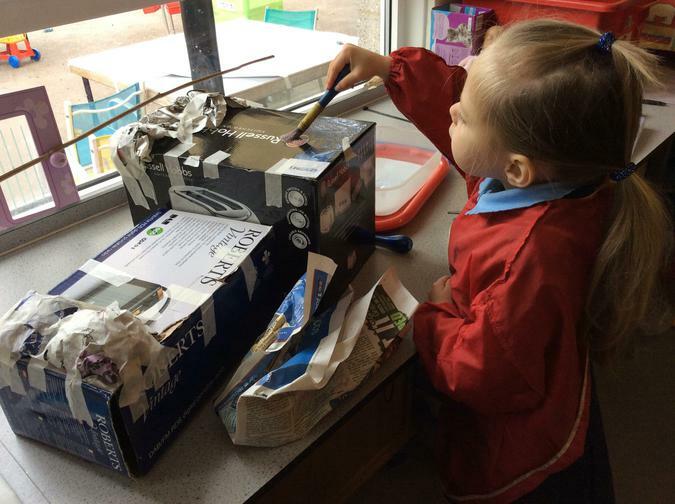 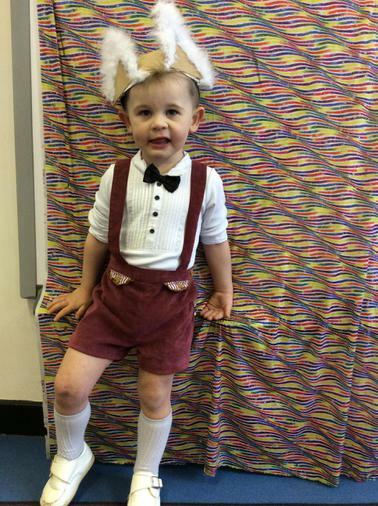 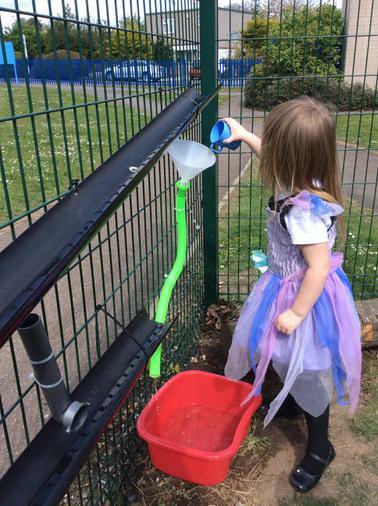 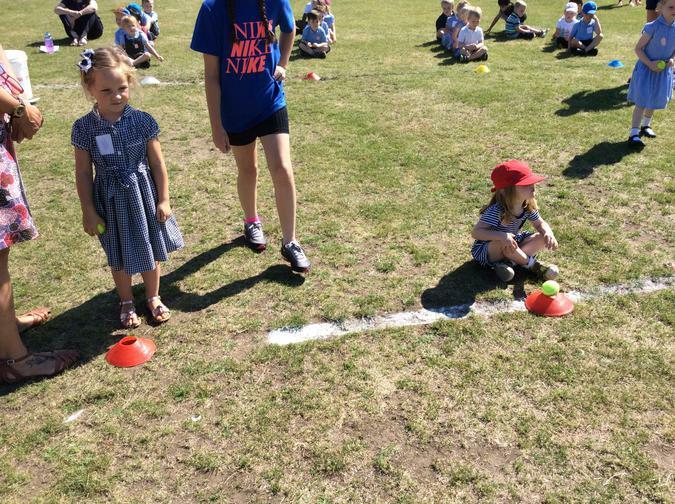 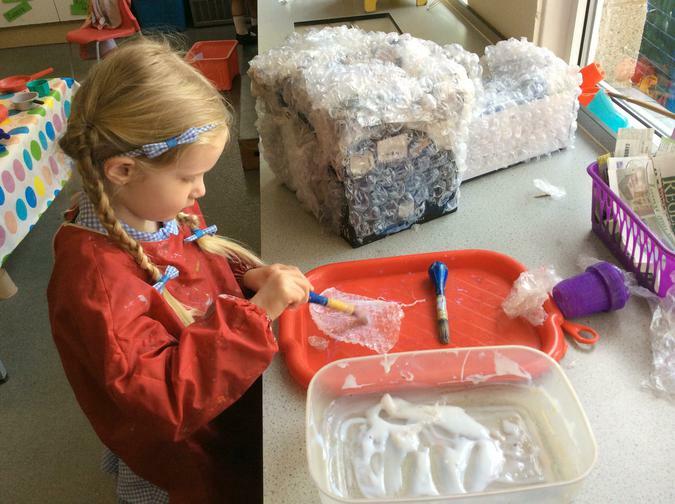 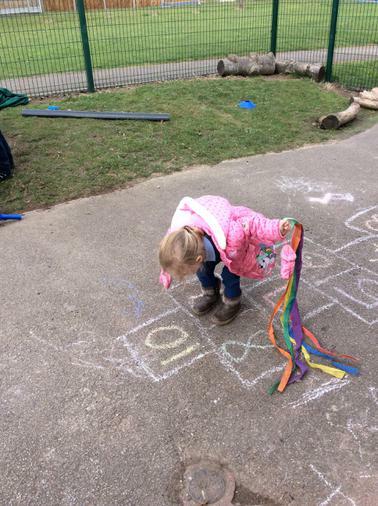 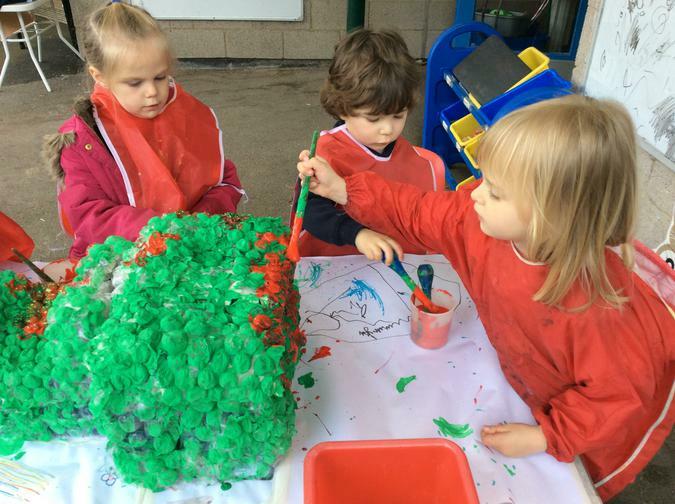 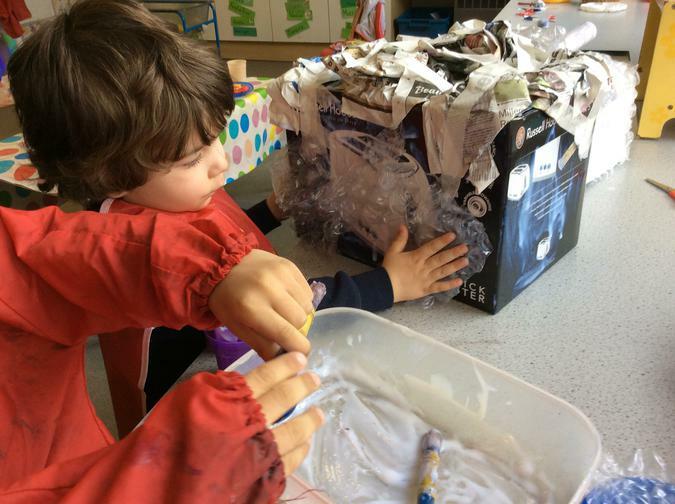 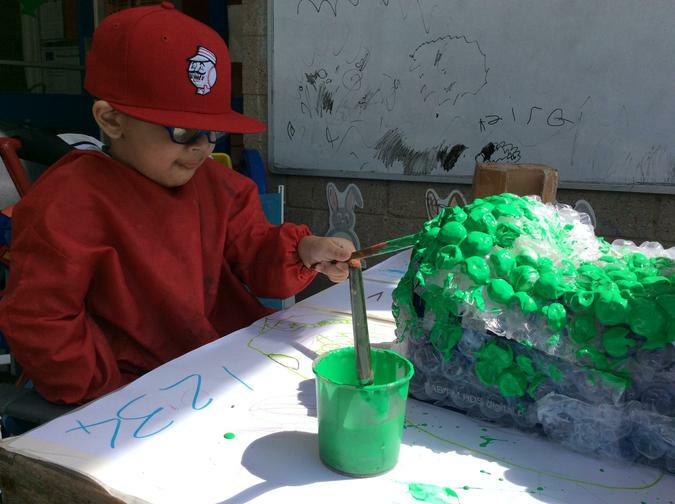 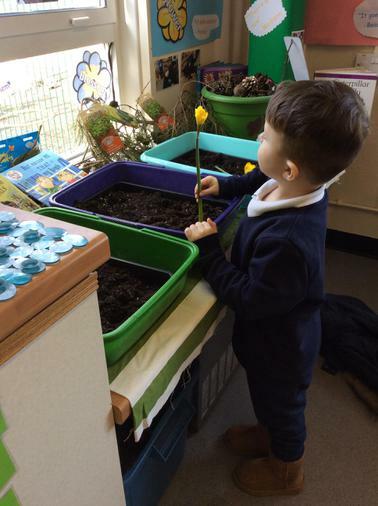 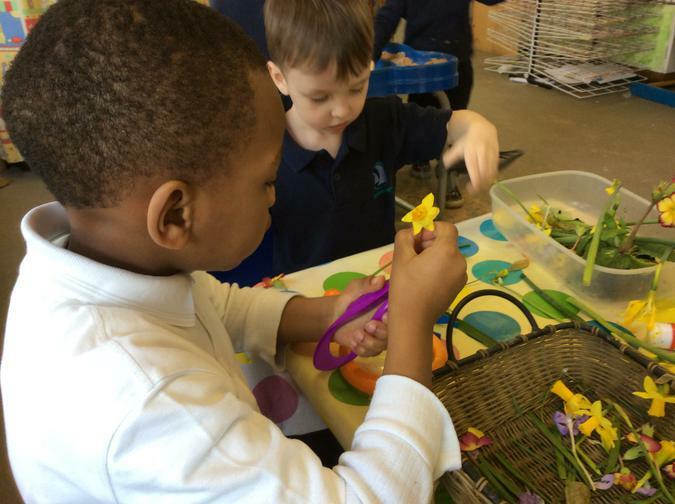 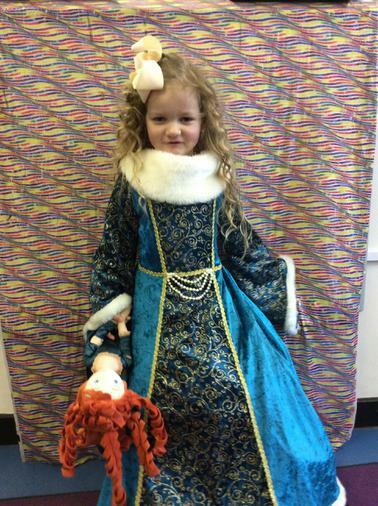 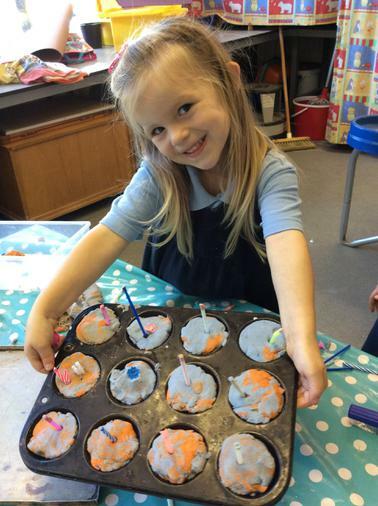 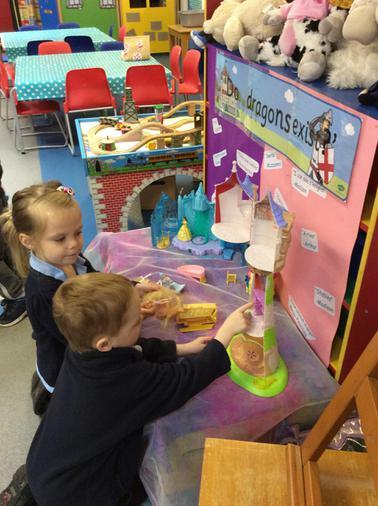 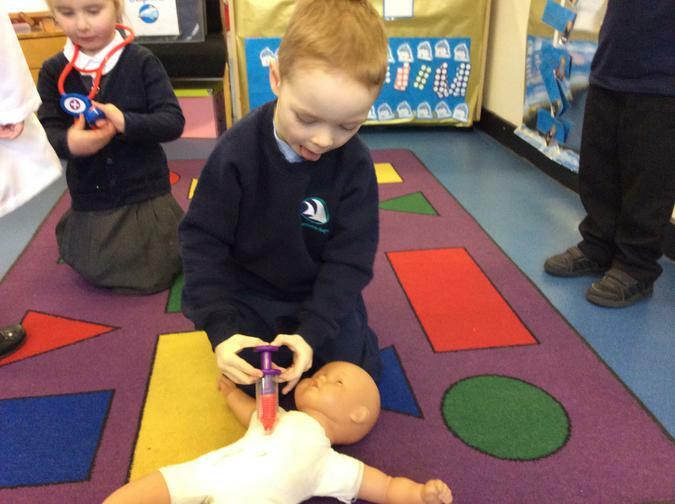 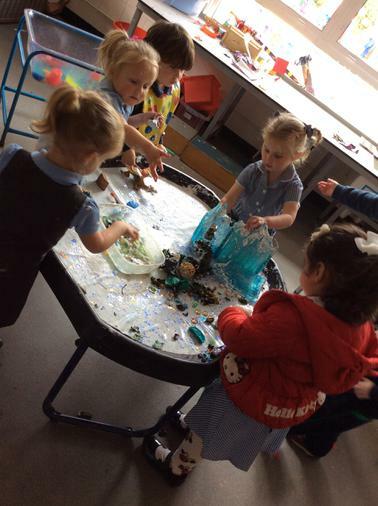 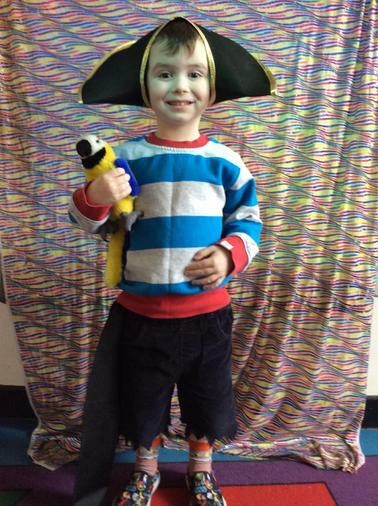 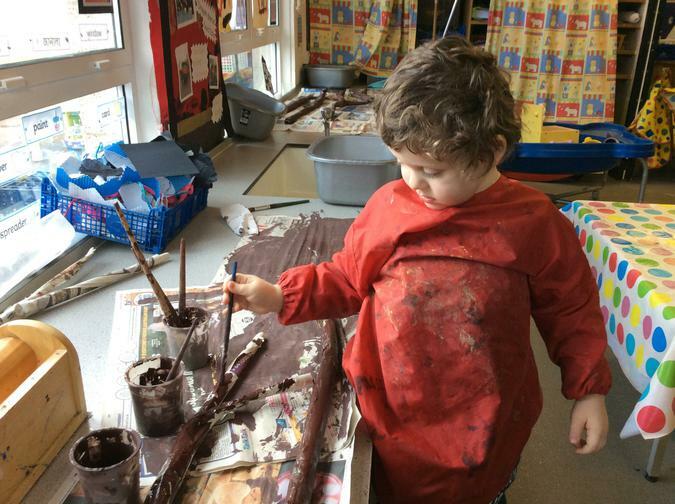 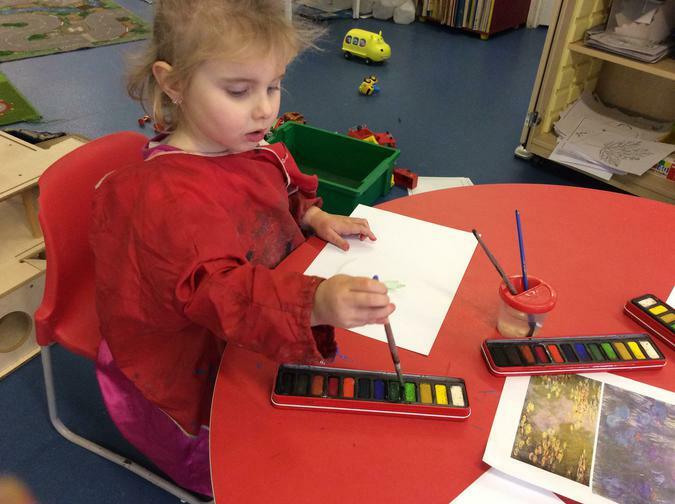 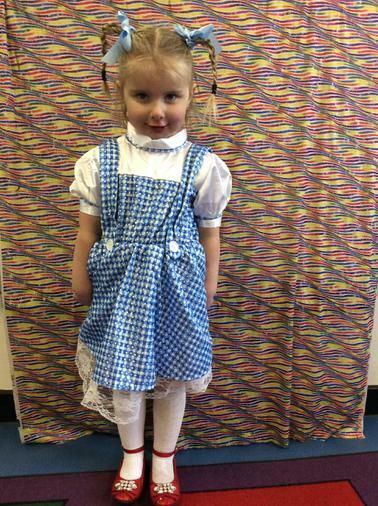 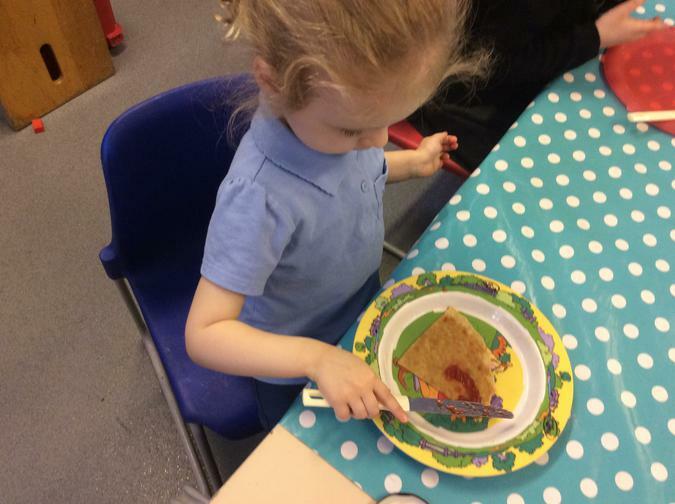 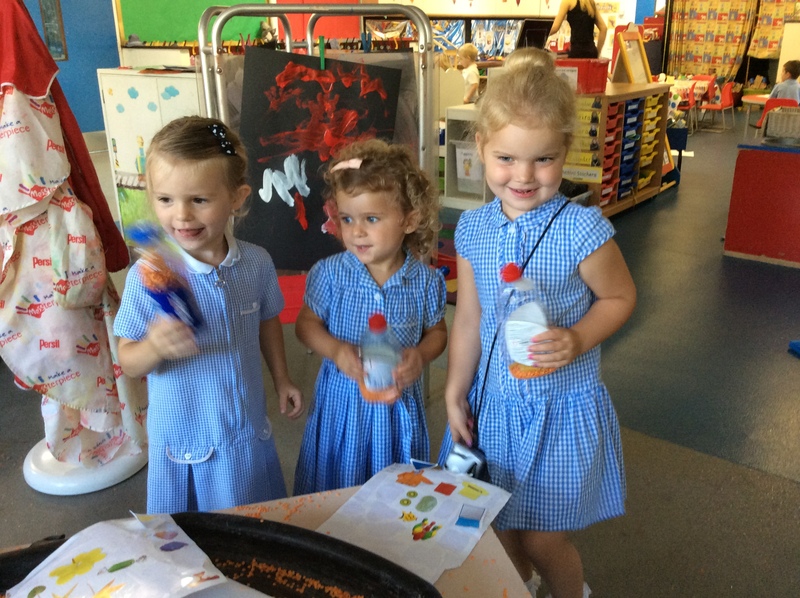 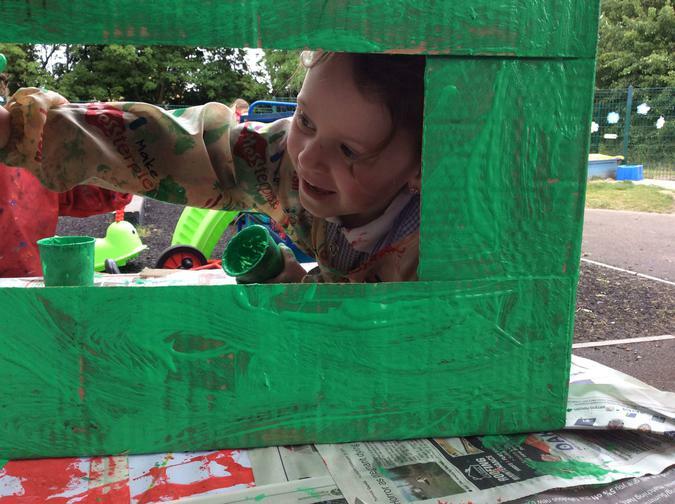 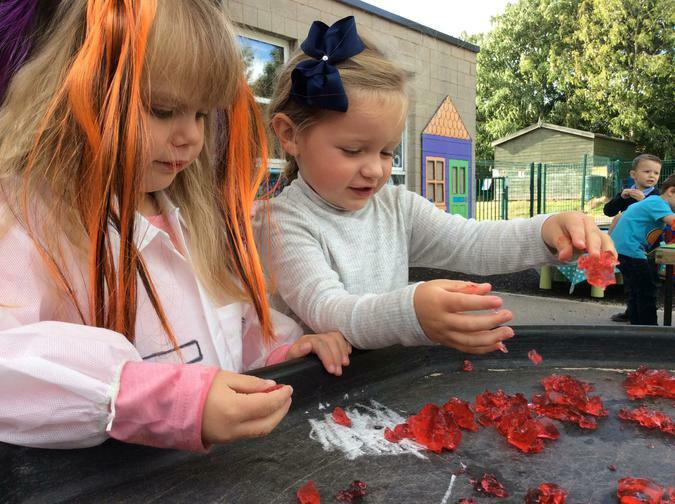 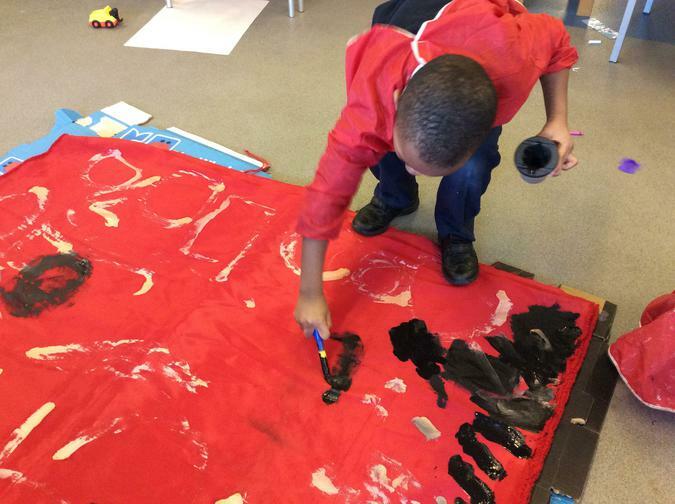 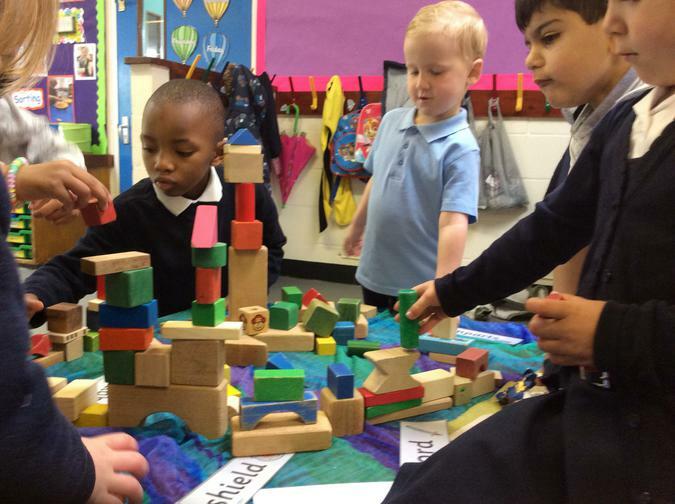 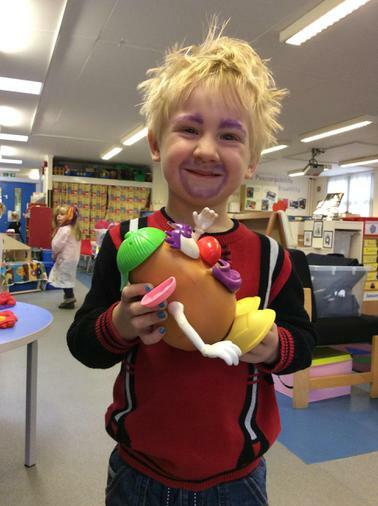 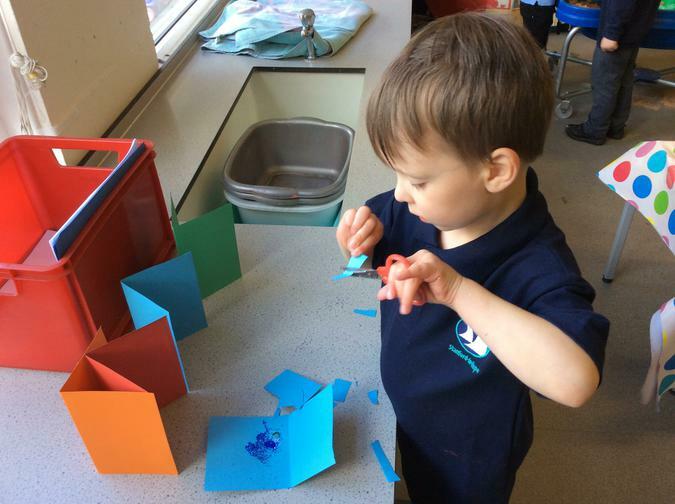 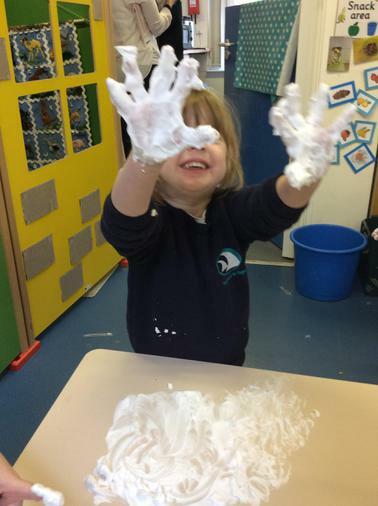 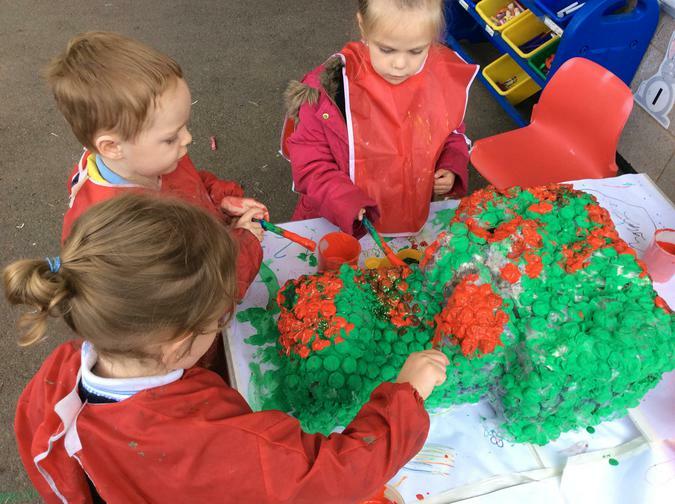 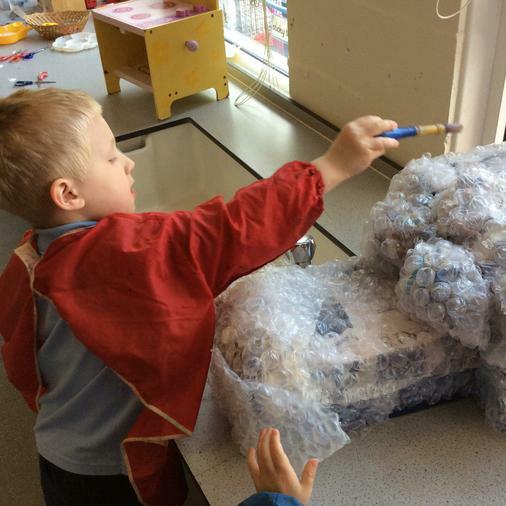 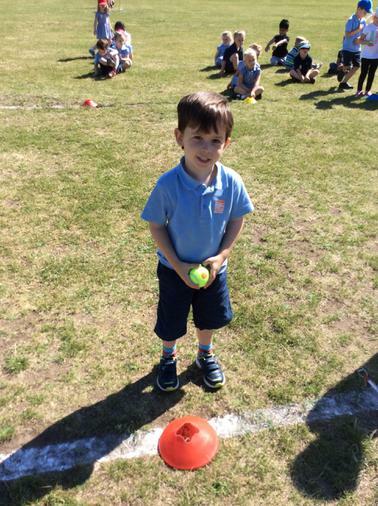 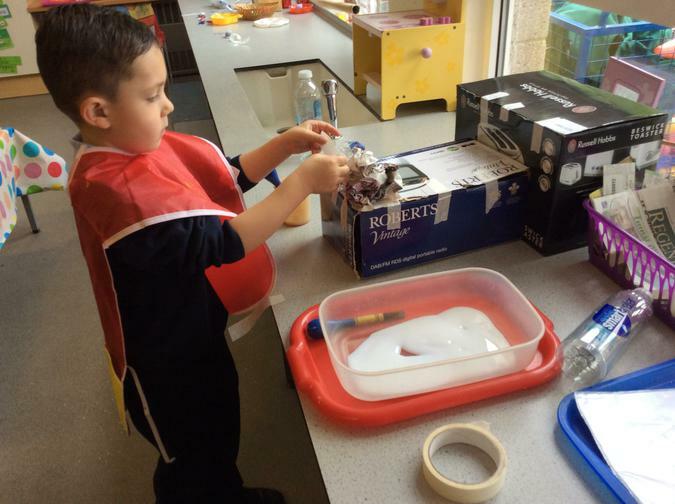 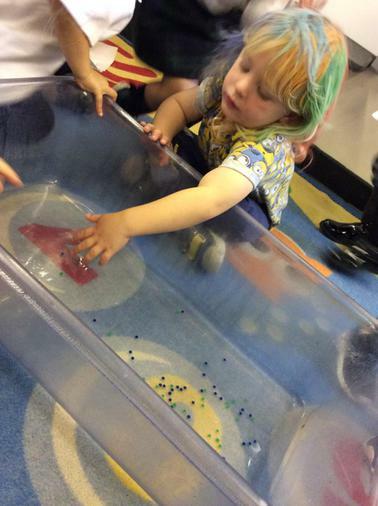 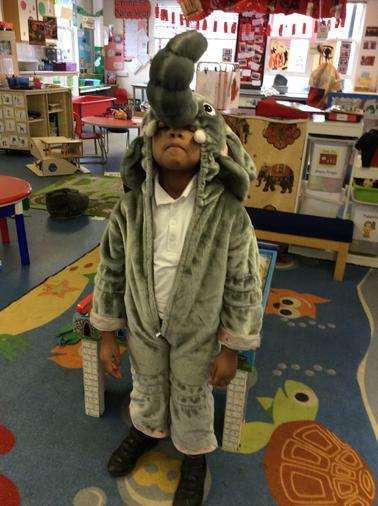 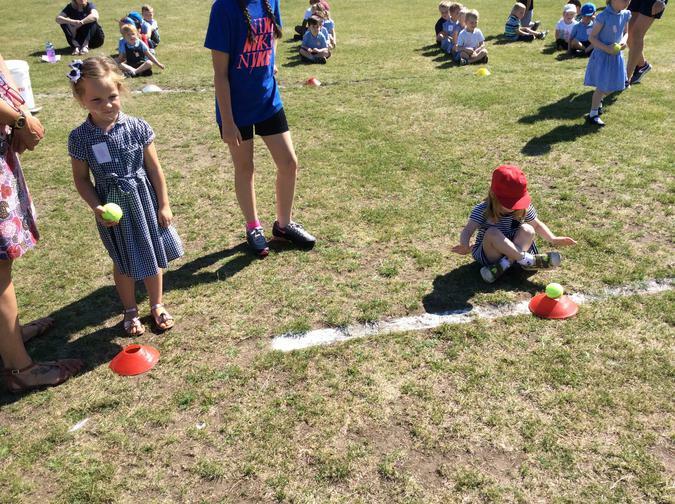 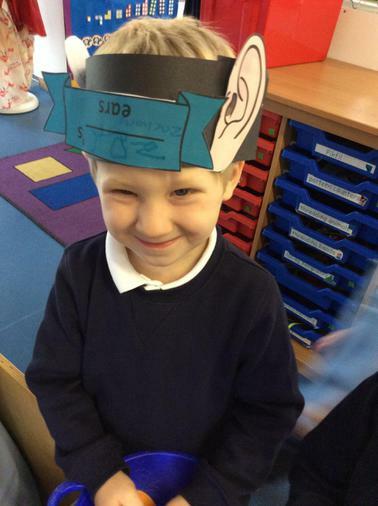 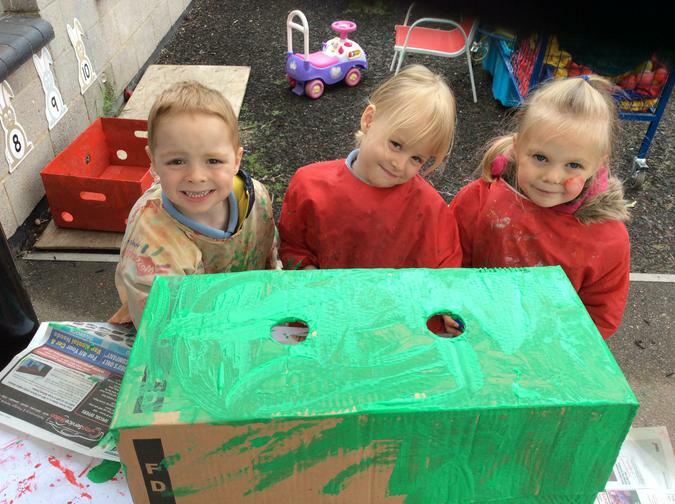 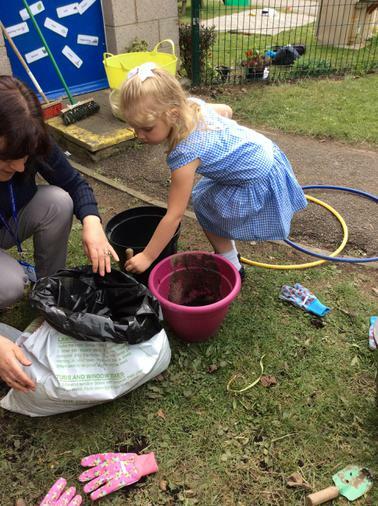 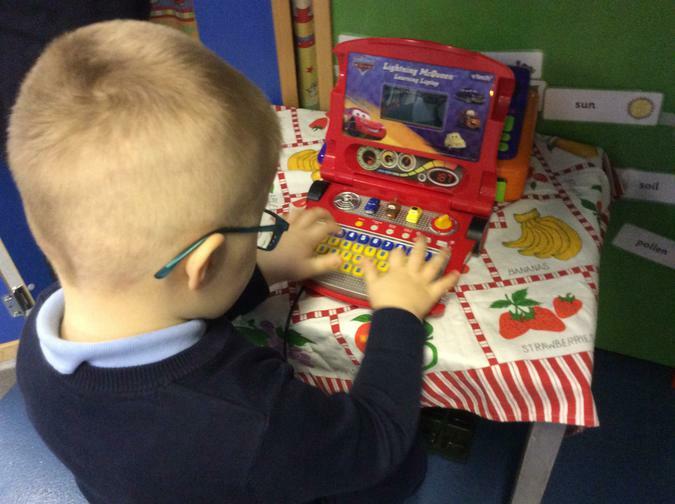 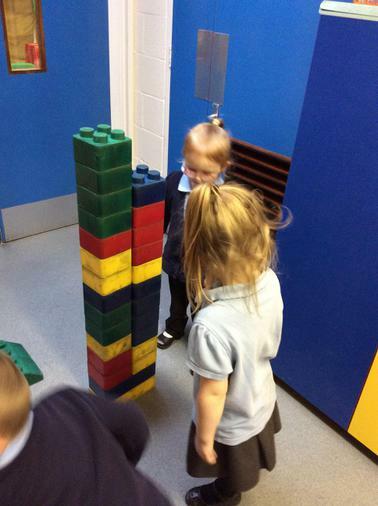 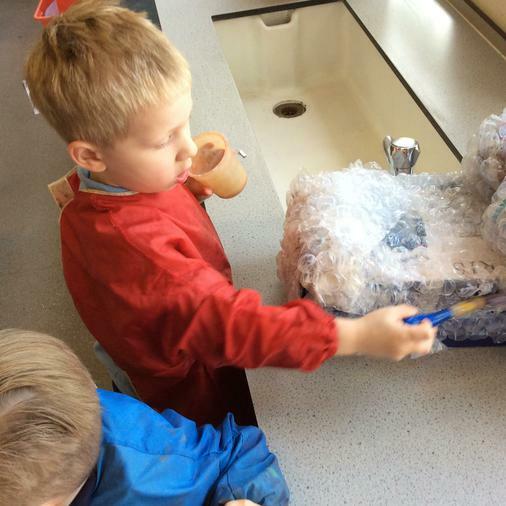 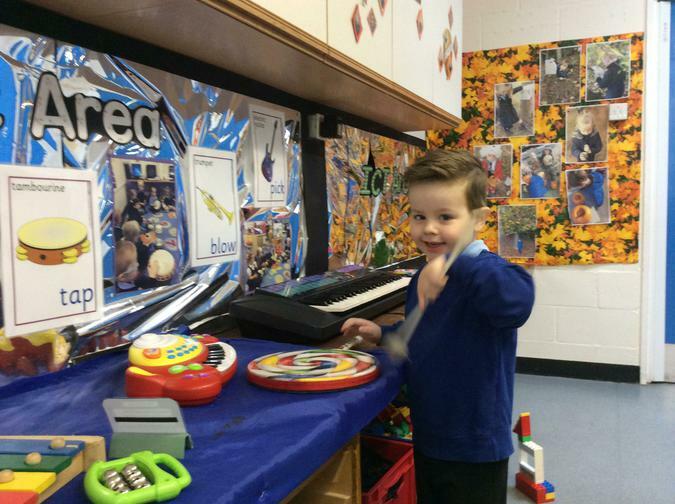 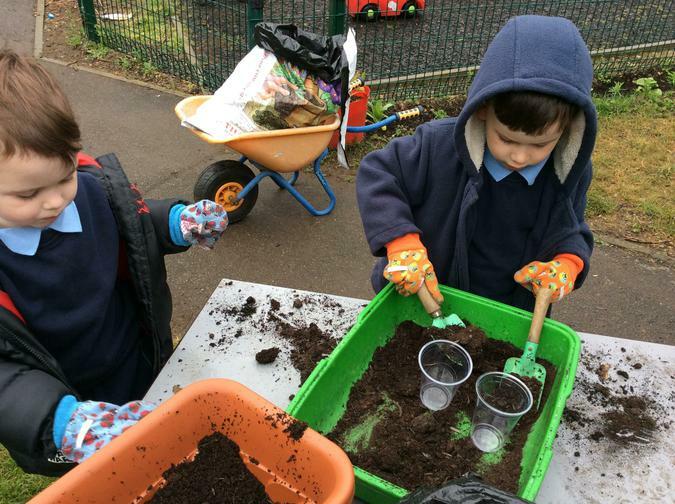 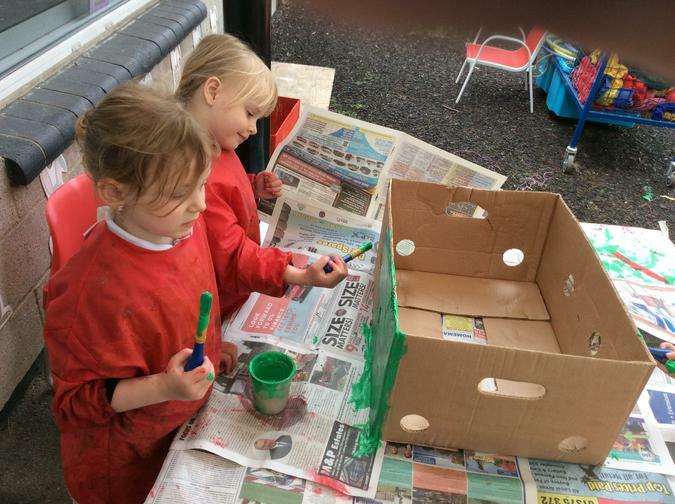 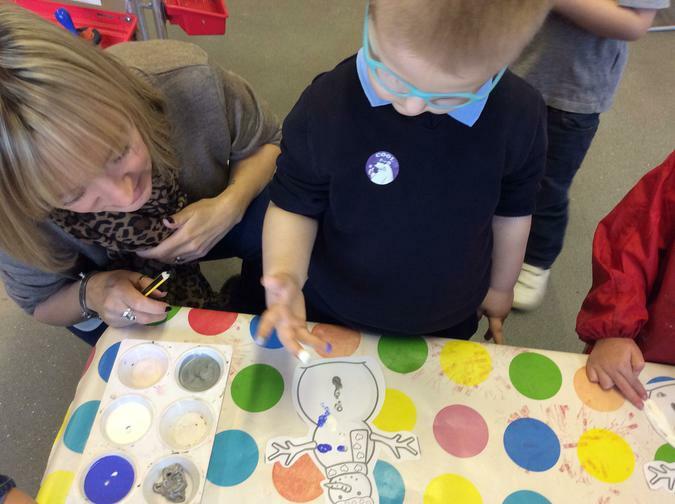 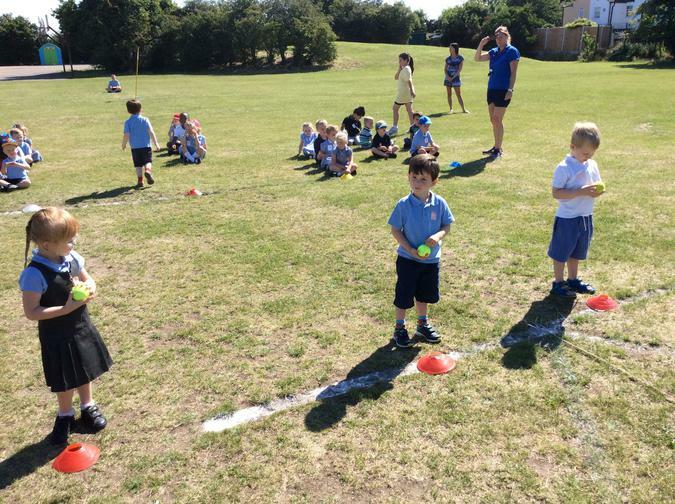 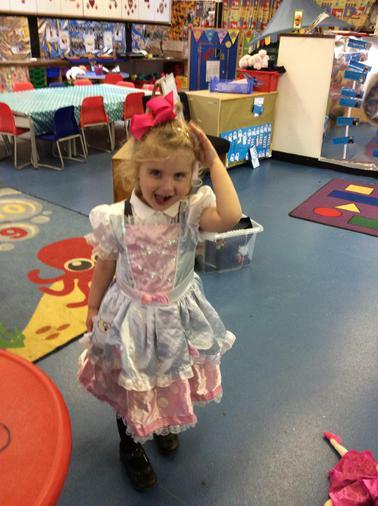 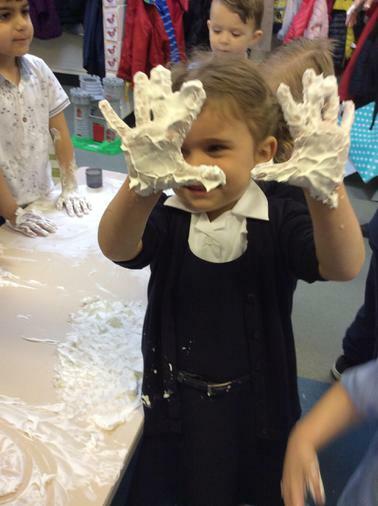 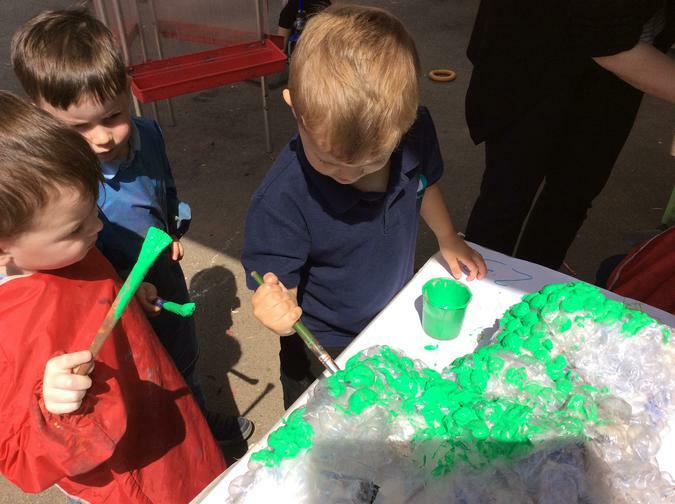 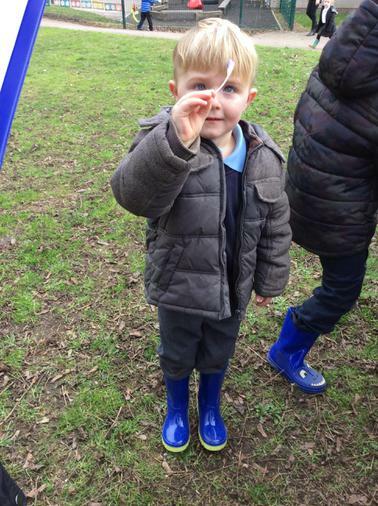 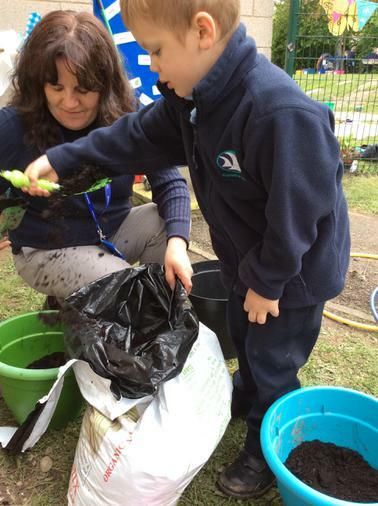 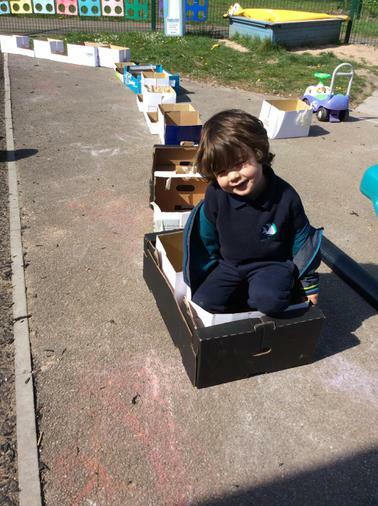 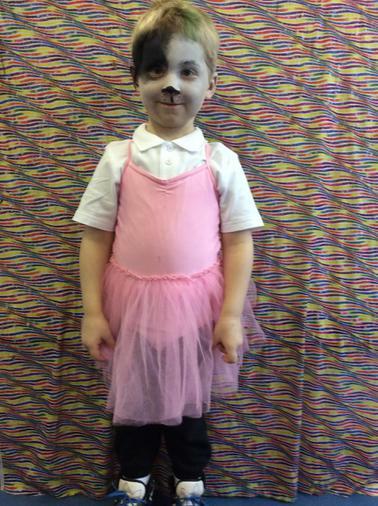 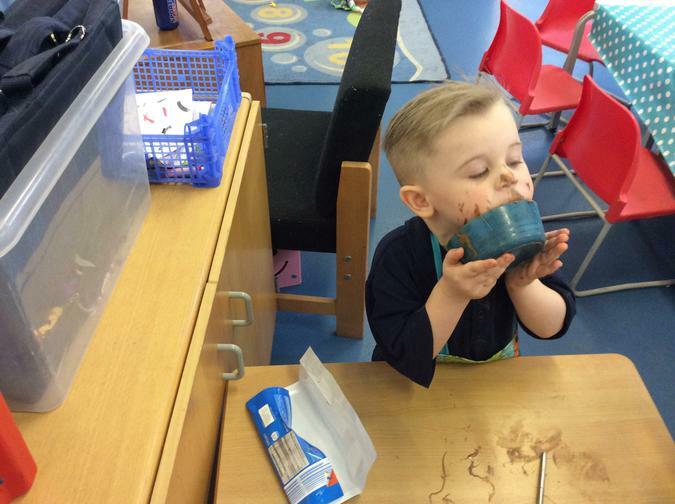 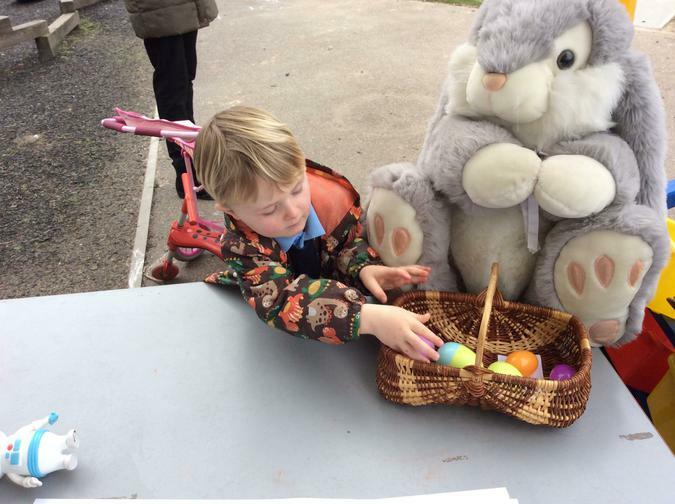 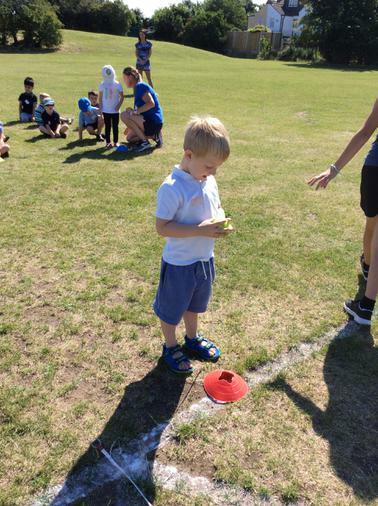 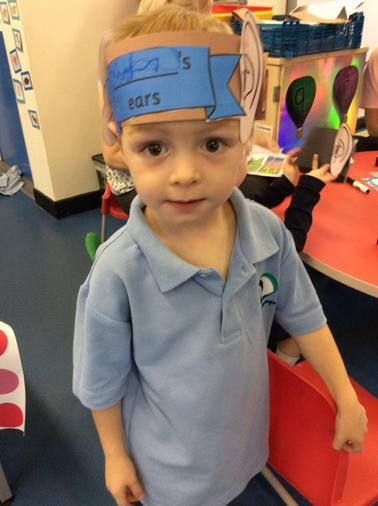 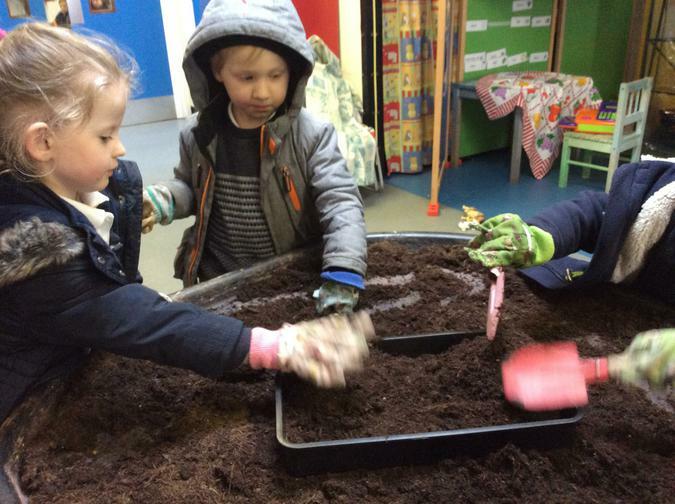 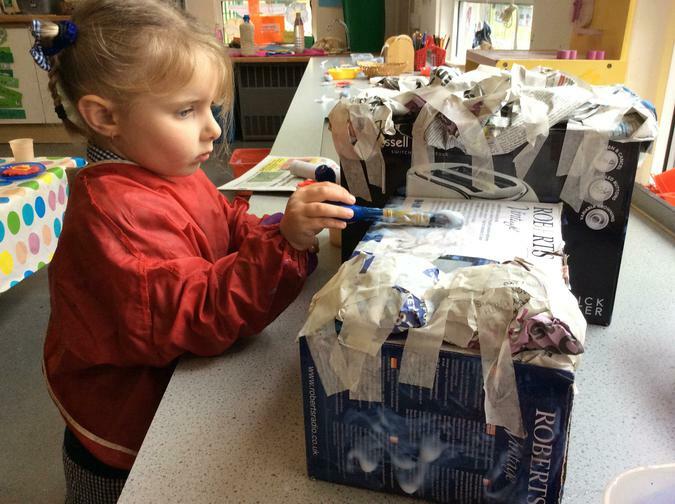 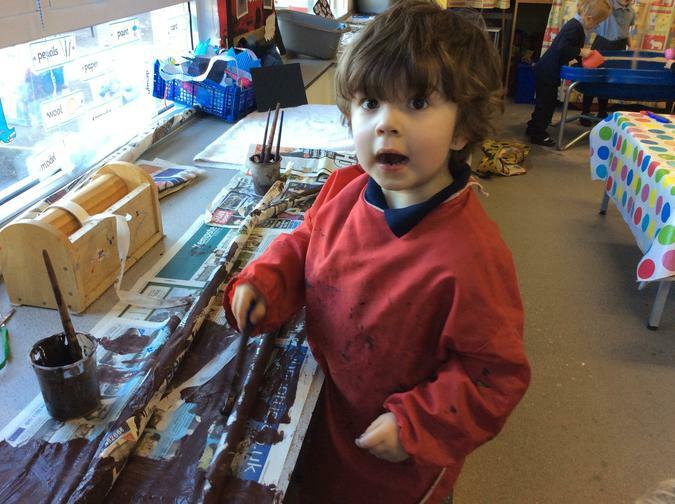 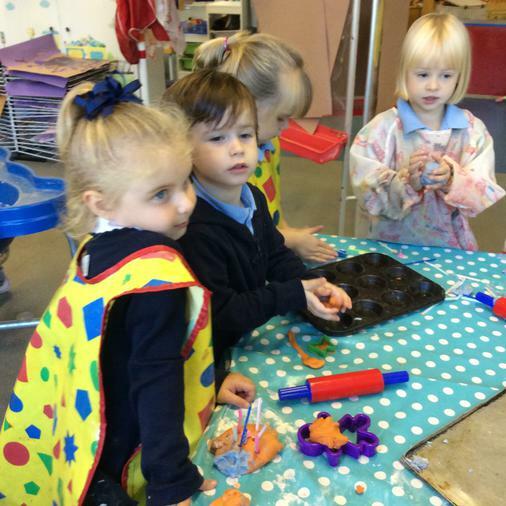 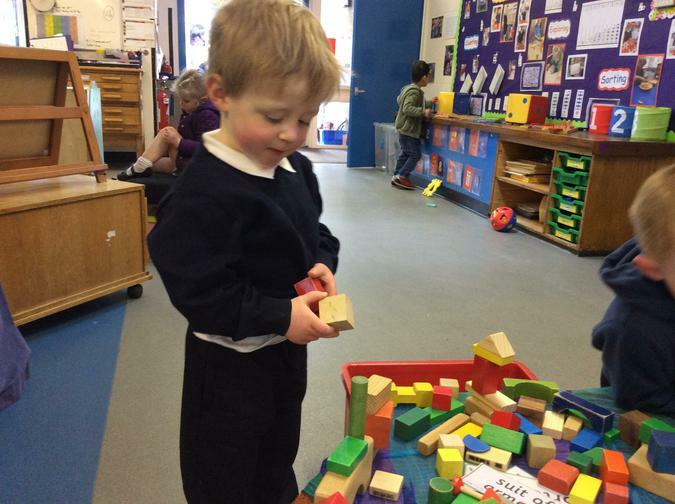 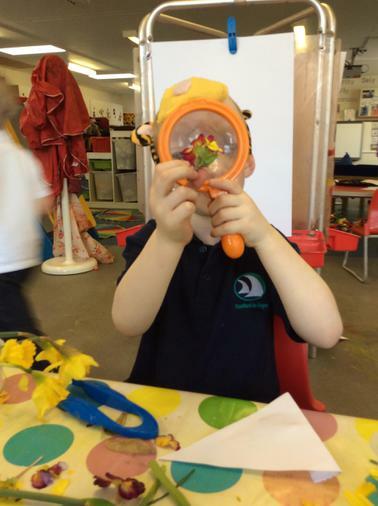 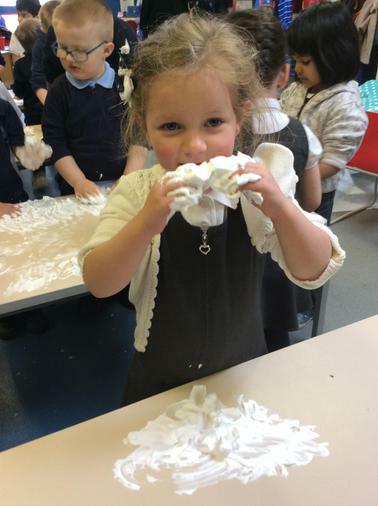 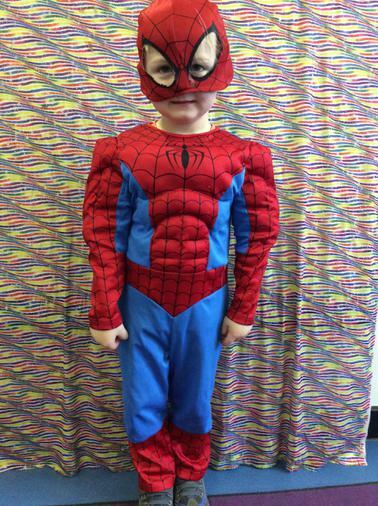 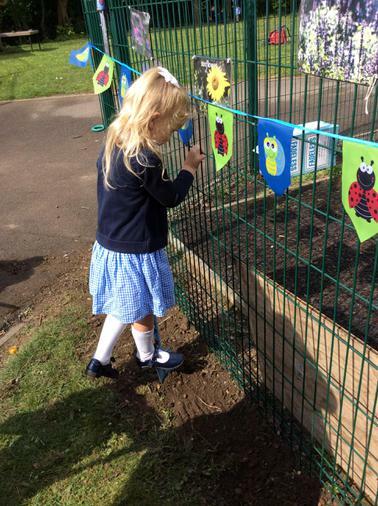 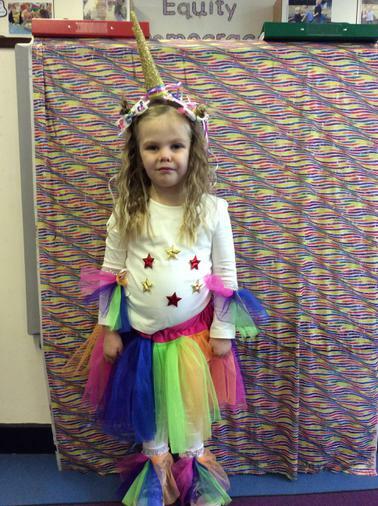 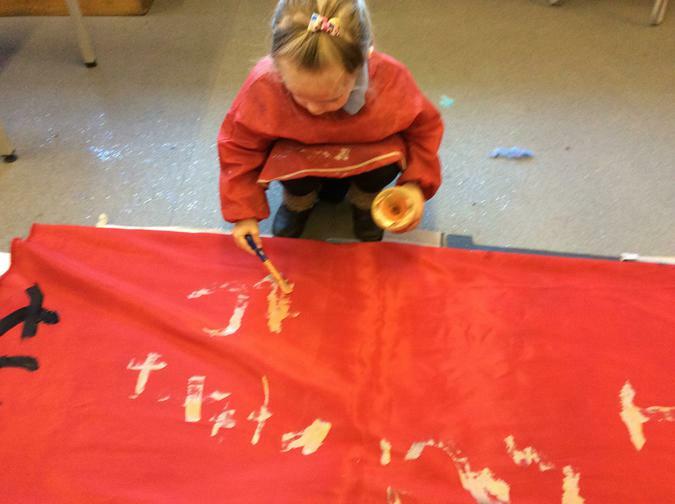 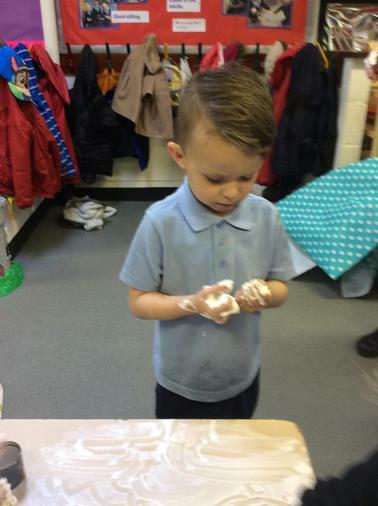 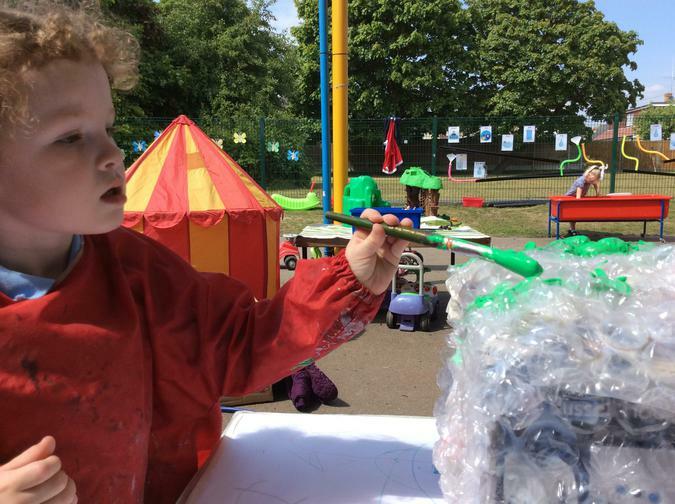 Nursery took part in the school's Creative day! 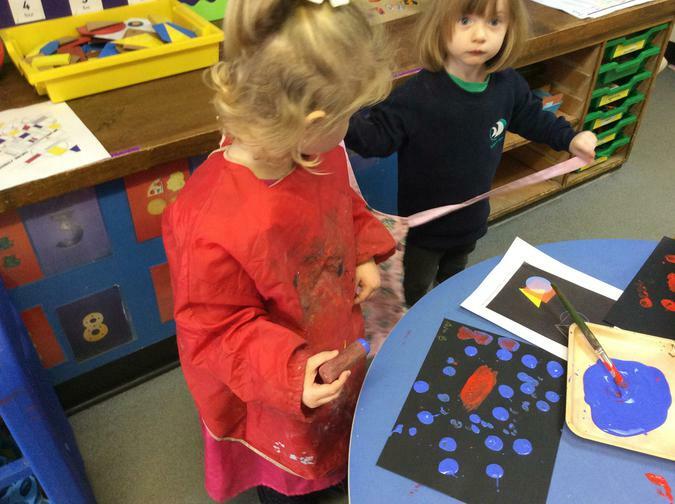 The children experienced Monets's watercolours, Kandinsky's Bauhaus impressions and Pointillism by George Serut. 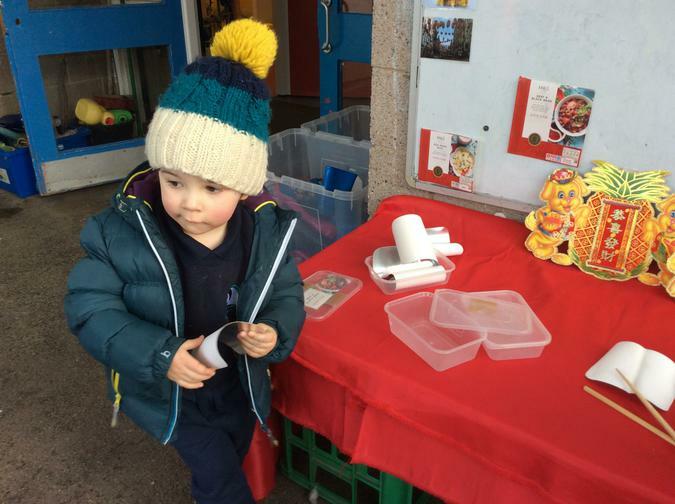 We celebrated Chinese New Year! 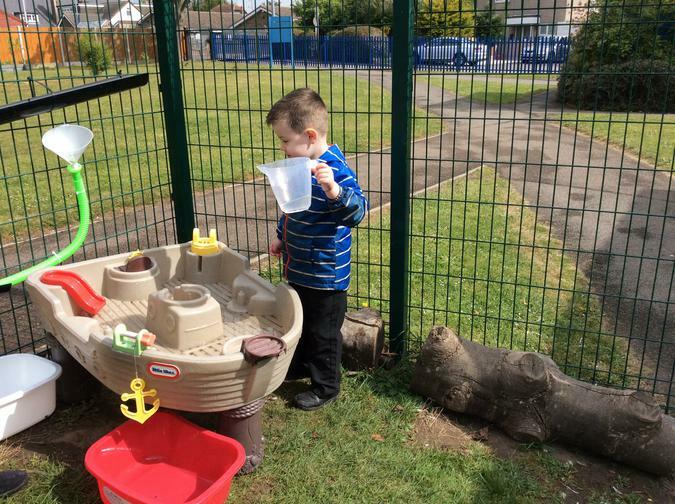 In the garden we had a role play chinese restaurant. 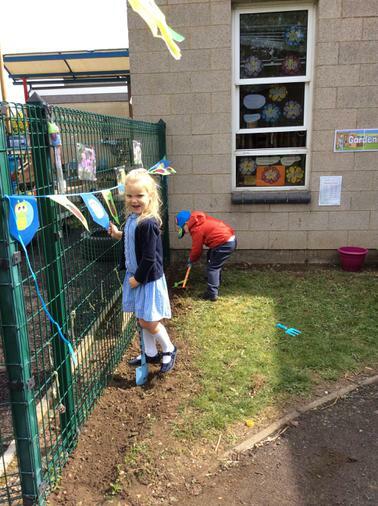 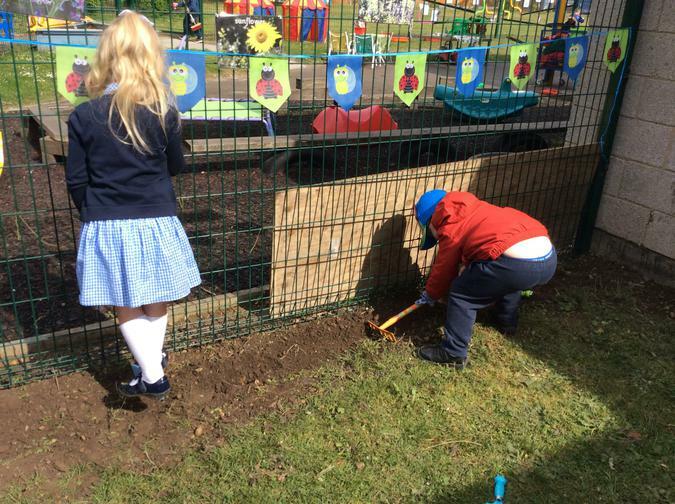 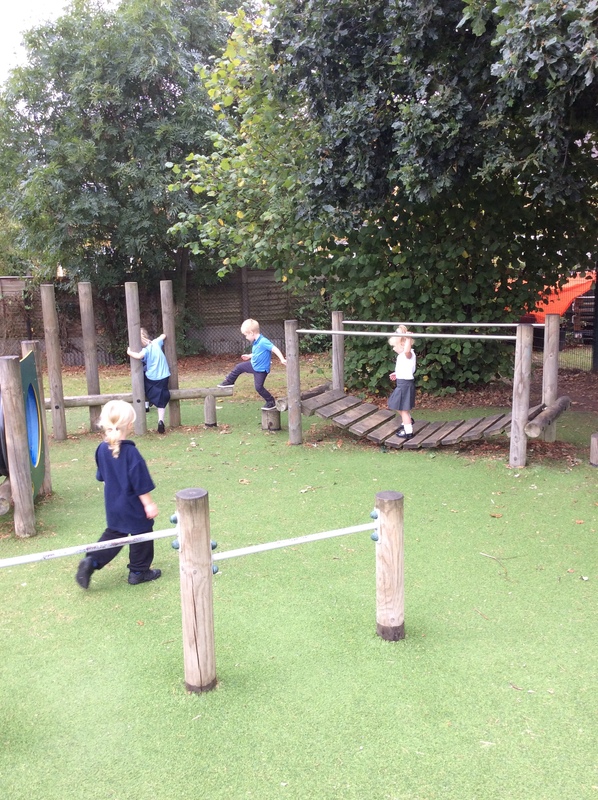 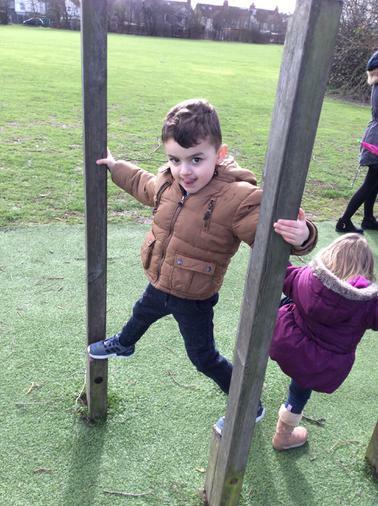 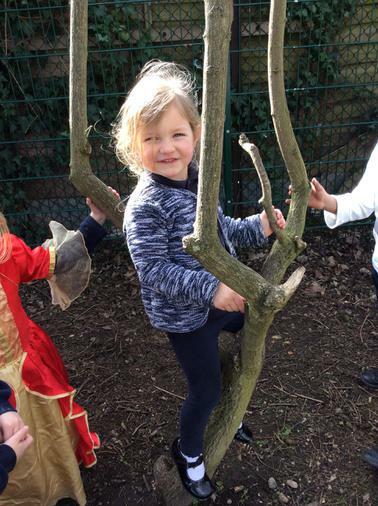 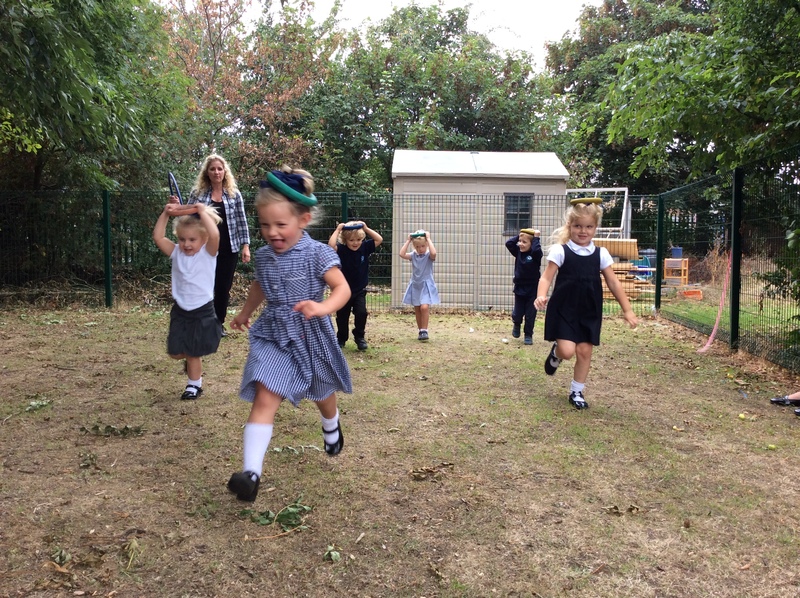 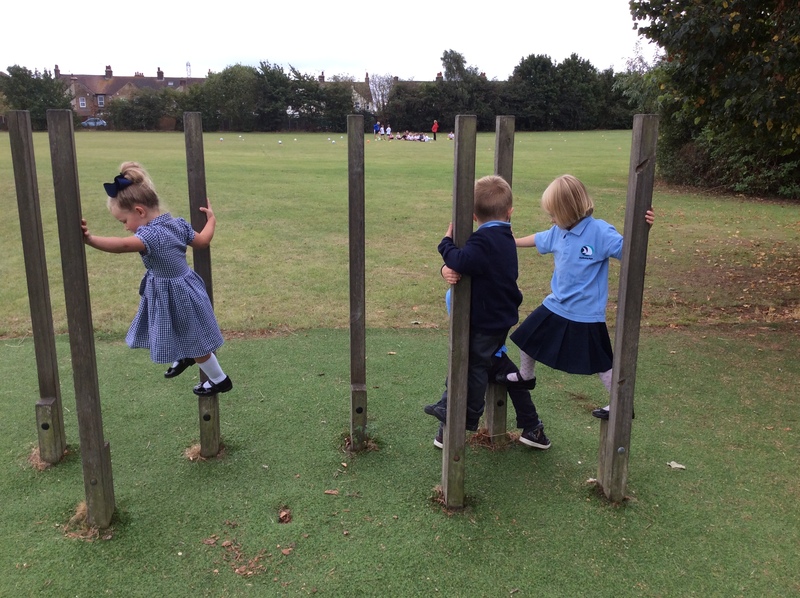 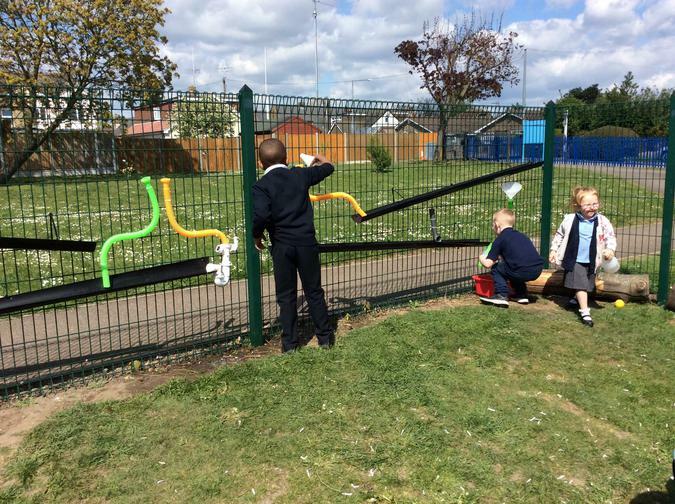 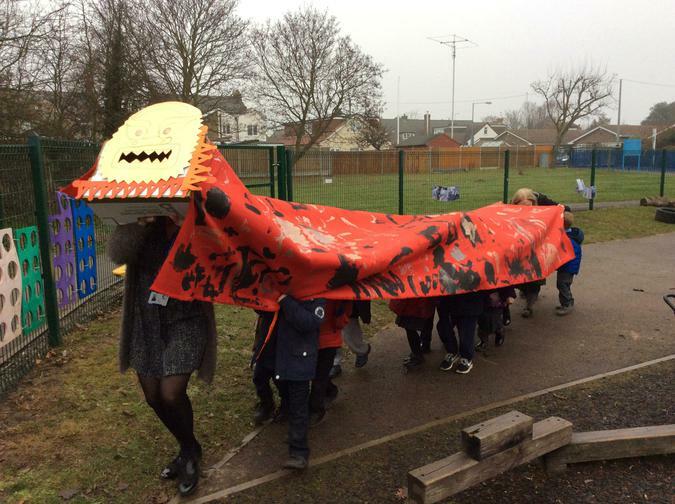 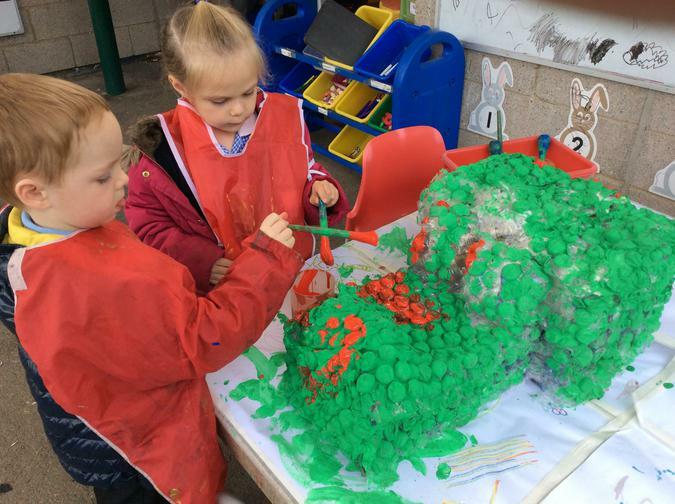 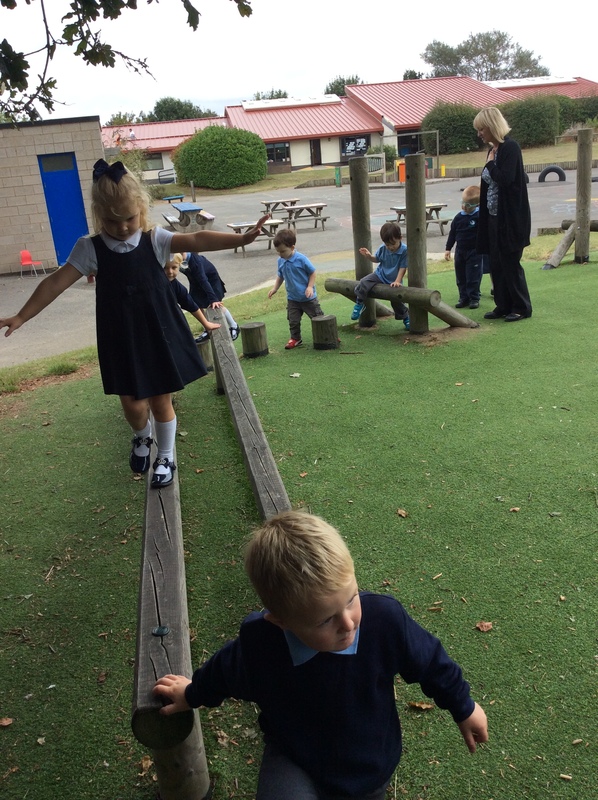 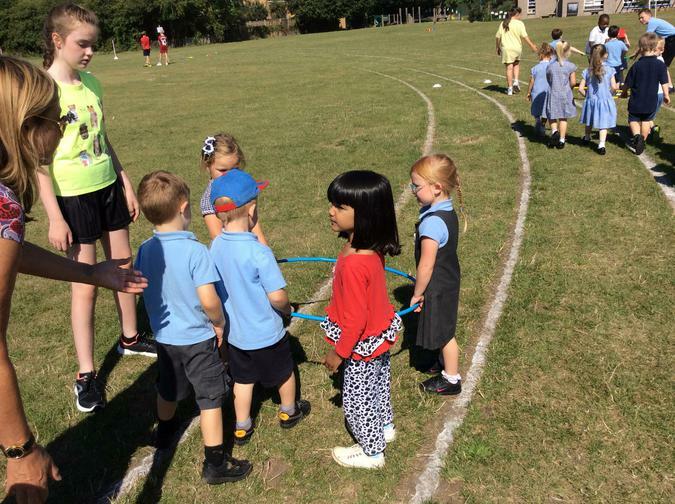 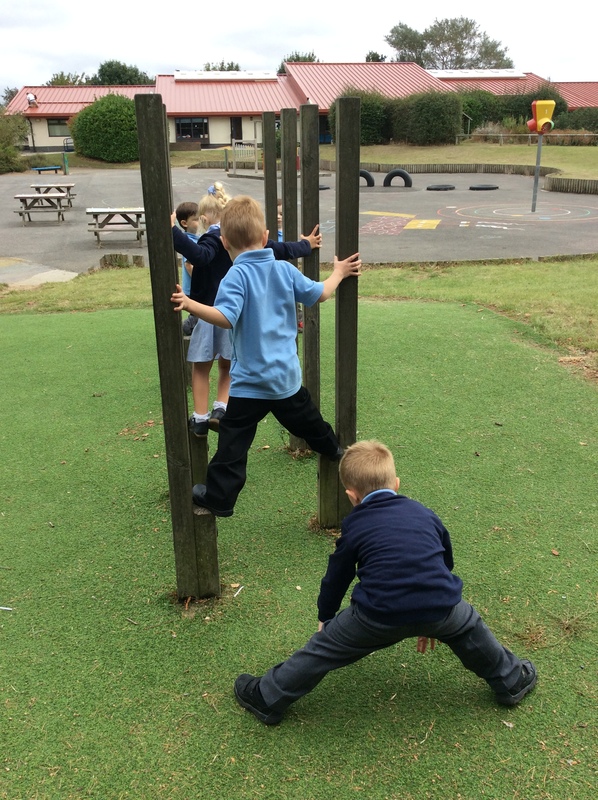 We created a Chinese Dancing Dragon and performed a dance around the Nursery garden! 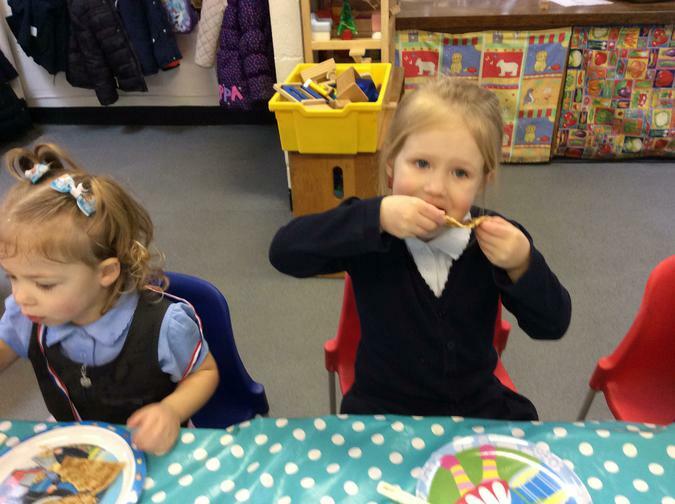 For snack we tried Chinese food! 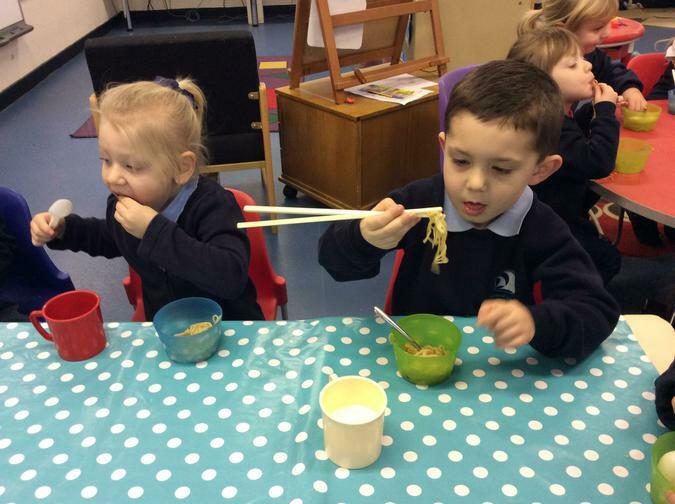 Some of us even tried to use chopsticks! 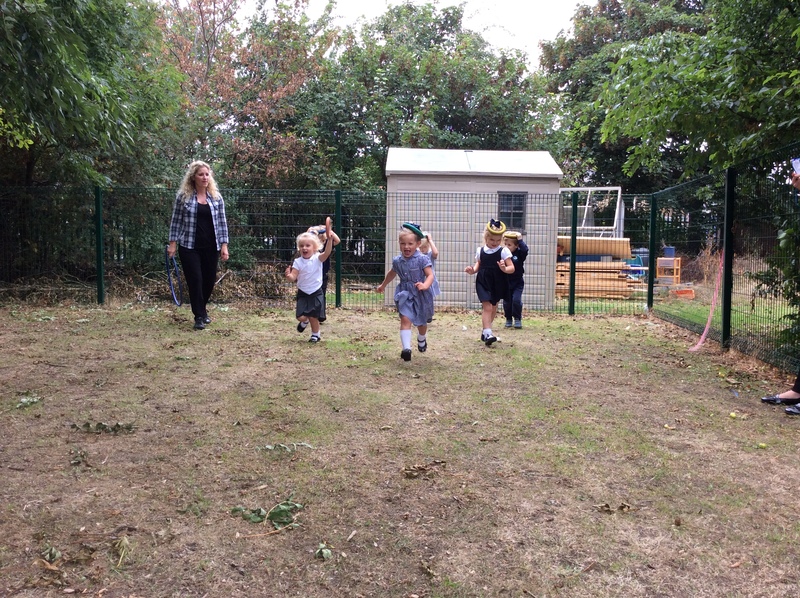 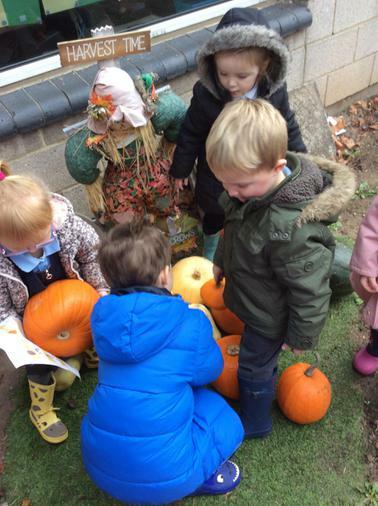 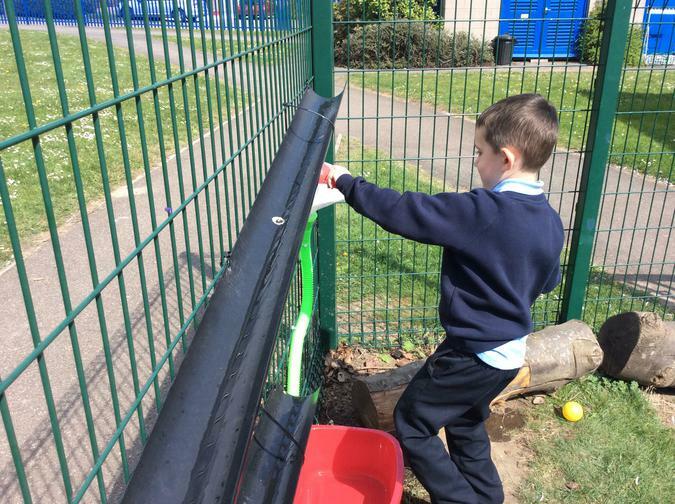 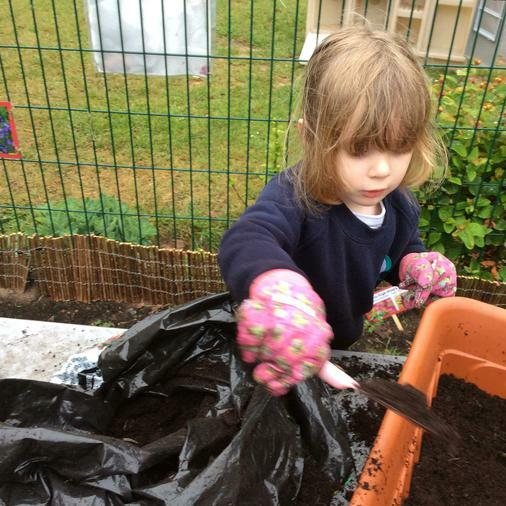 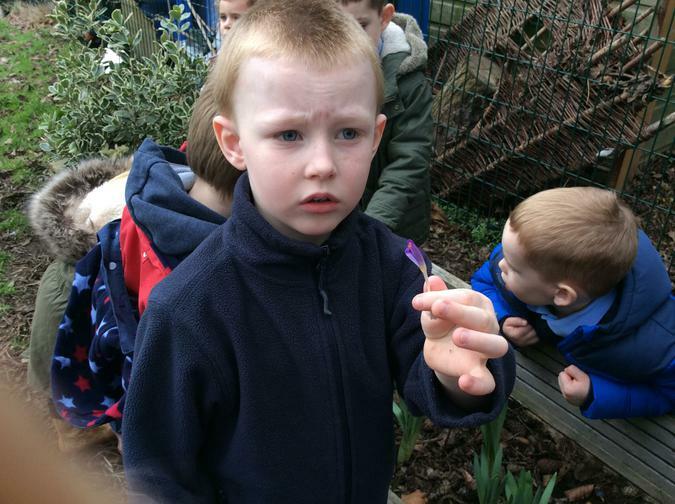 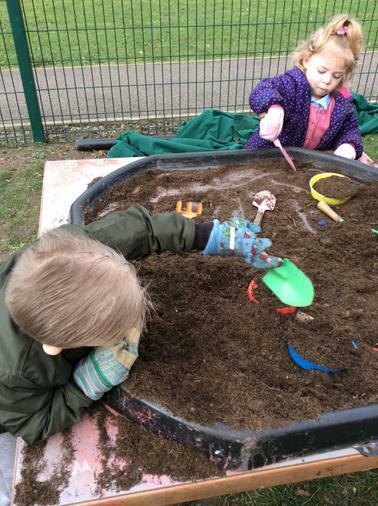 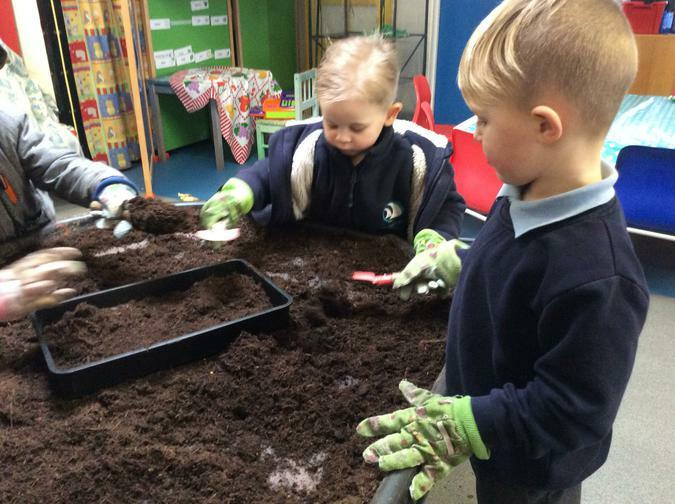 The children were very excited and amazed to see snow in the nursery garden! 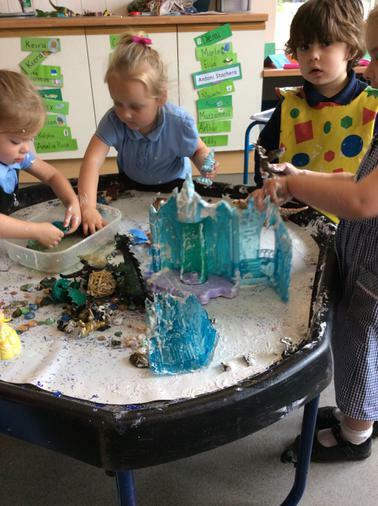 They crunched on the snow and found ice! 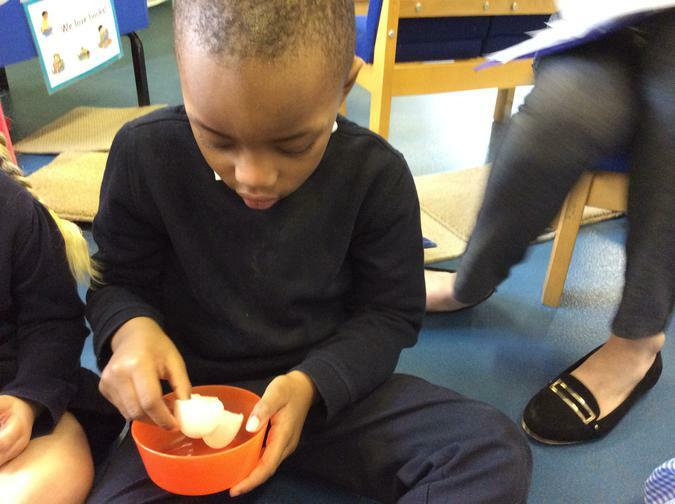 For maths this week the children counted 'ice nuggets' to represent the written numeral. 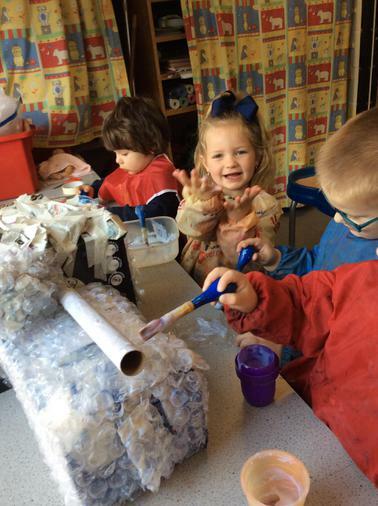 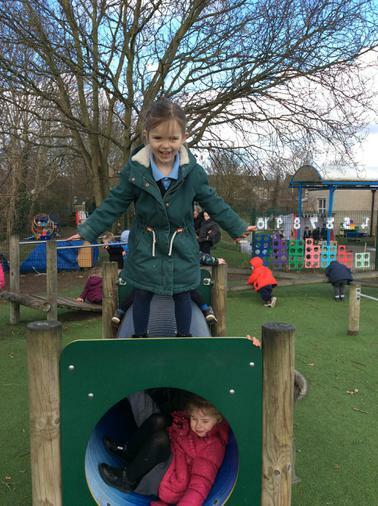 The Nursery children were welcomed back from the Christmas break with an igloo, made from milk bottles collected by the children, and a snow machine! 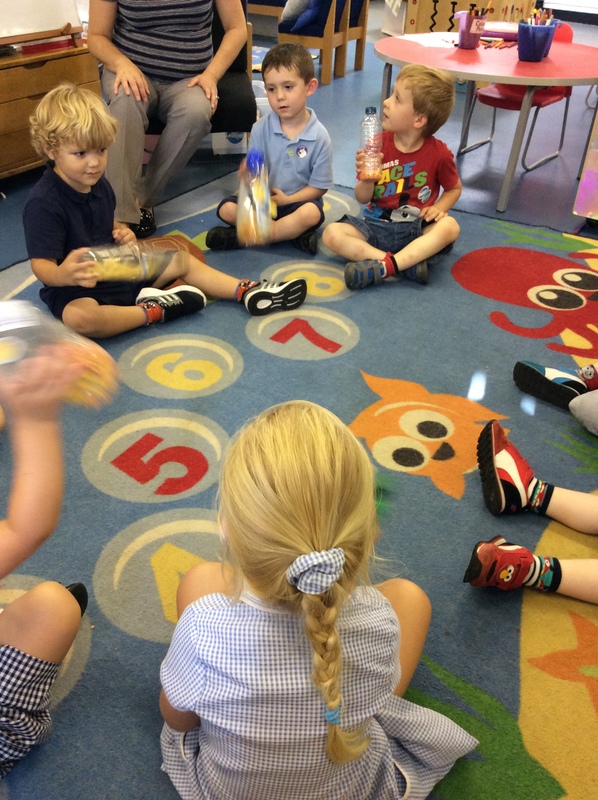 For Letters and Sounds the children made sound shakers. 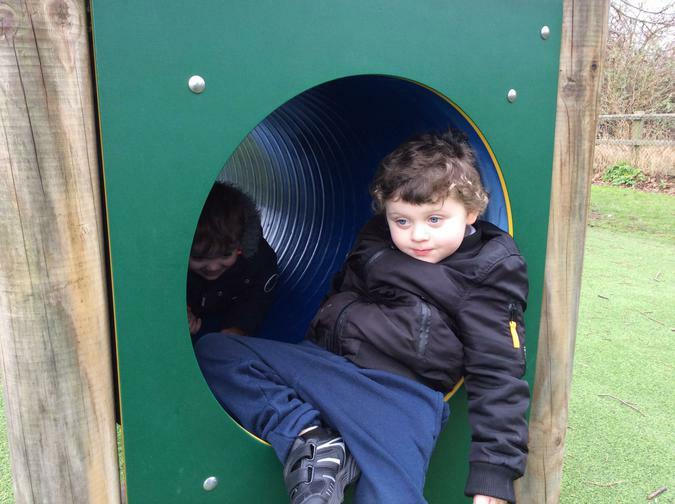 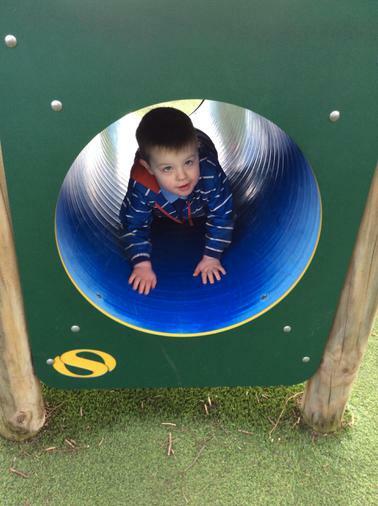 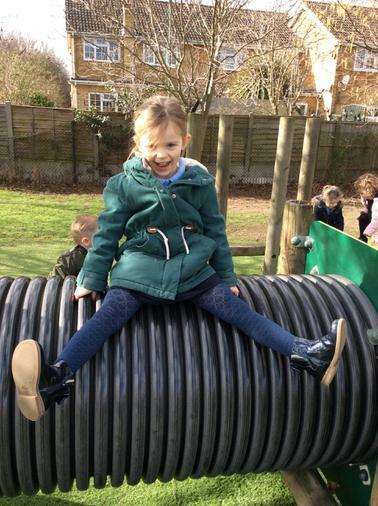 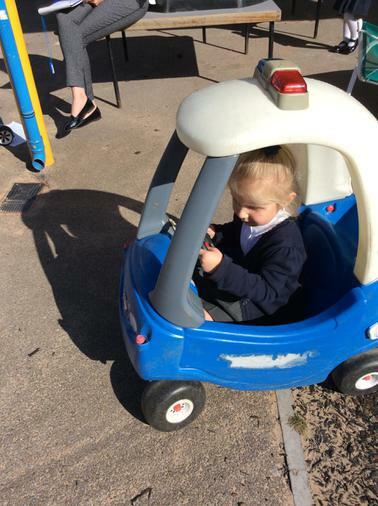 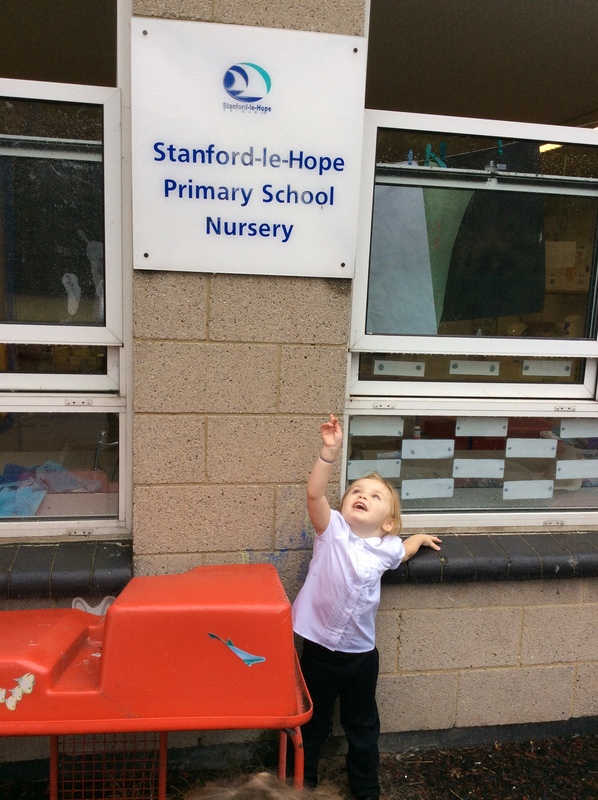 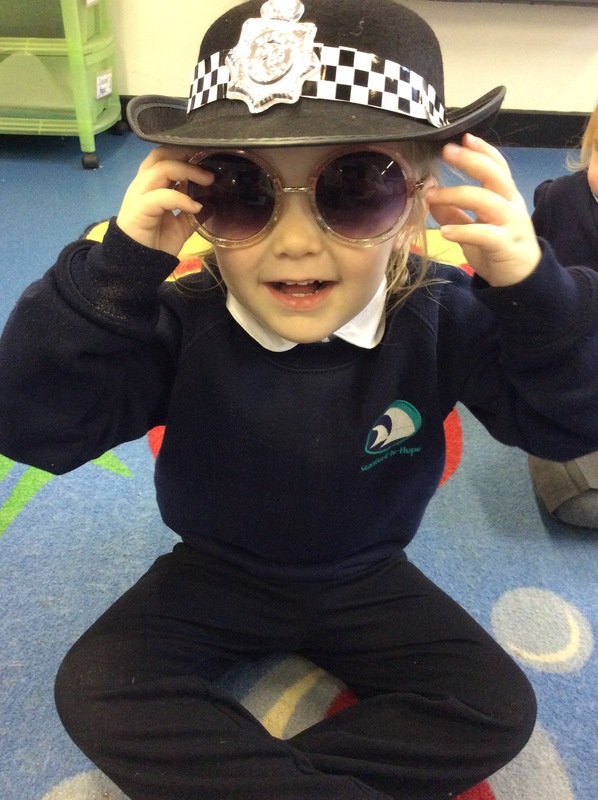 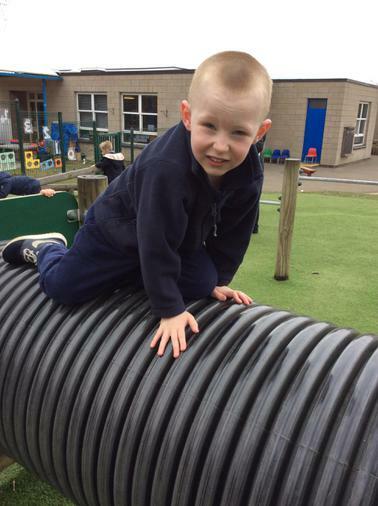 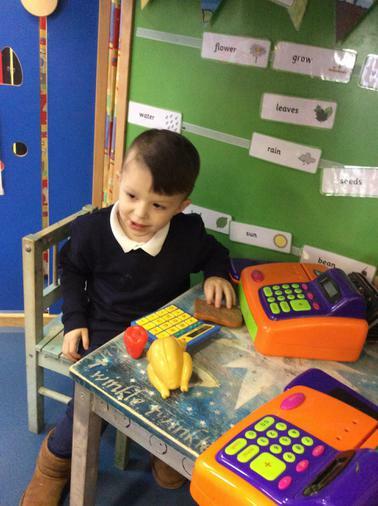 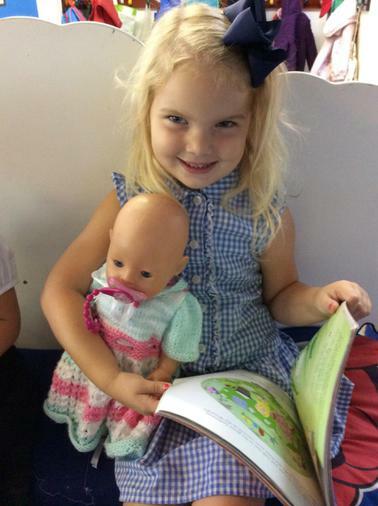 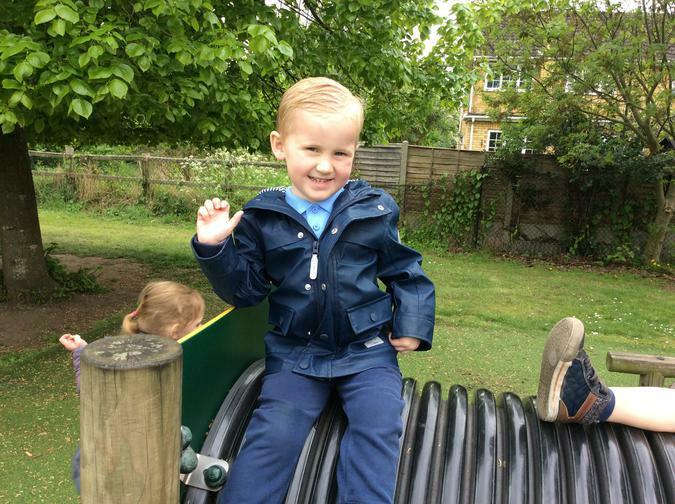 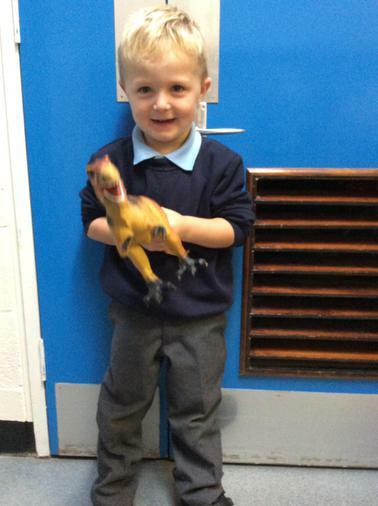 We had a special visitor to our Nursery this week, a postal worker. 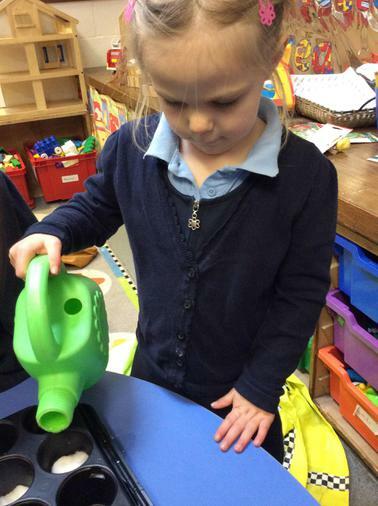 She talked about her job delivering parcels and letters and showed us her bright red bag. 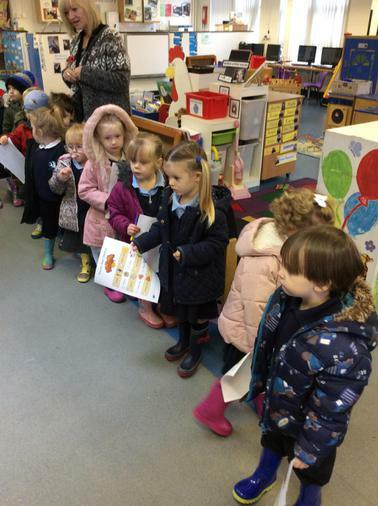 Afterwards, we wrote our own letters and posted them at our role play 'Post Office'. 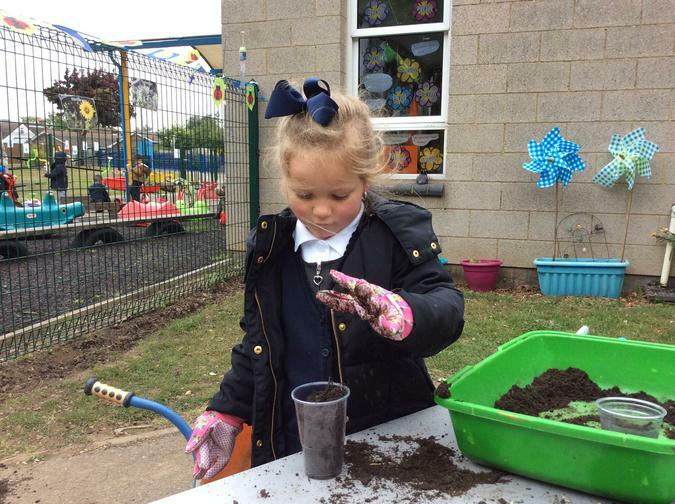 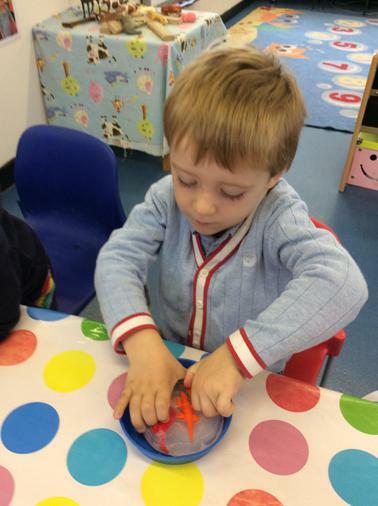 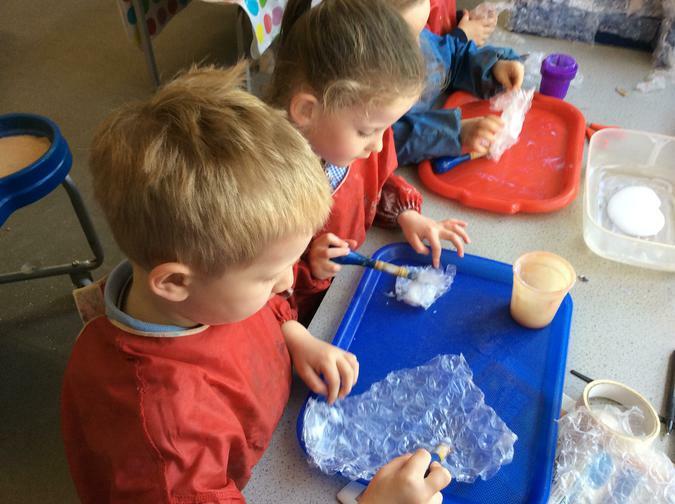 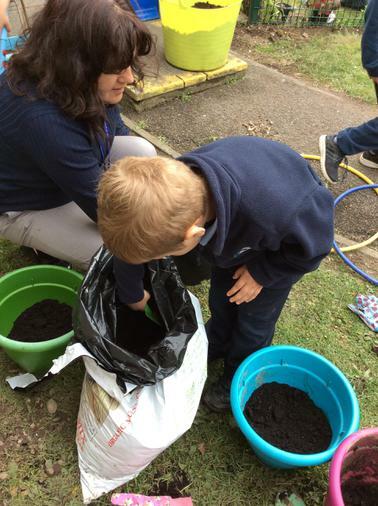 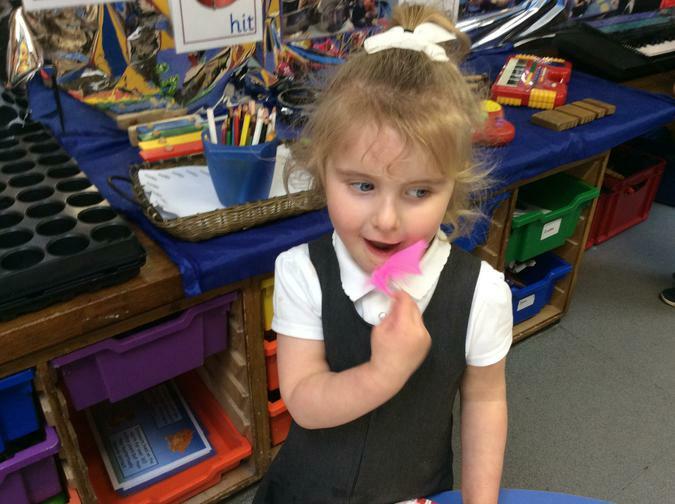 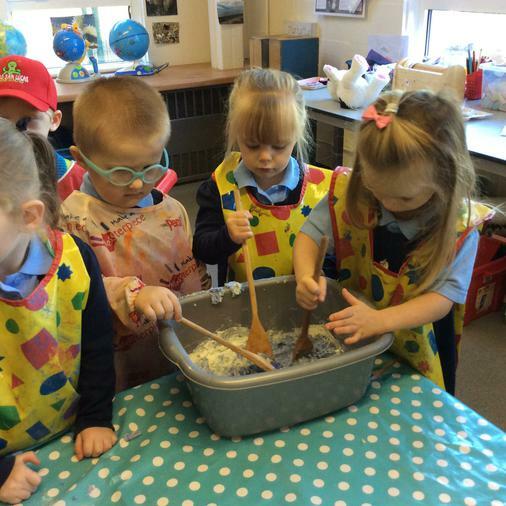 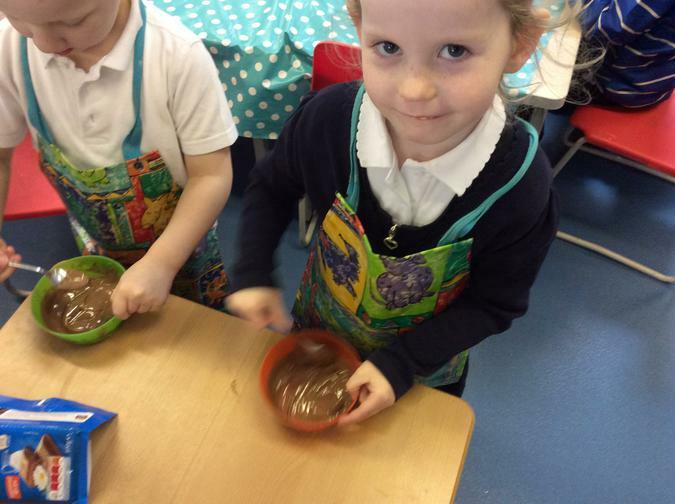 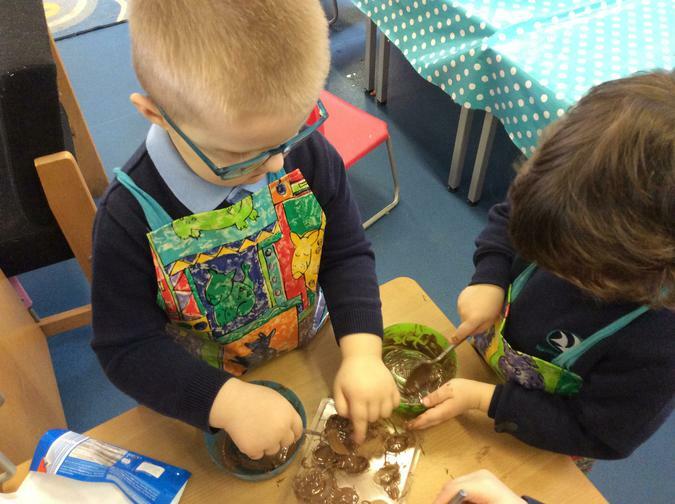 This week we have been exploring potato printing to create penguins and robins. 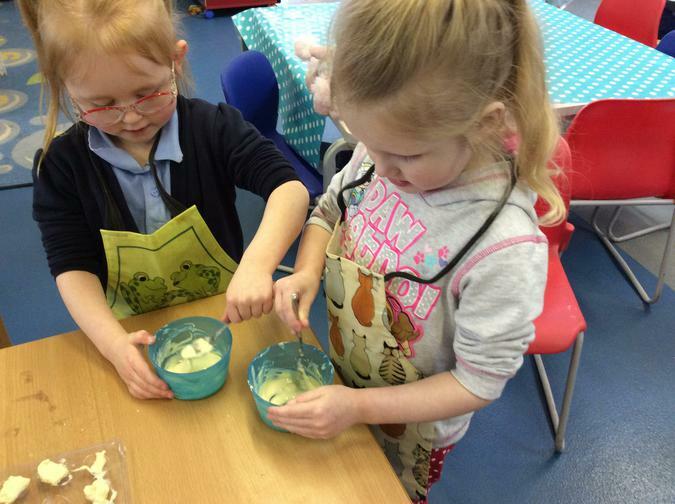 We made heart shaped biscuits to celebrate the end of our topic 'Why do you love me so much?' 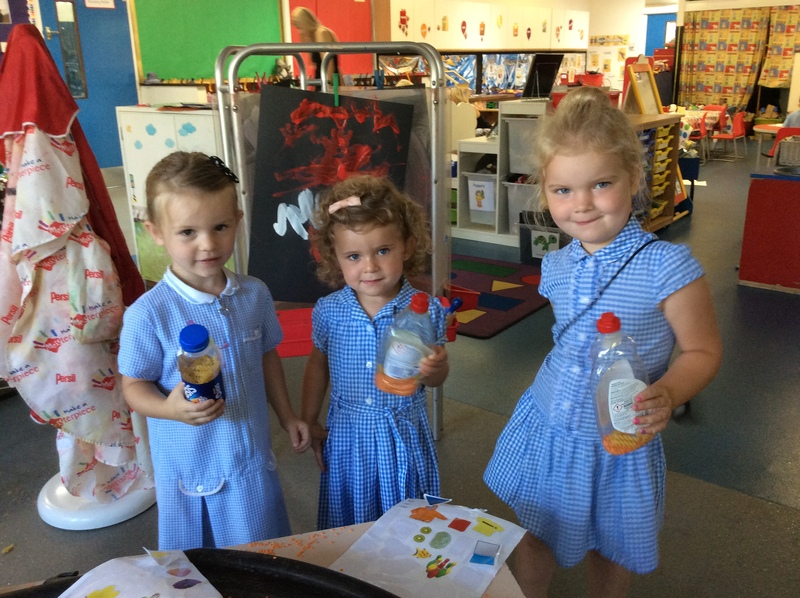 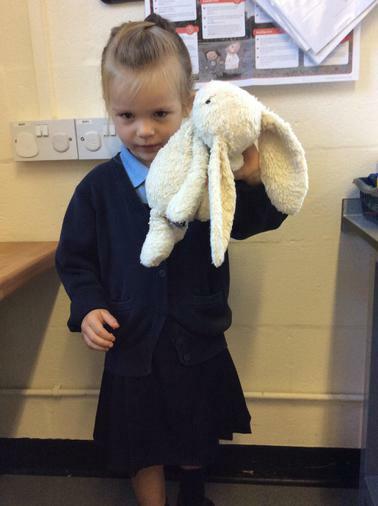 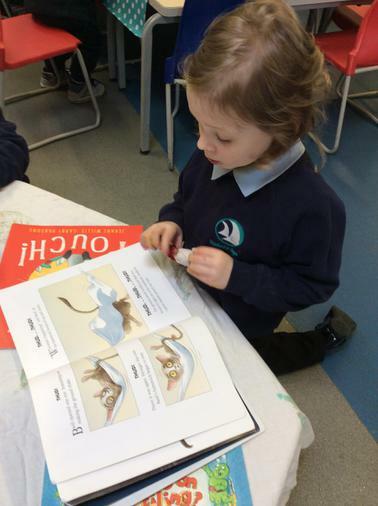 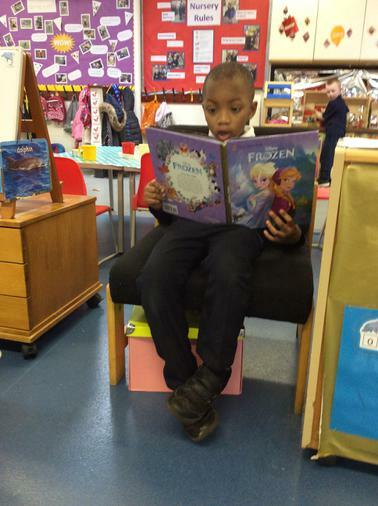 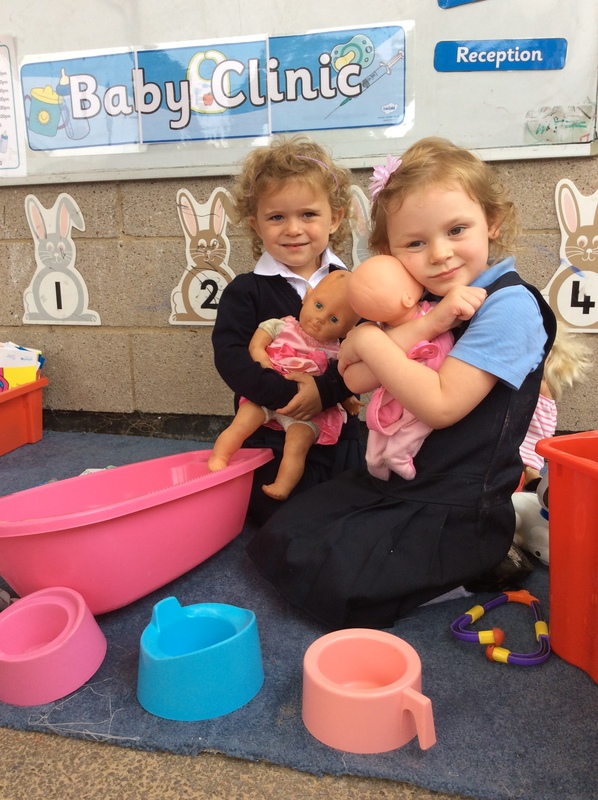 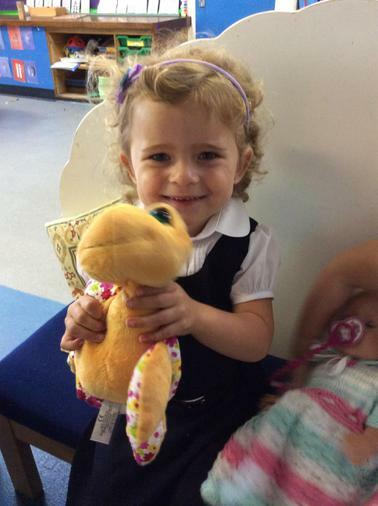 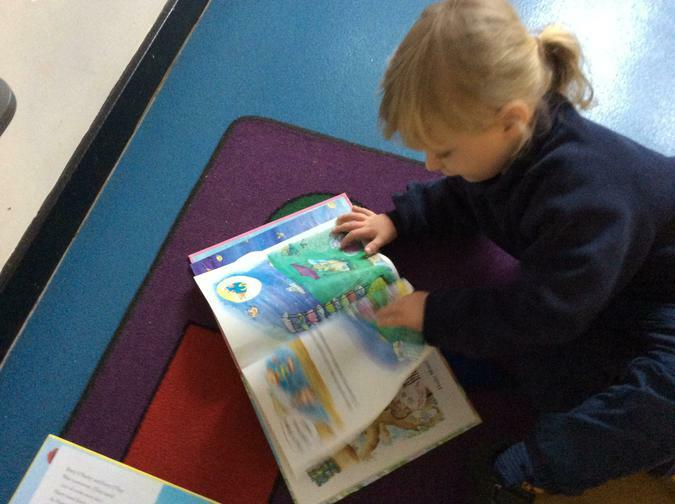 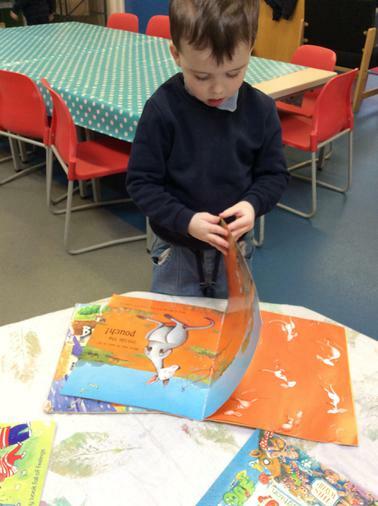 We shared them with our families when they came into Nursery to look at our Nursery Books and talk about our progress. 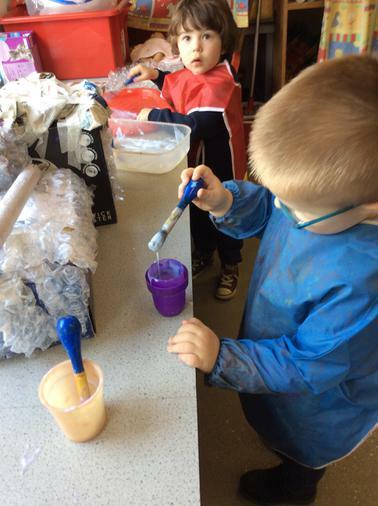 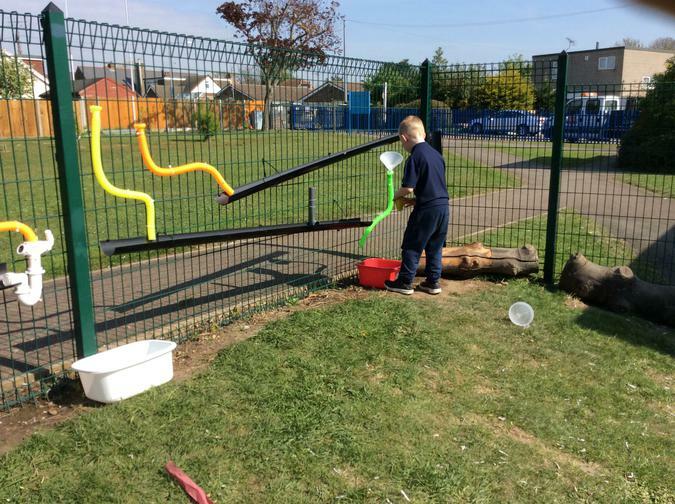 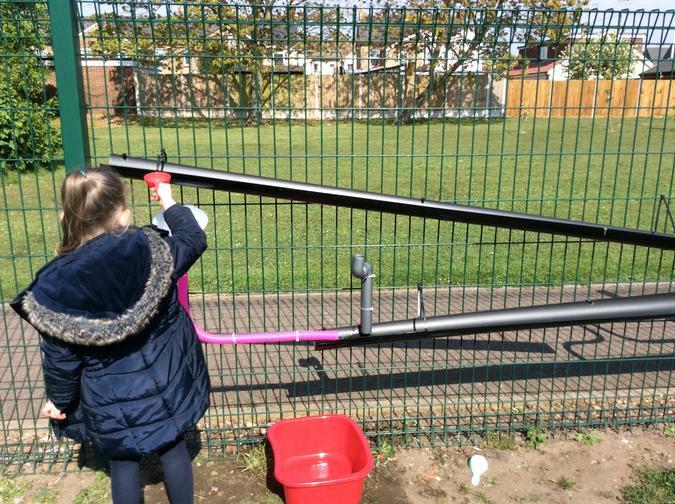 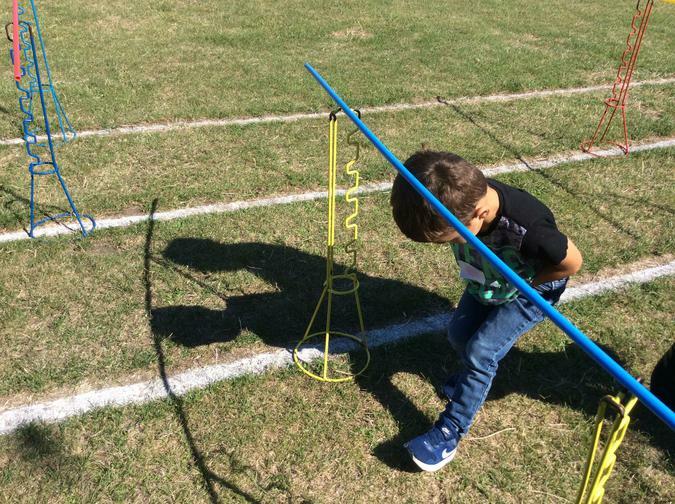 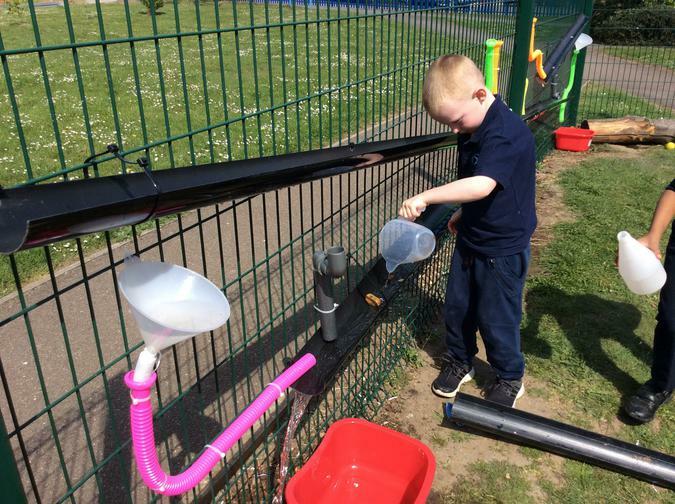 This week we had Mad Science day! 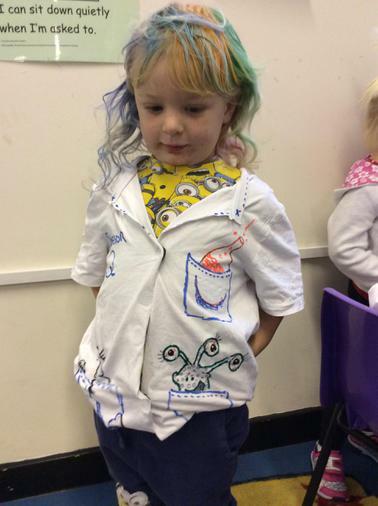 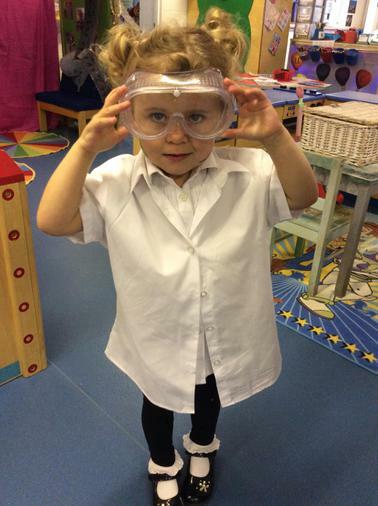 Some children took part in dressing up as MAD scientists. 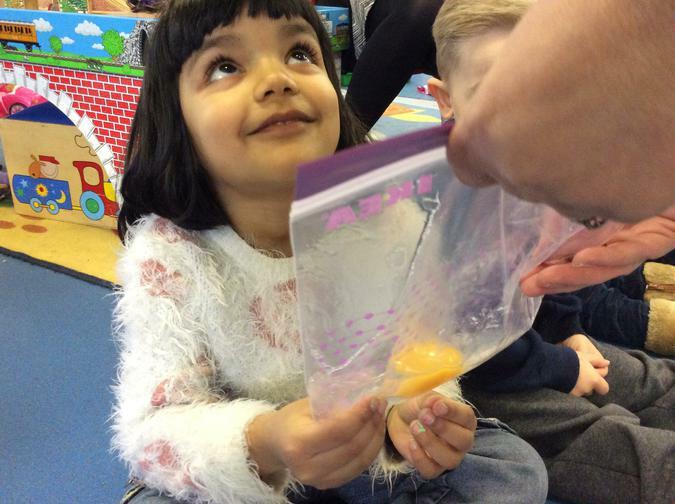 We investigated what happens to jelly cubes in the microwave, and then we put it in the fridge. 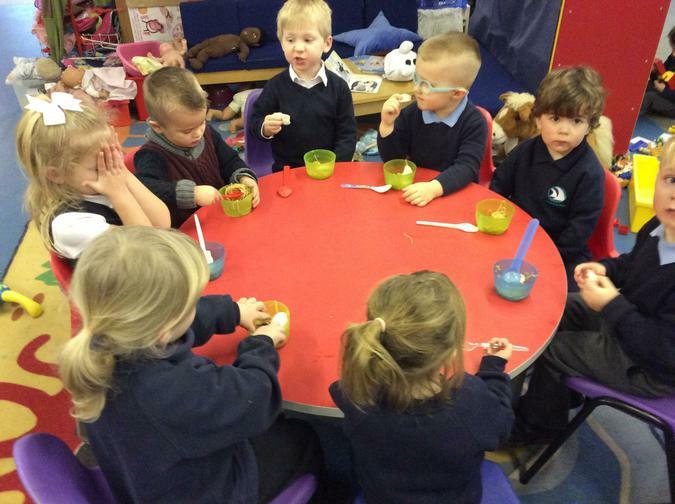 We discussed what the jelly, looked, smelt and felt like. 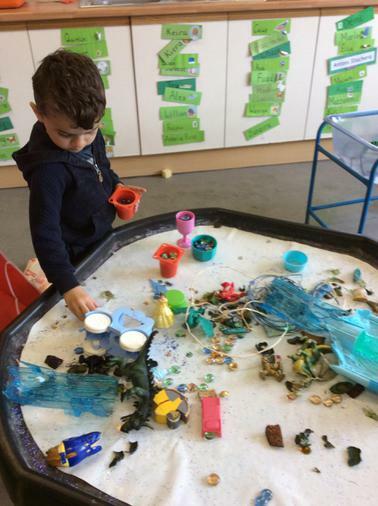 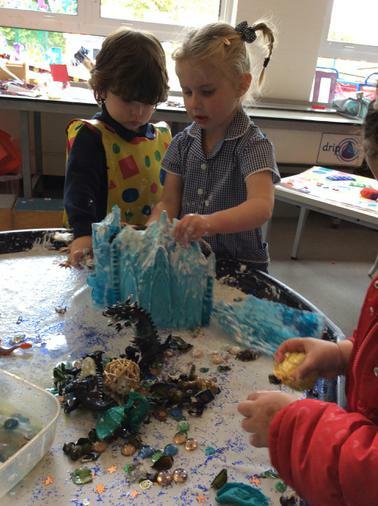 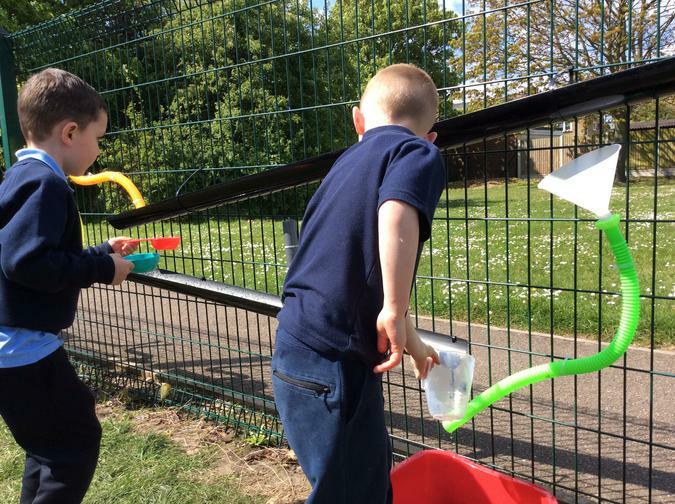 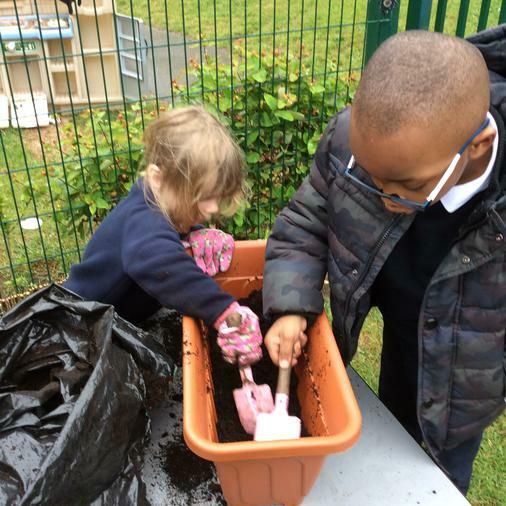 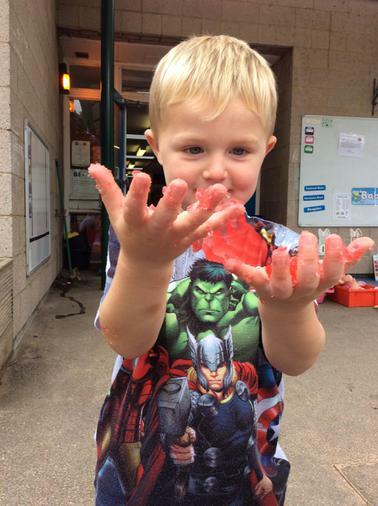 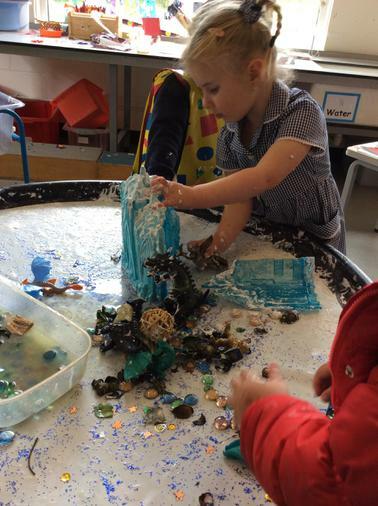 We also watched ice melt throughout the session and discovered that there were toys frozen in the ice, which later turned into water! 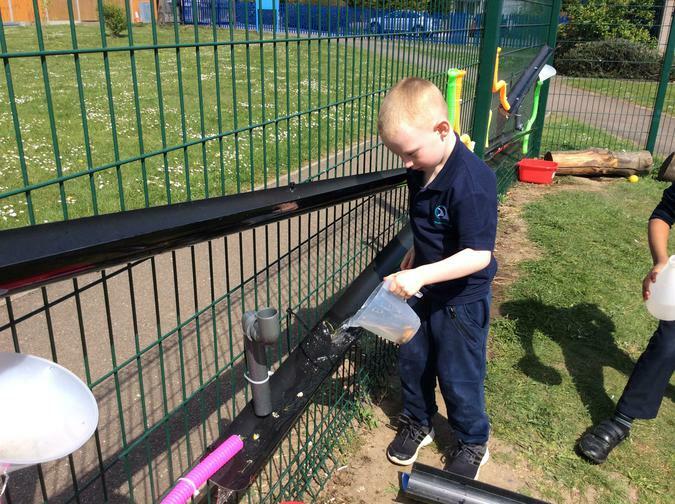 Finally we discovered the changes of micro beads when adding them to water. 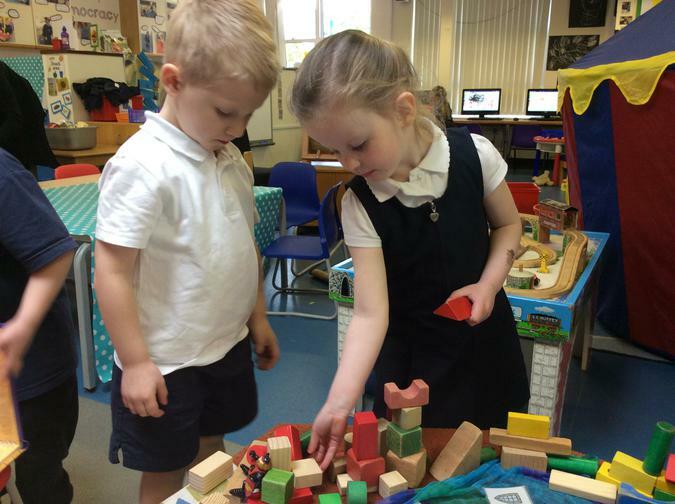 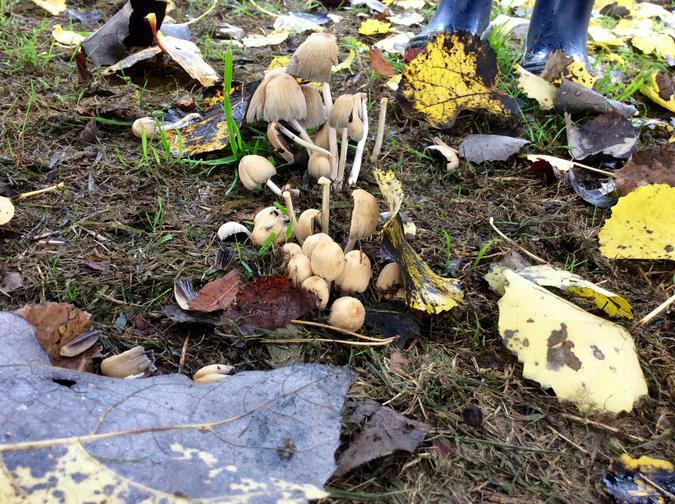 We saw them grow and expand shape! 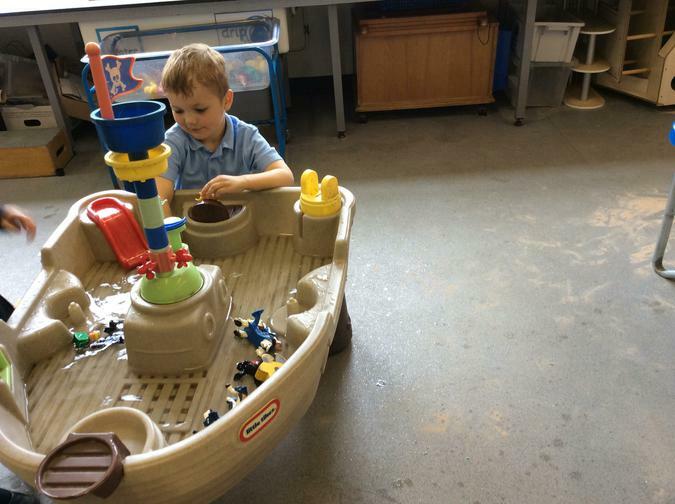 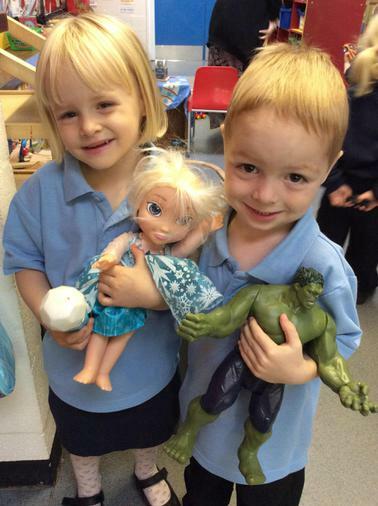 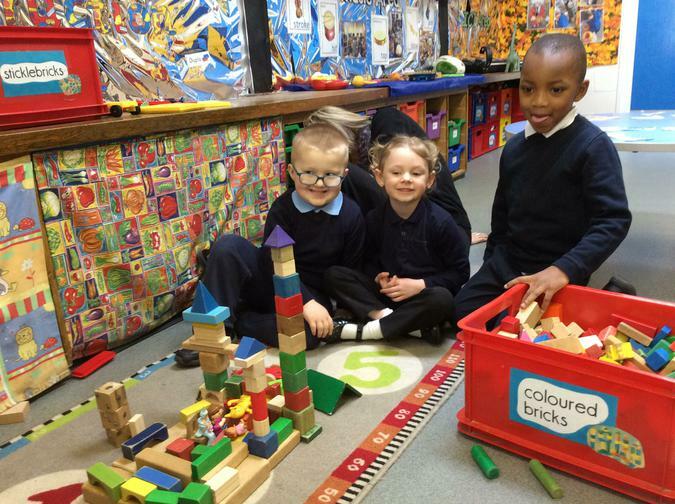 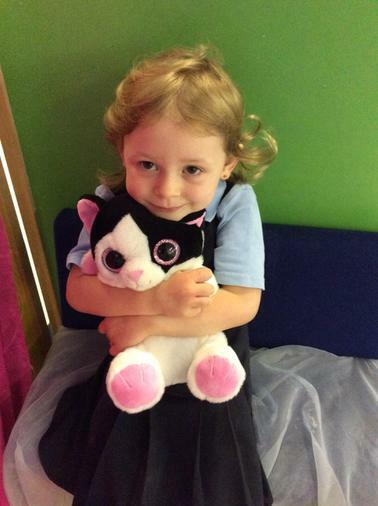 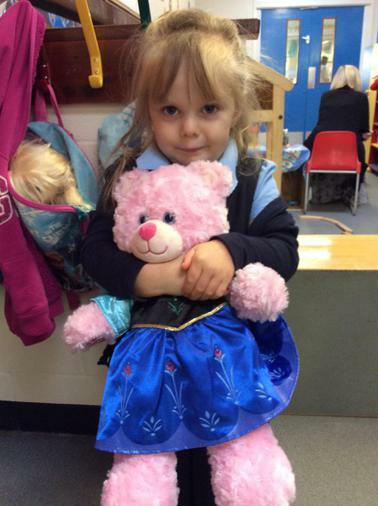 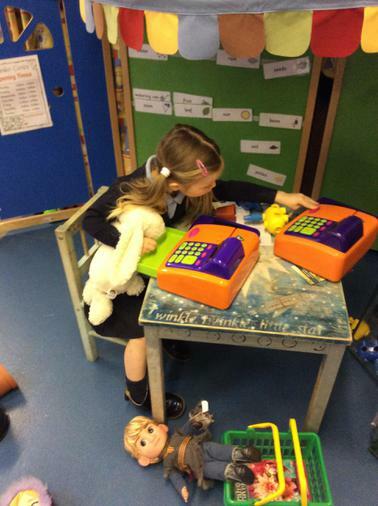 The children brought in their toys from home, to share them with their friends. 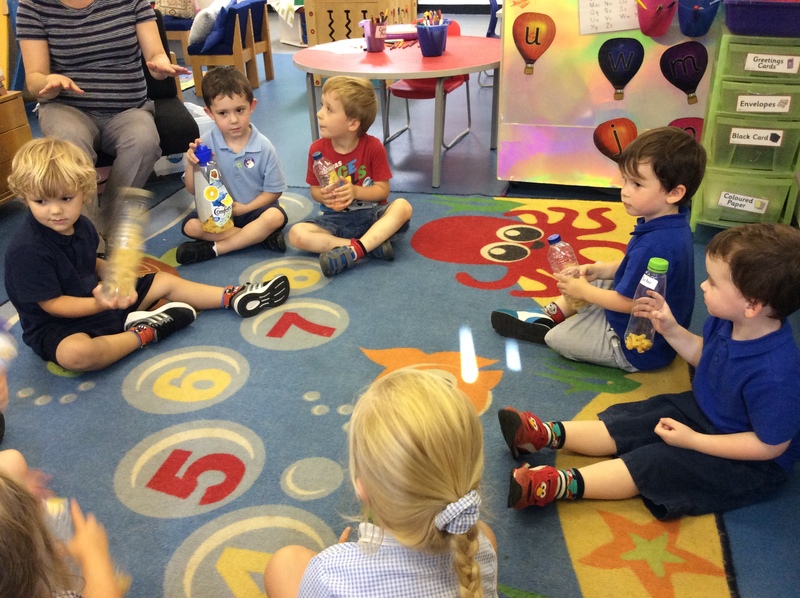 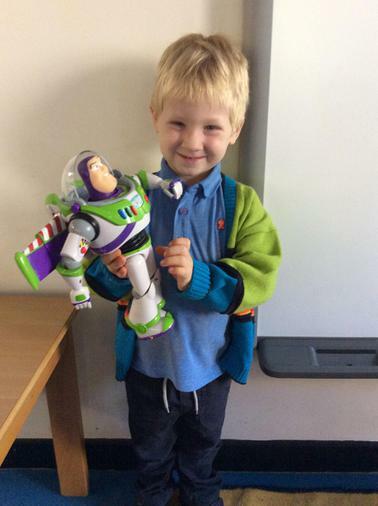 In group time the children spoke about their toys and why they are their favourite. 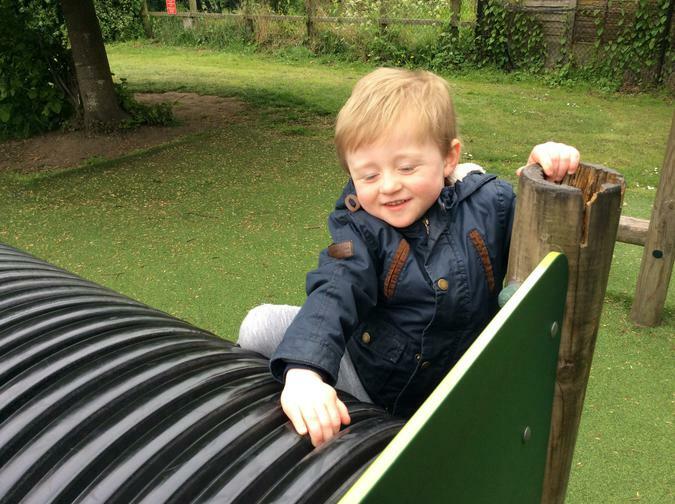 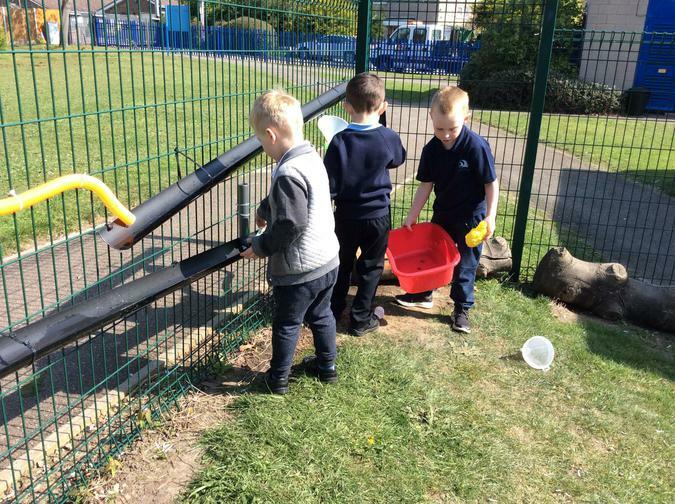 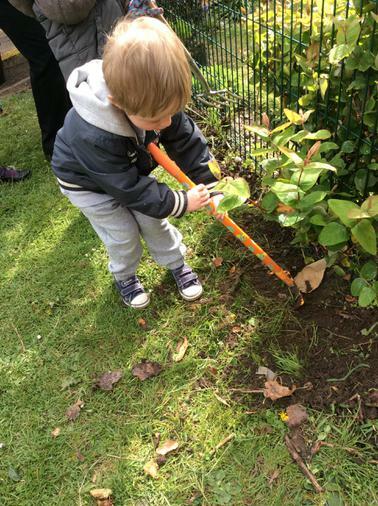 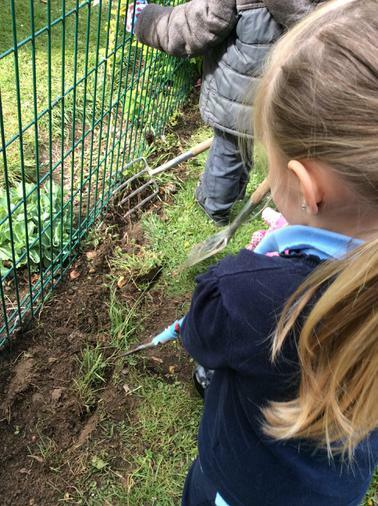 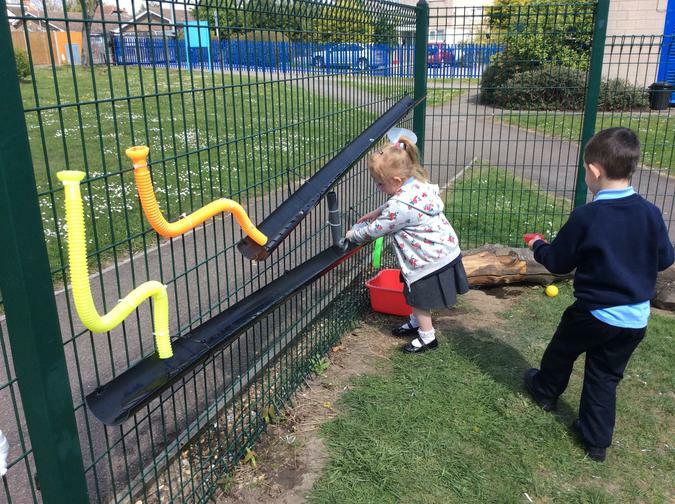 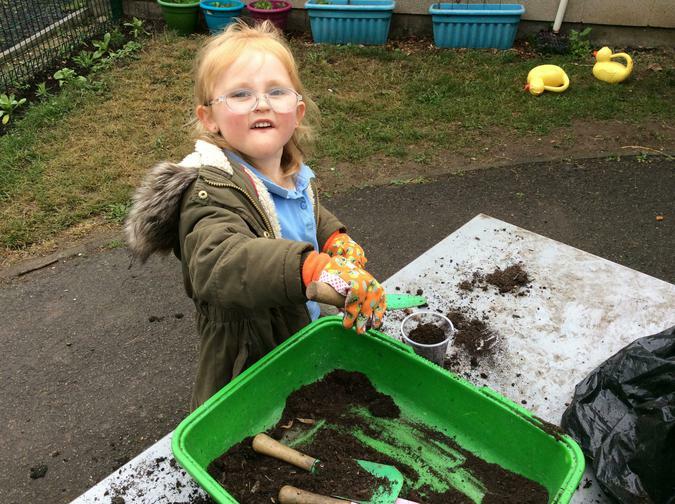 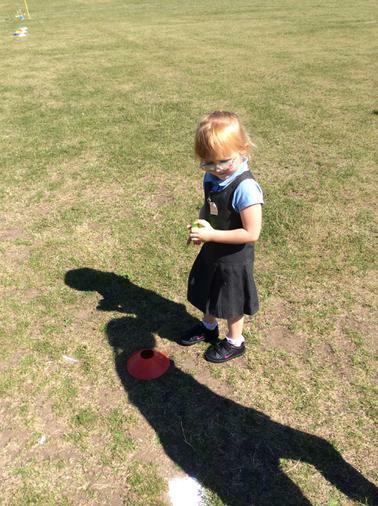 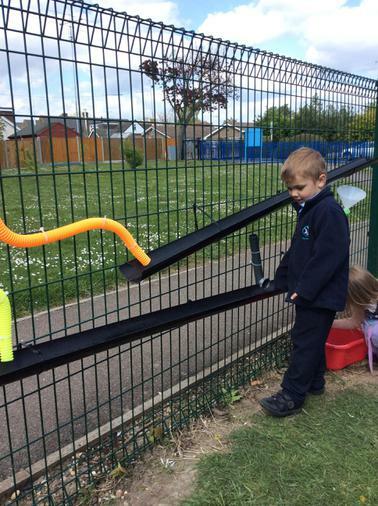 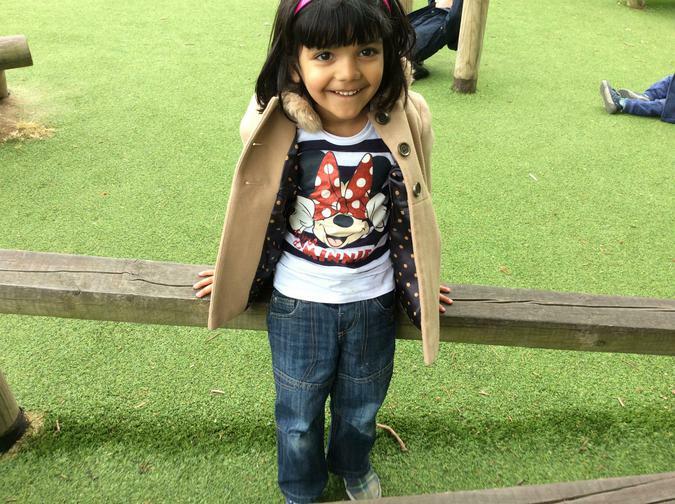 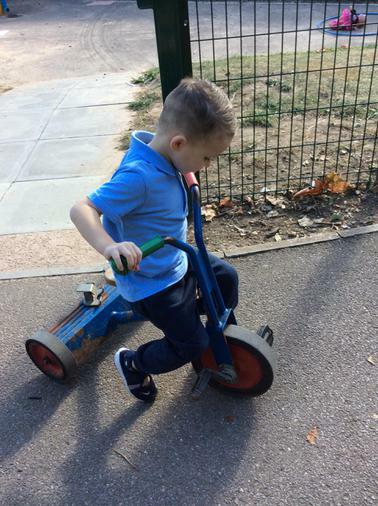 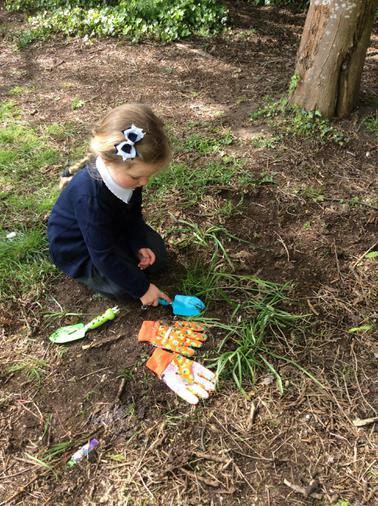 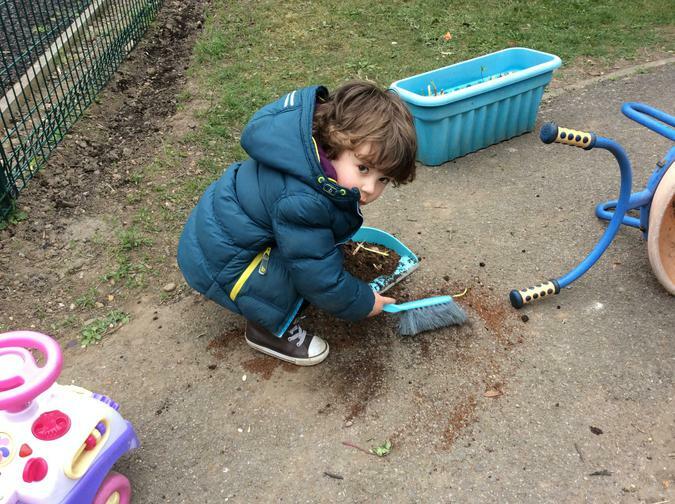 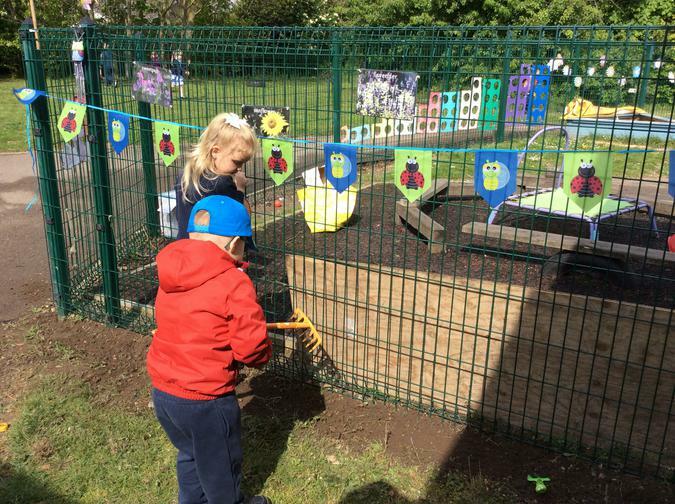 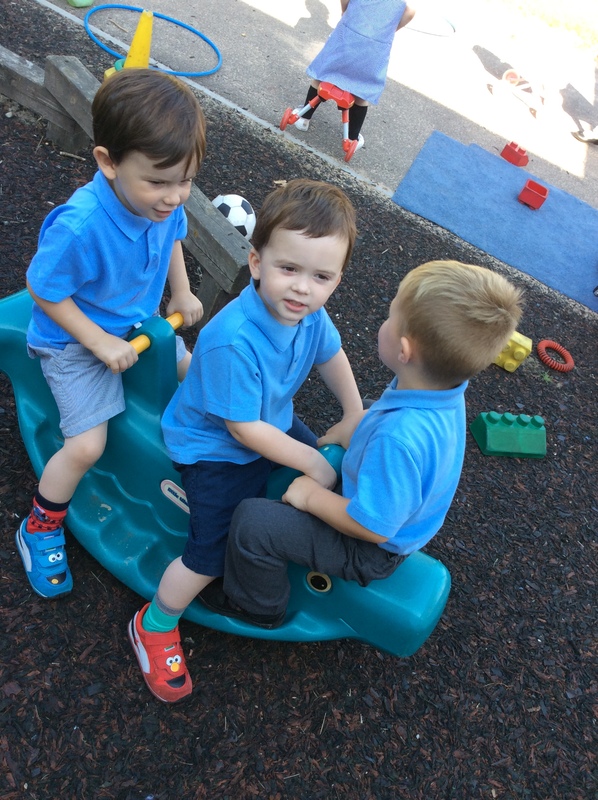 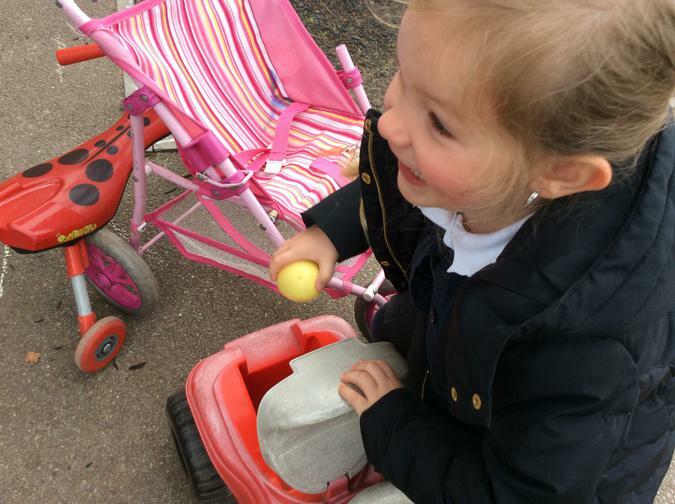 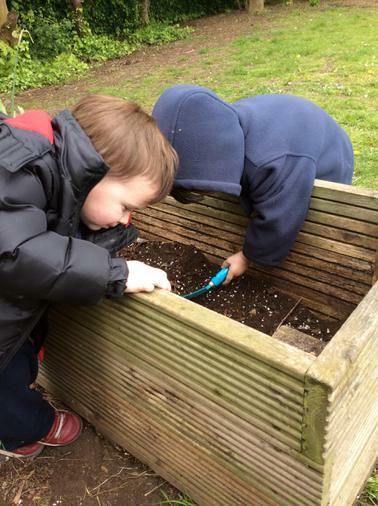 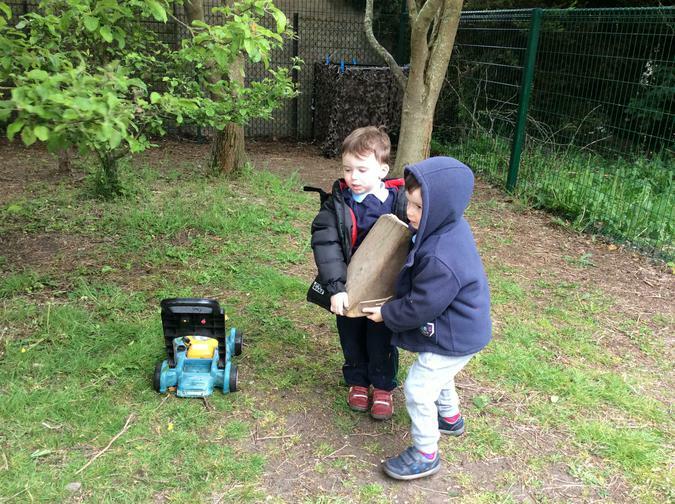 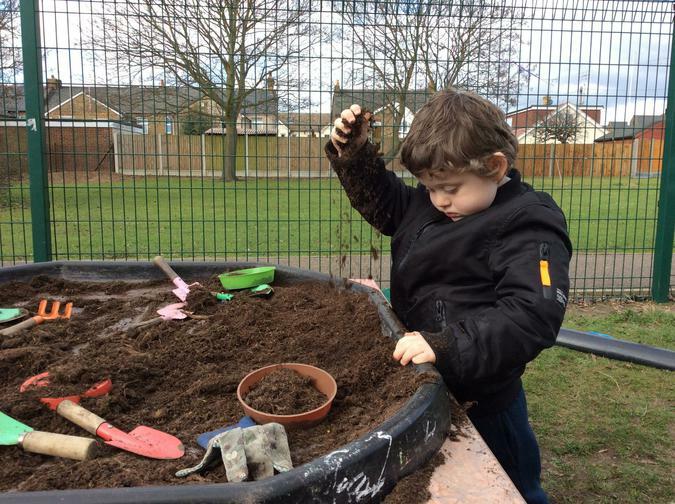 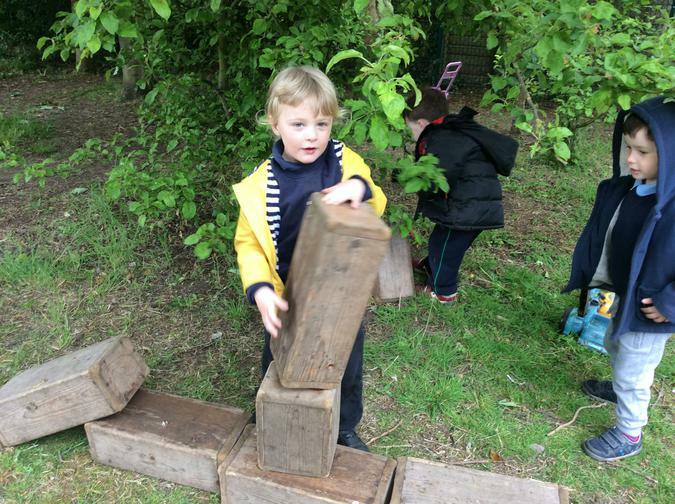 In the garden this week we have had the cars and bikes out, we have been learning to take turns. 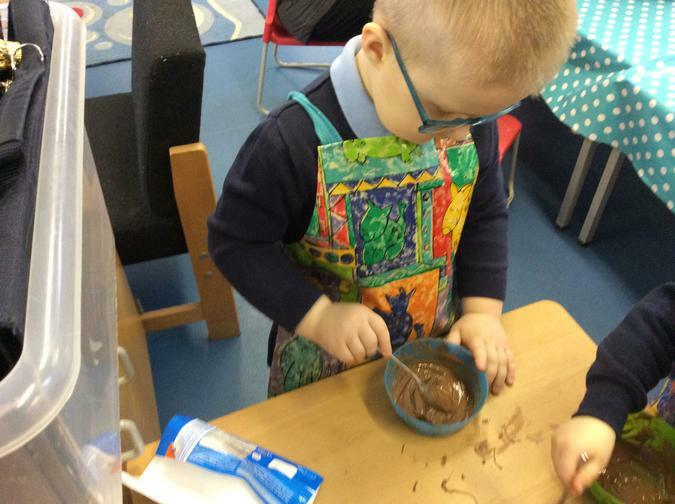 On a weekly basis we make playdough. 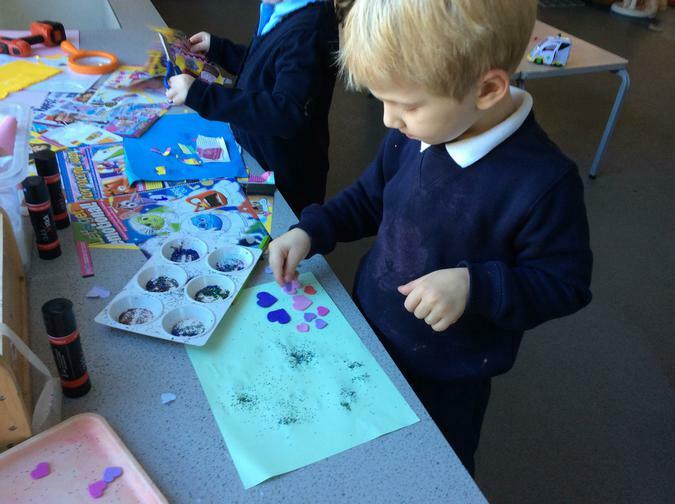 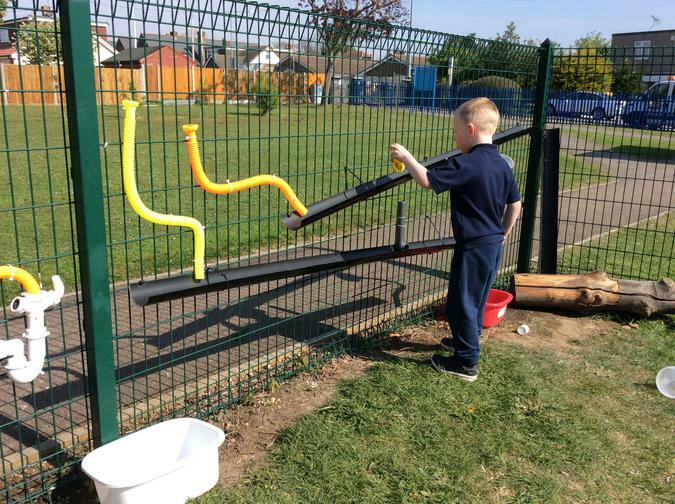 This week we made two different colours and mixed them together. 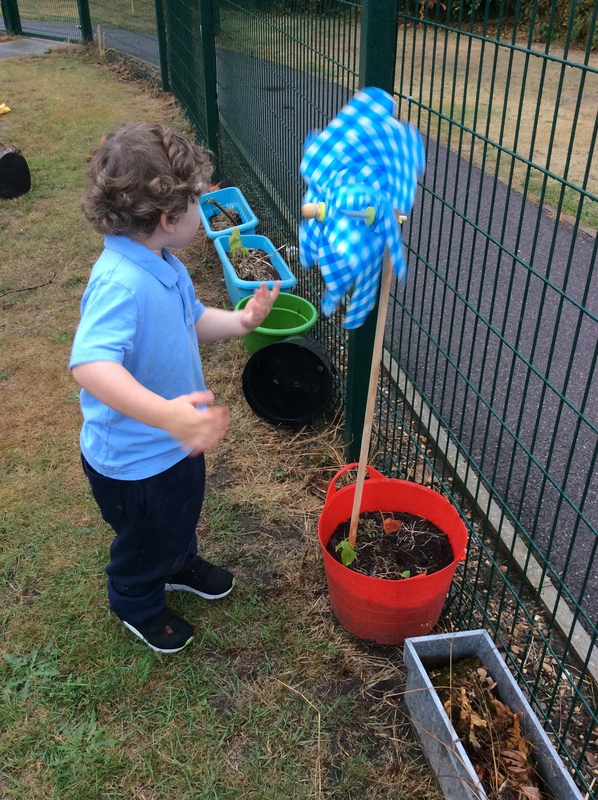 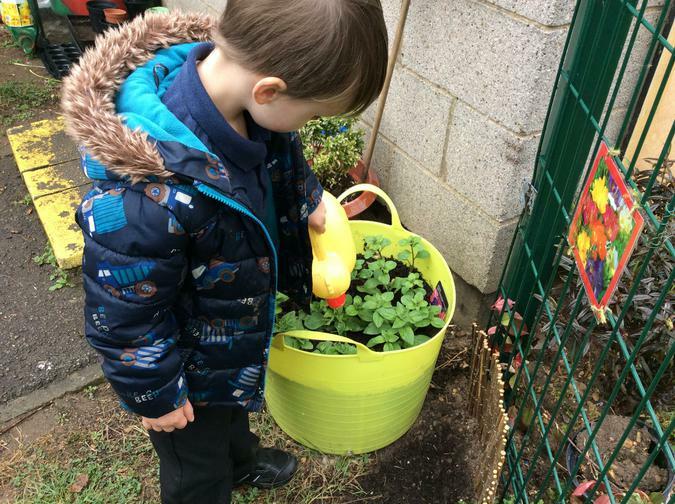 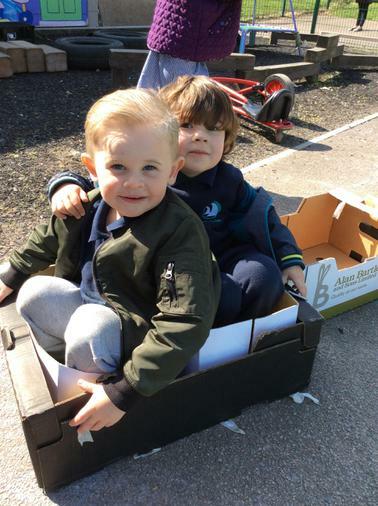 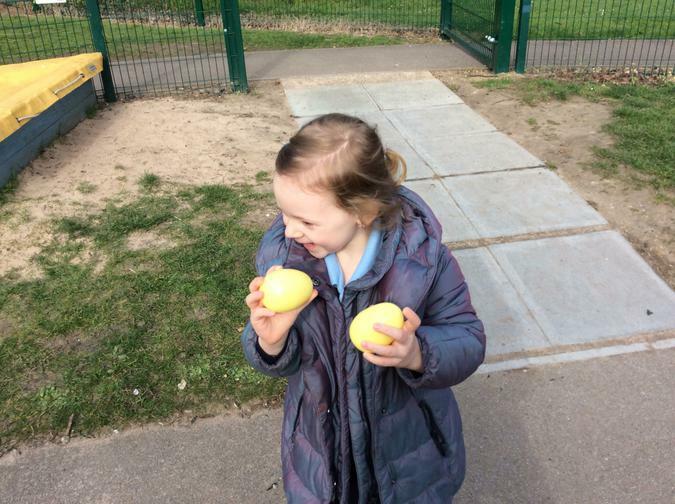 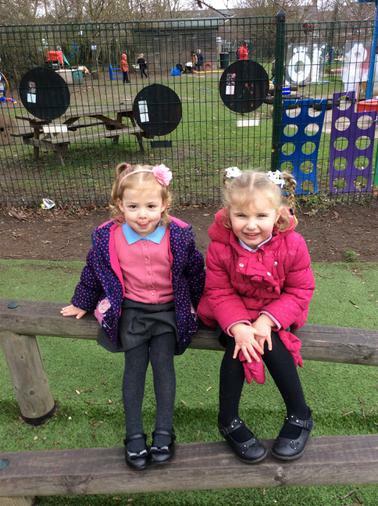 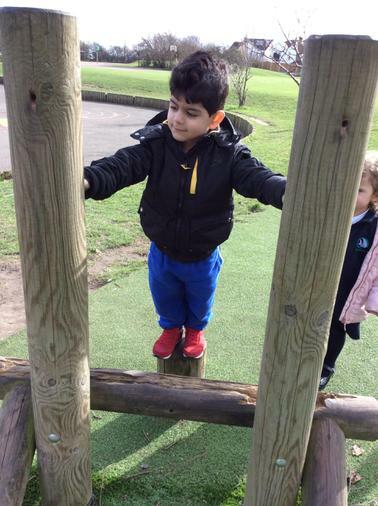 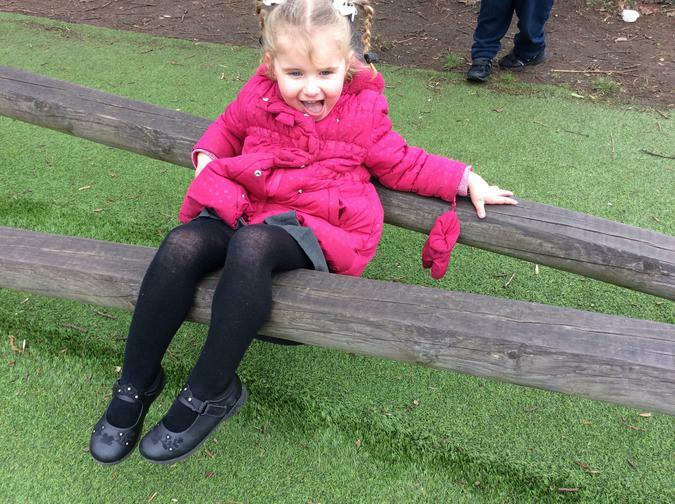 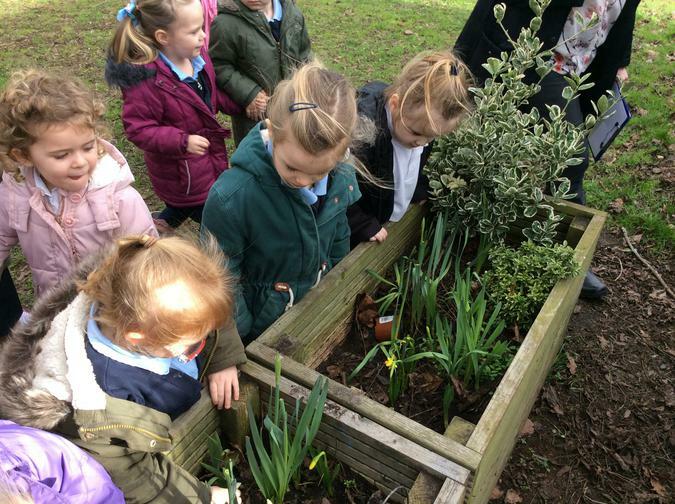 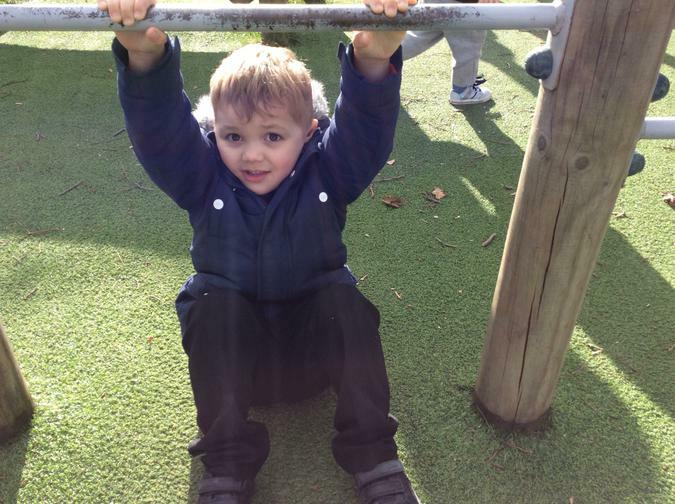 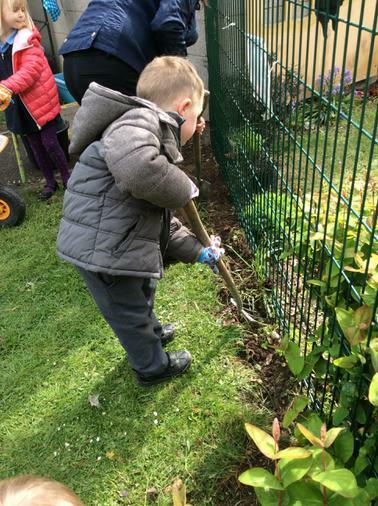 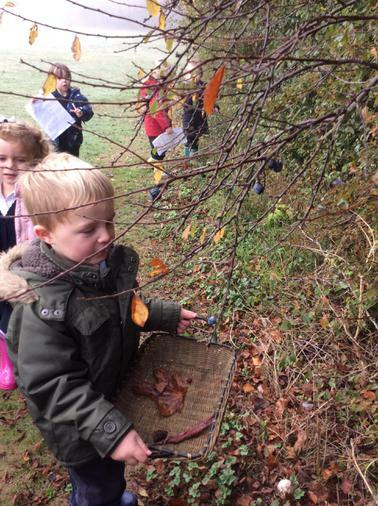 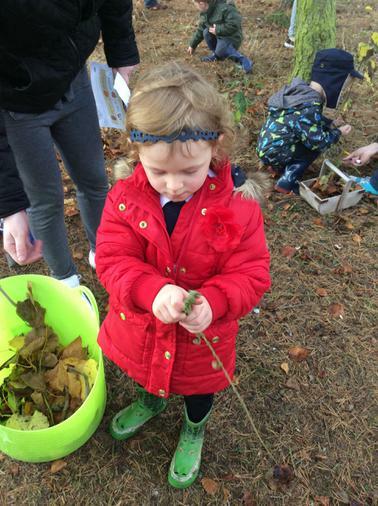 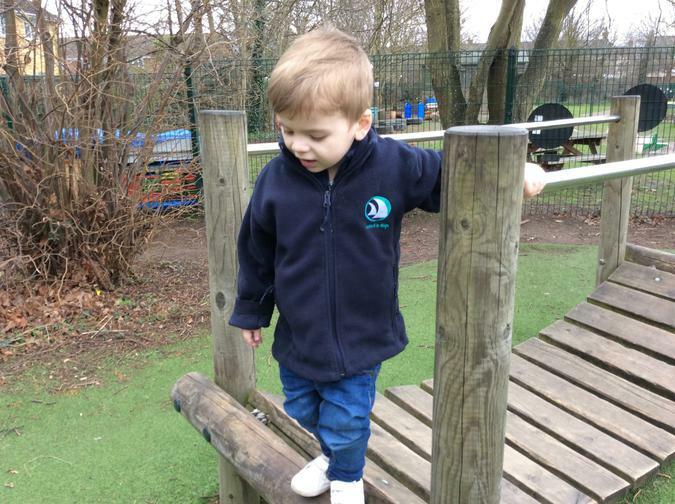 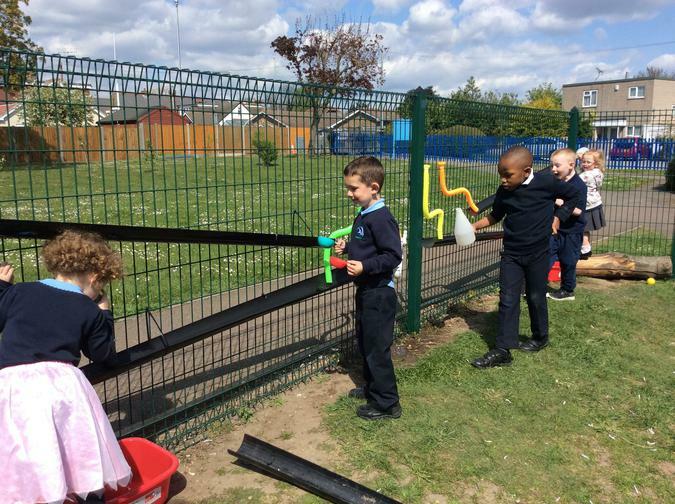 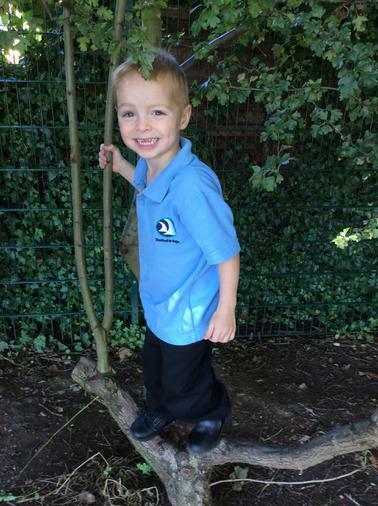 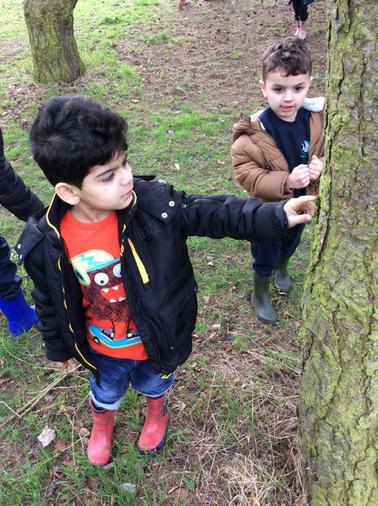 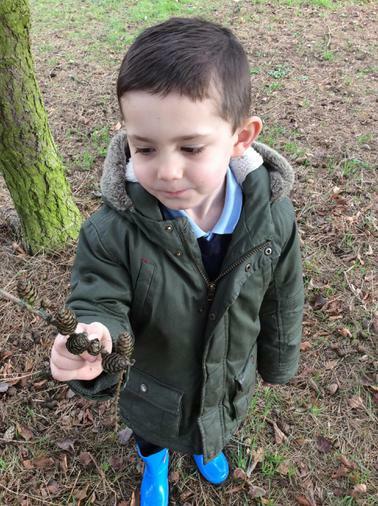 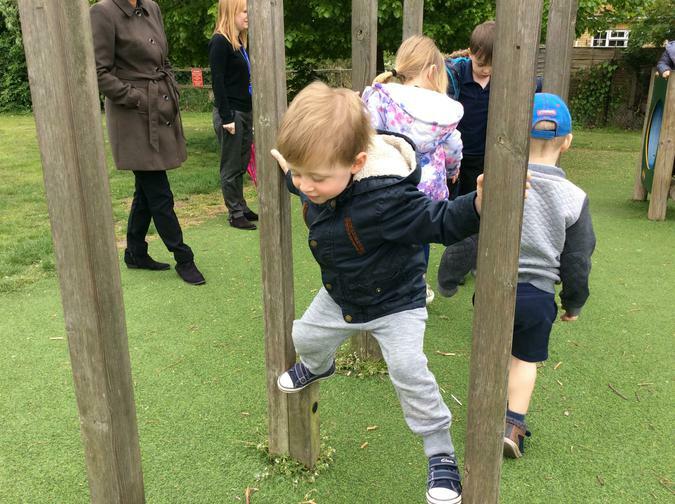 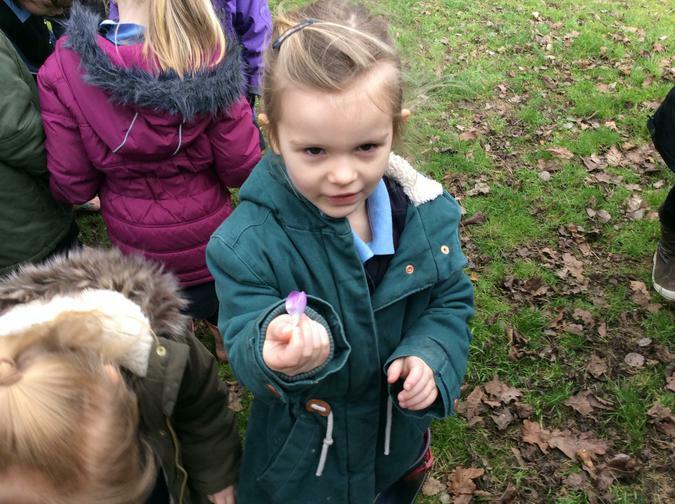 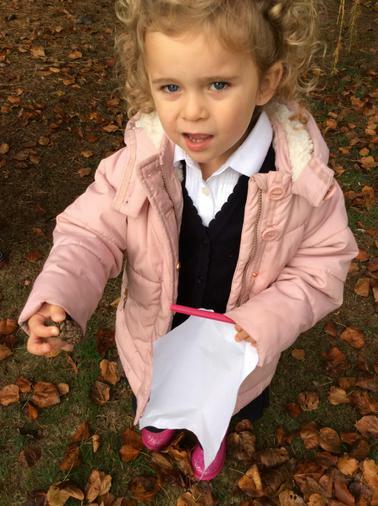 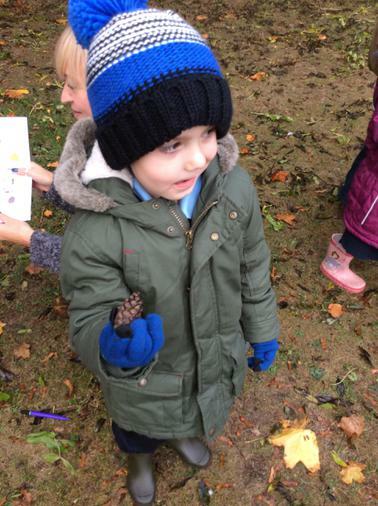 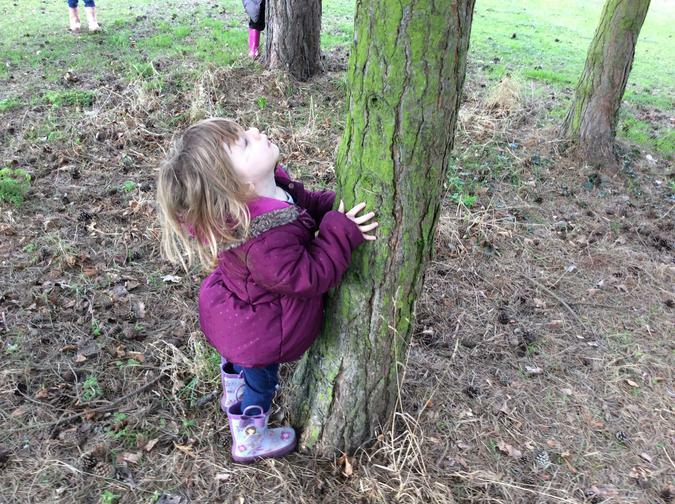 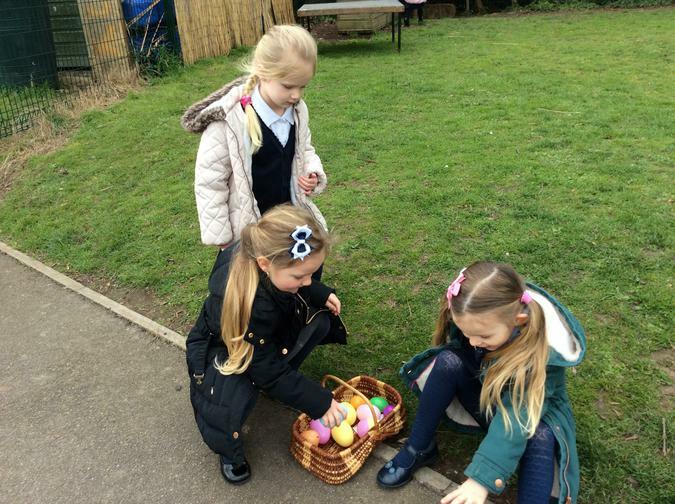 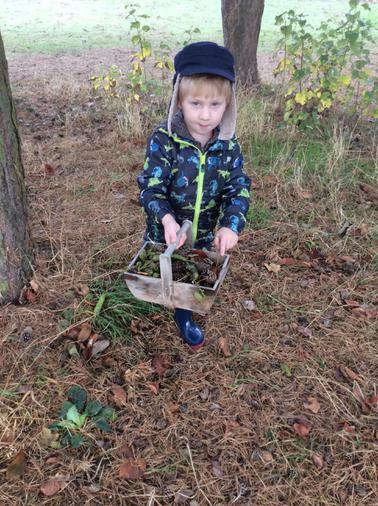 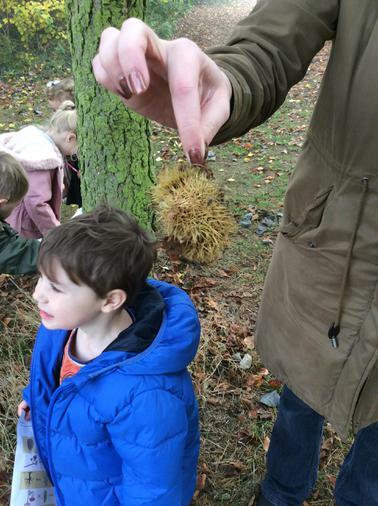 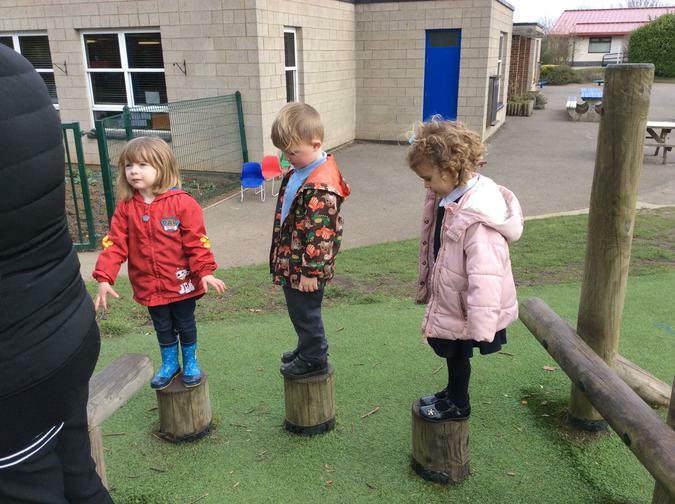 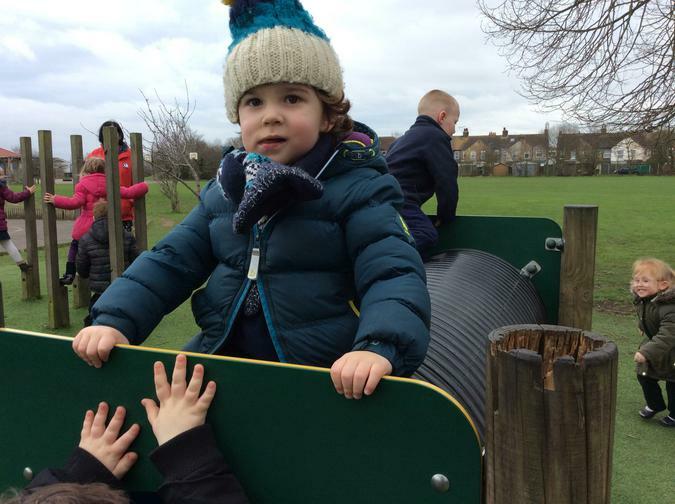 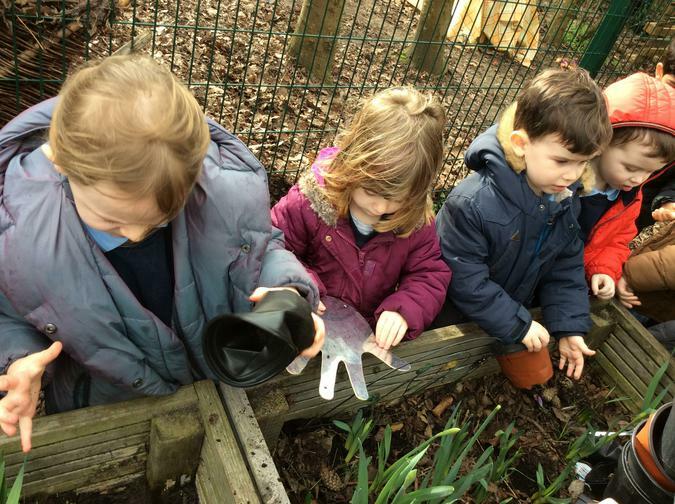 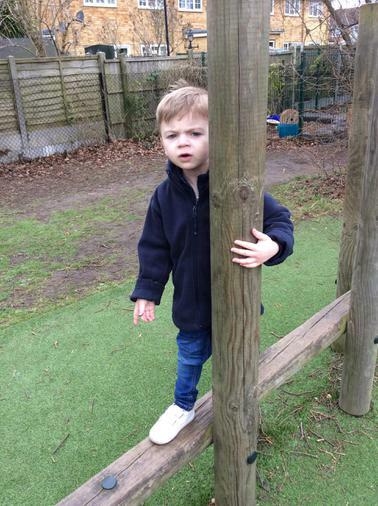 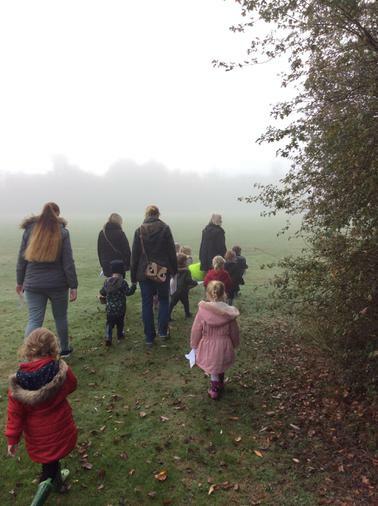 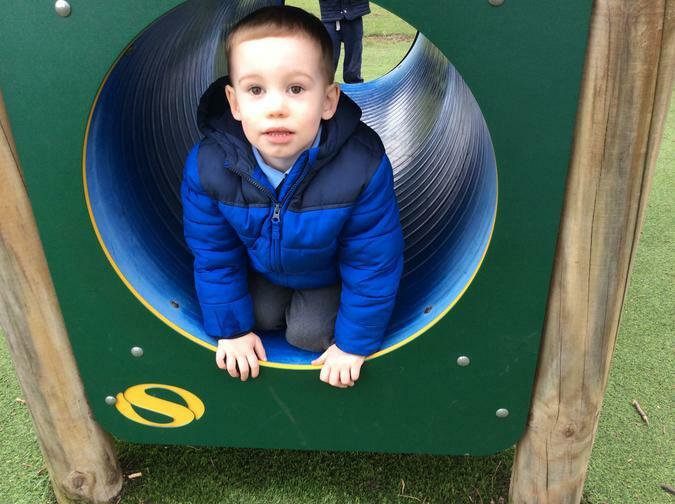 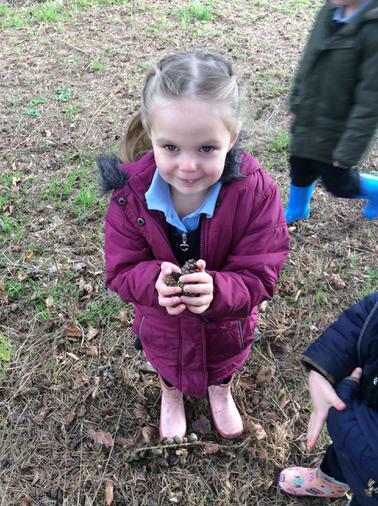 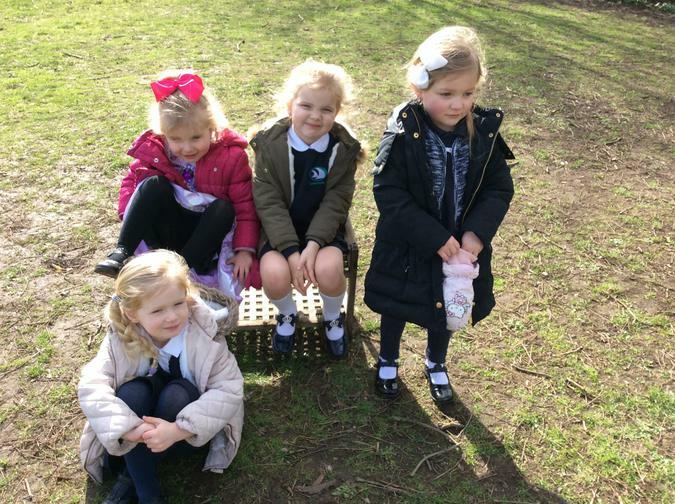 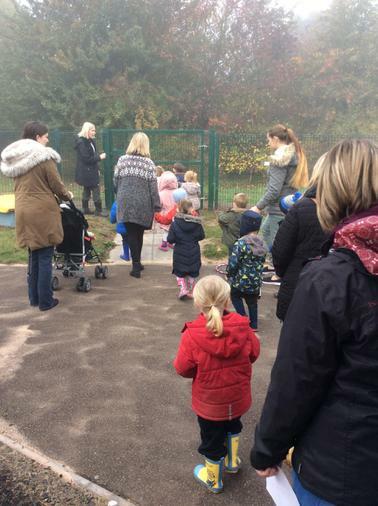 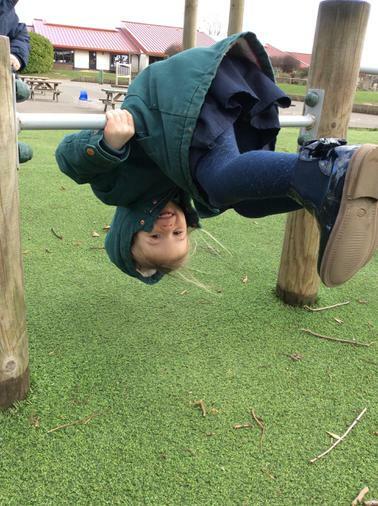 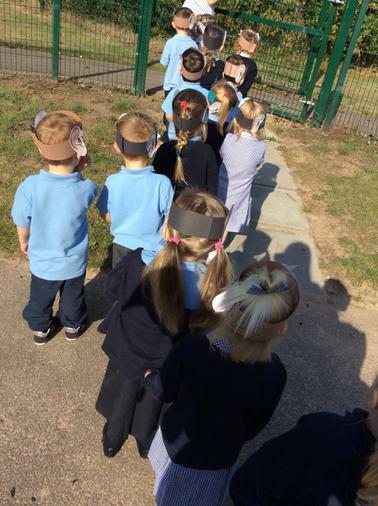 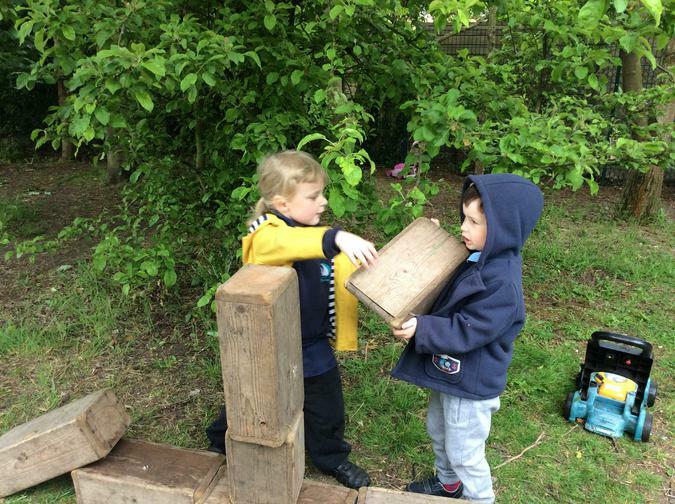 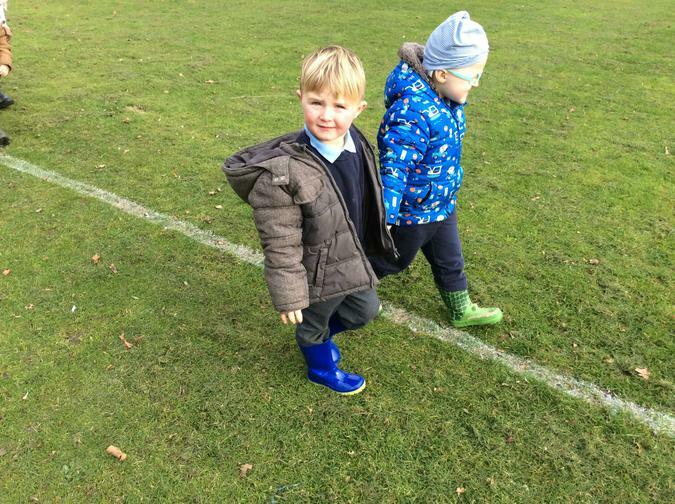 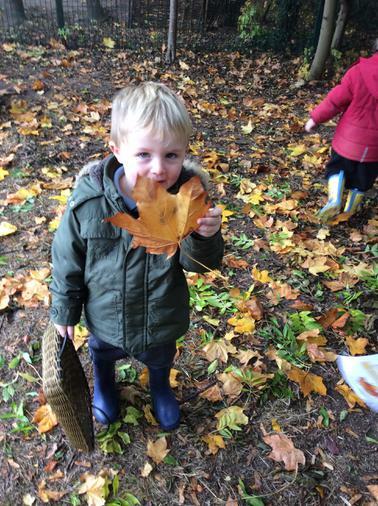 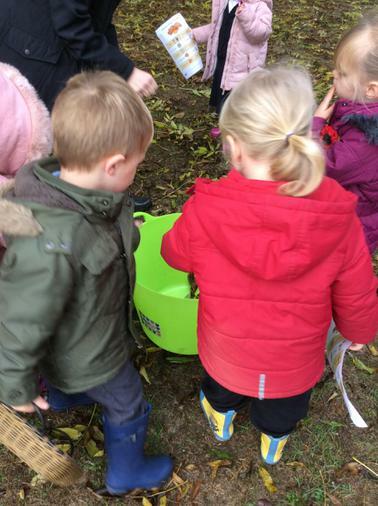 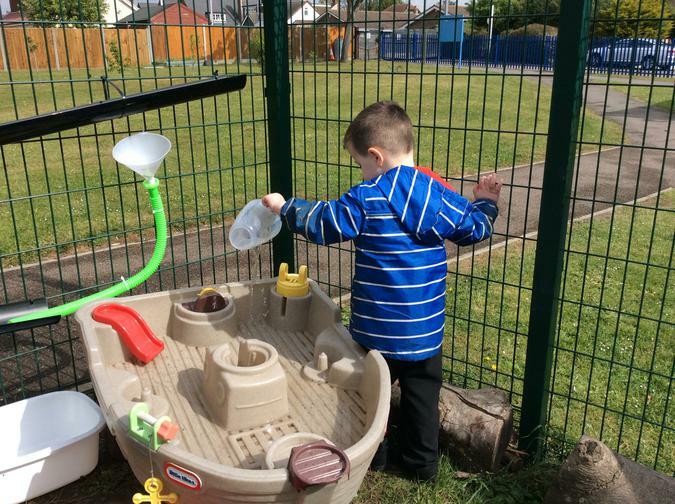 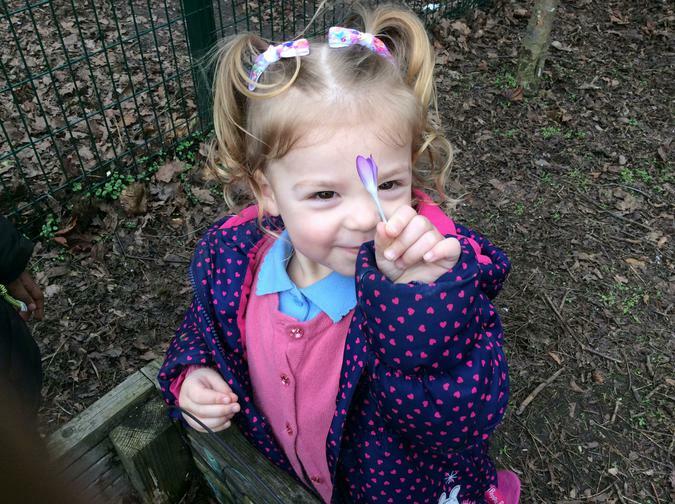 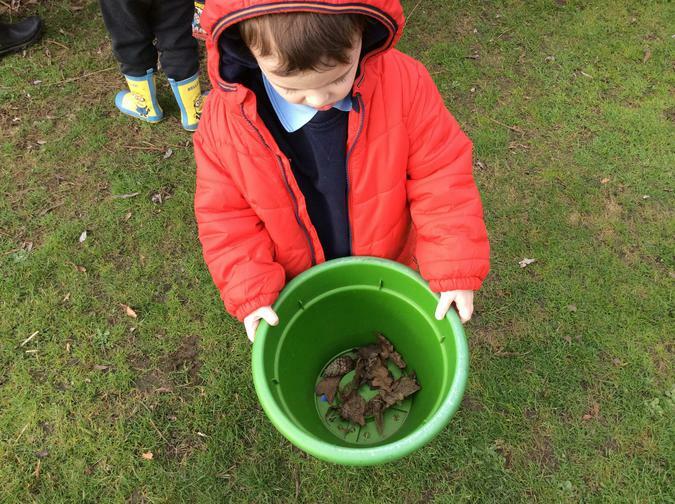 This week at nursery the children have been on a listening walk in the garden, we heard cars, water, leaves and the wind blowing in the trees. 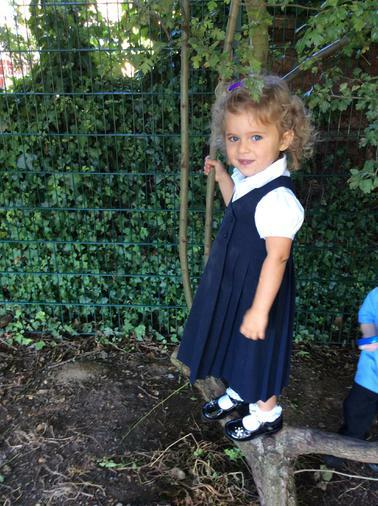 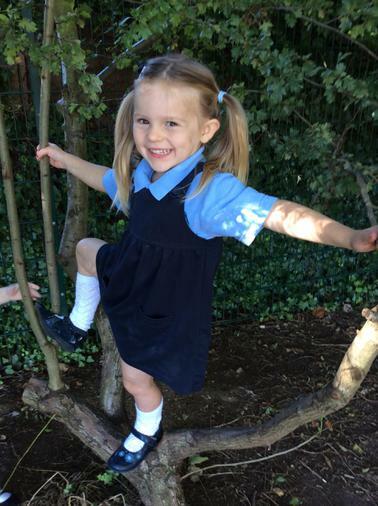 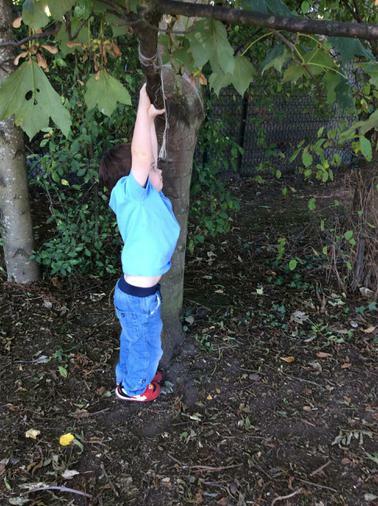 Also in the garden the children have been exploring in the trees. 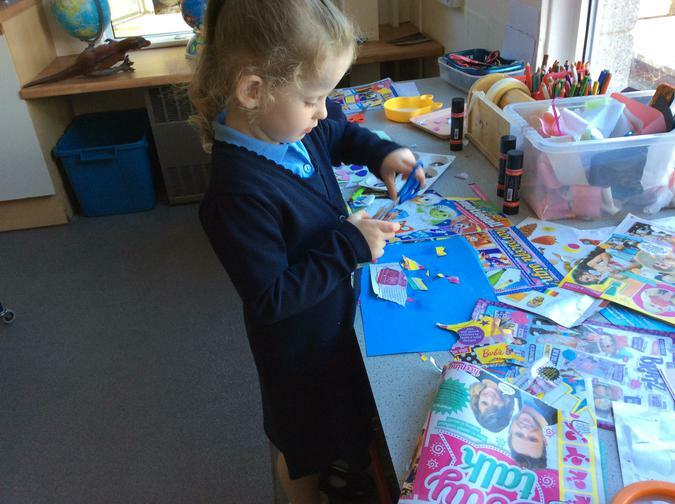 The children have also been making in the creative area, using; glitter, glue, boxes and stickers. 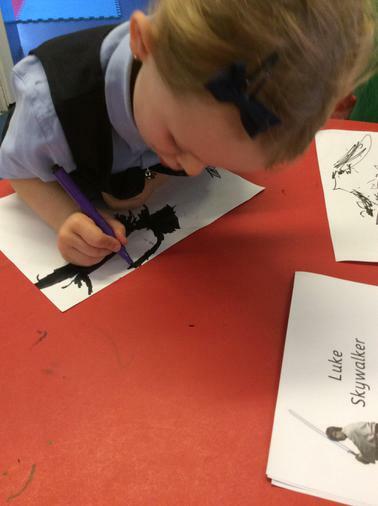 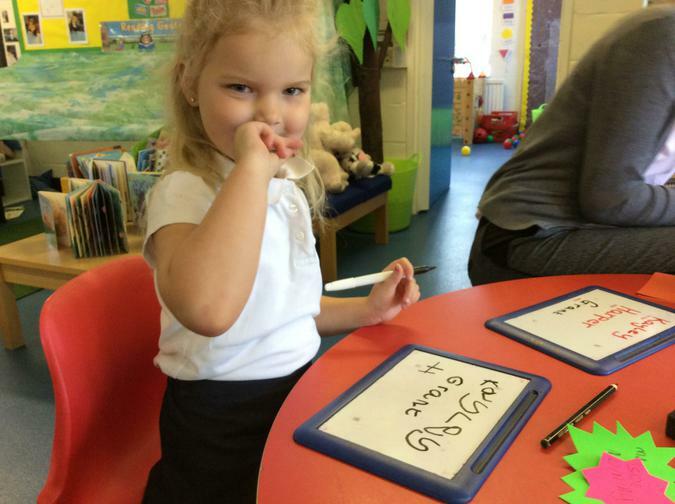 At the the writing table some children were practising their lovely mark making skills.